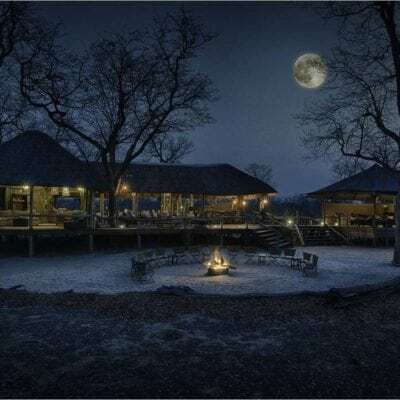 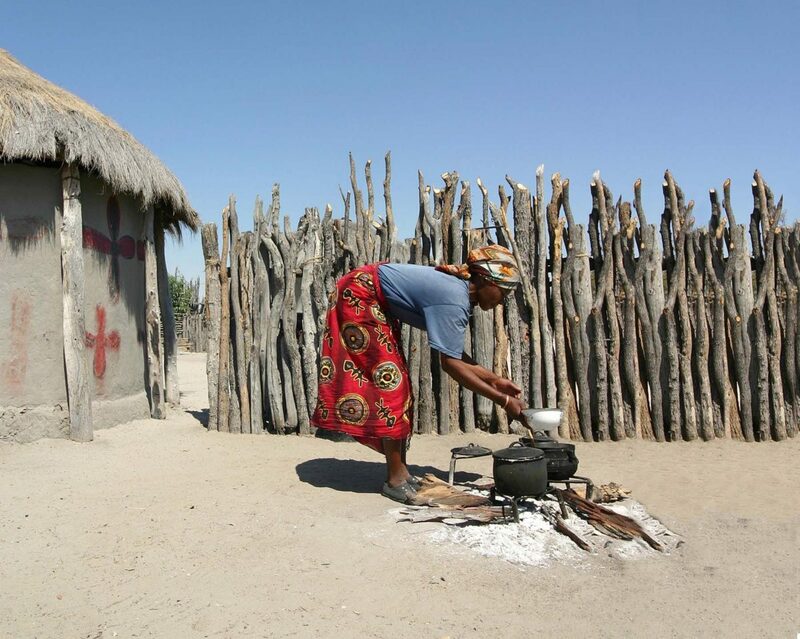 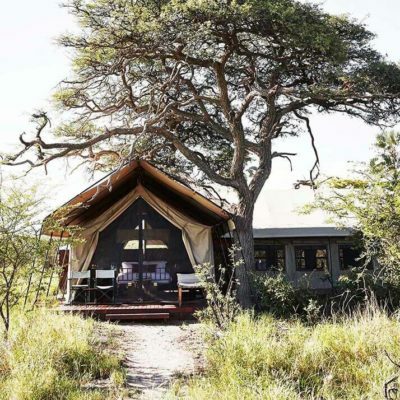 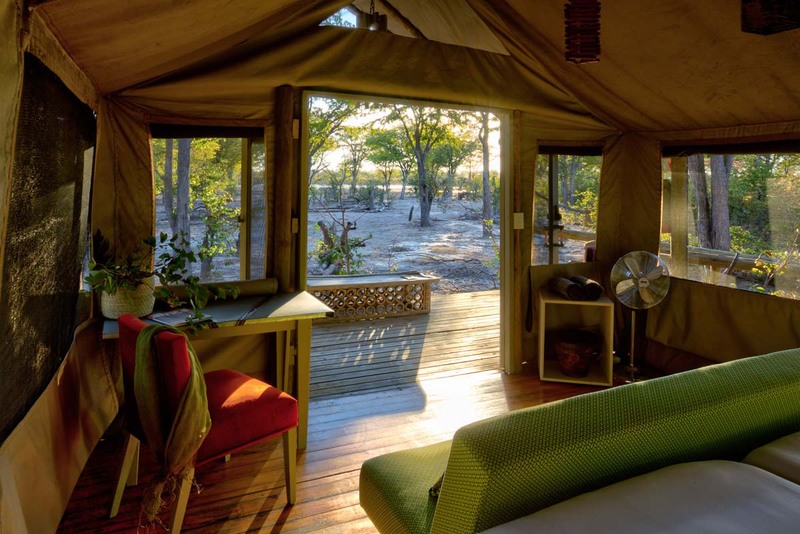 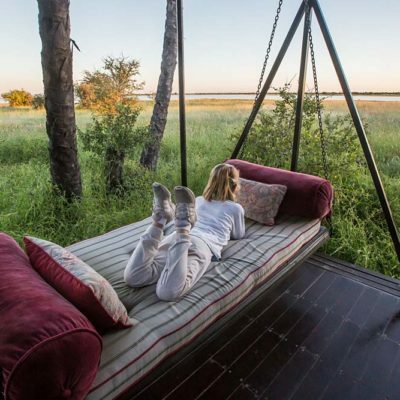 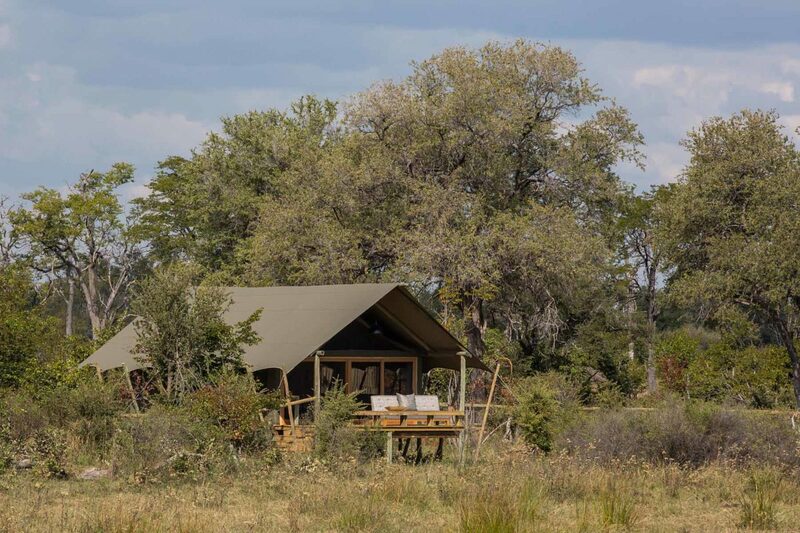 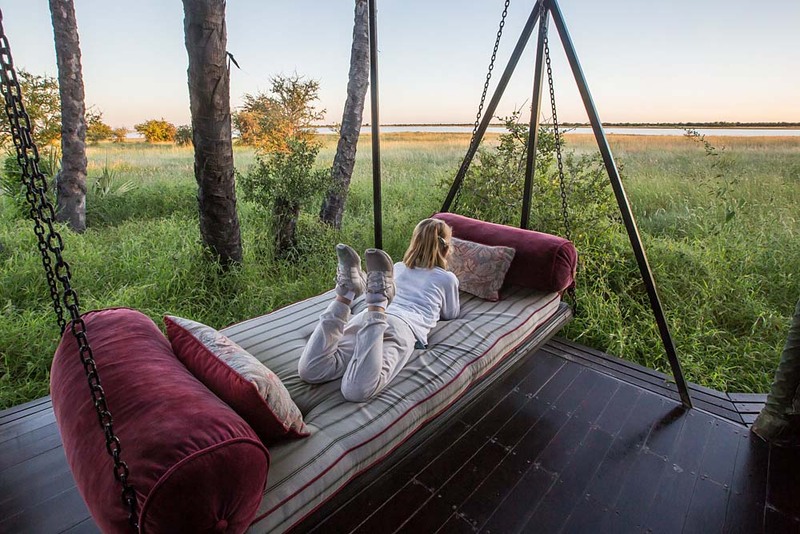 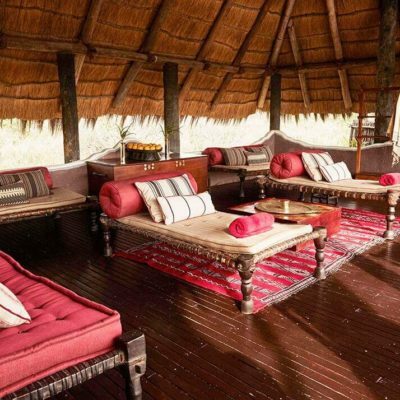 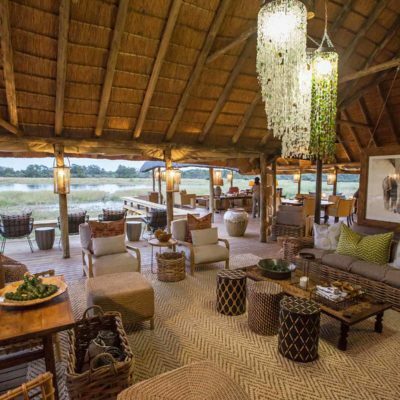 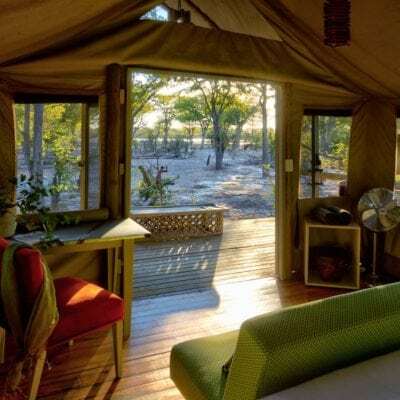 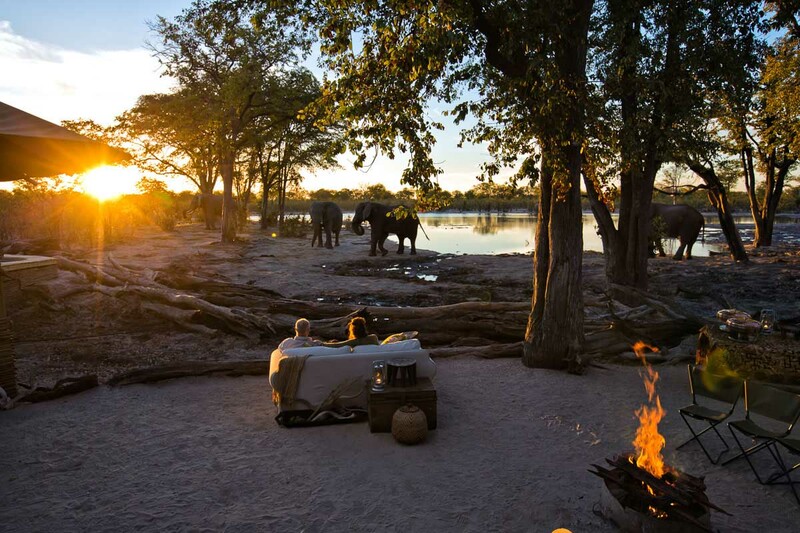 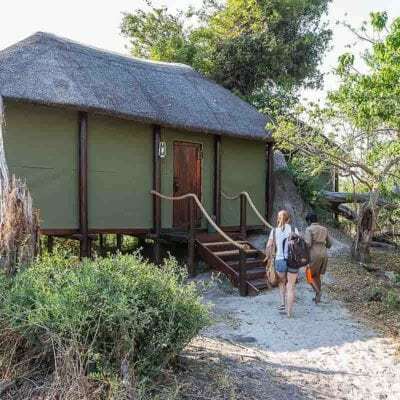 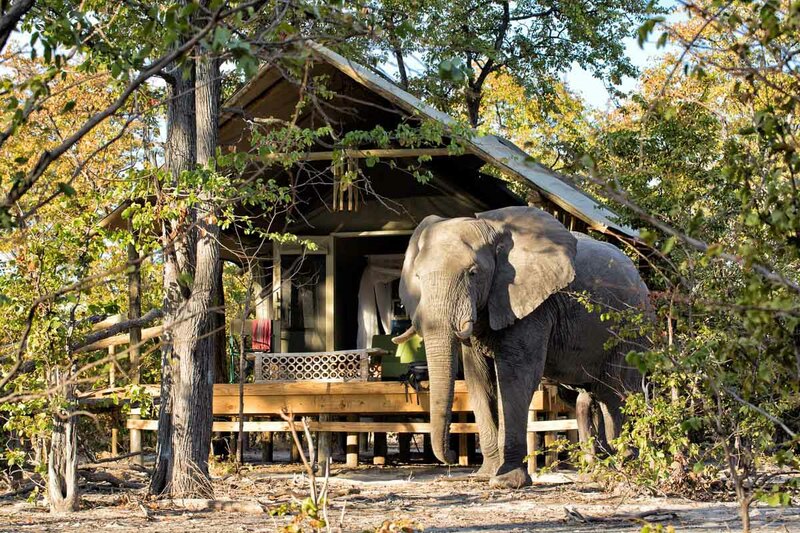 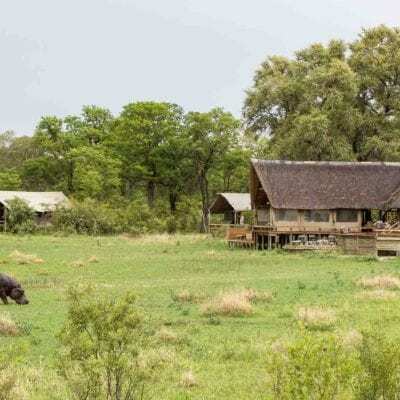 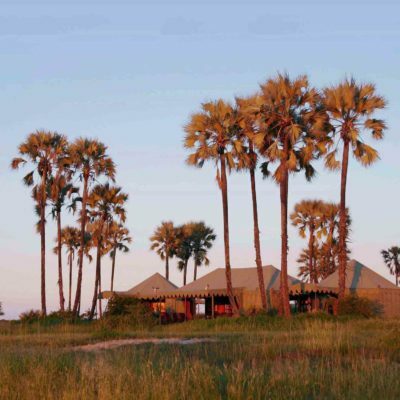 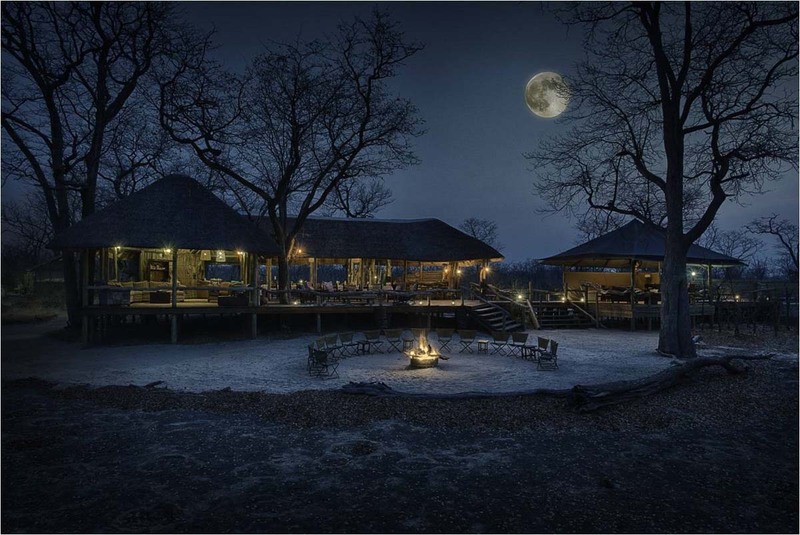 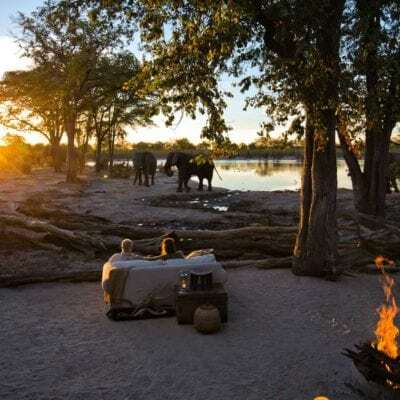 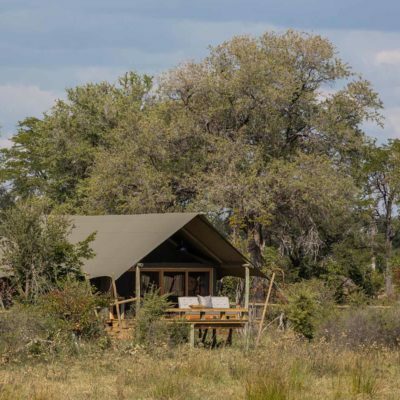 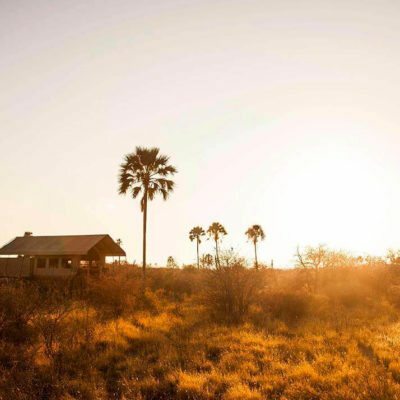 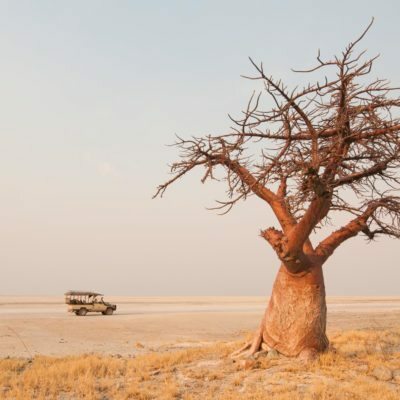 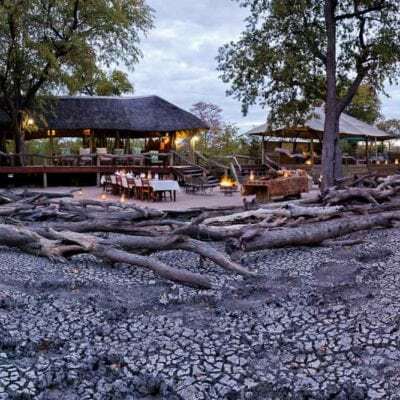 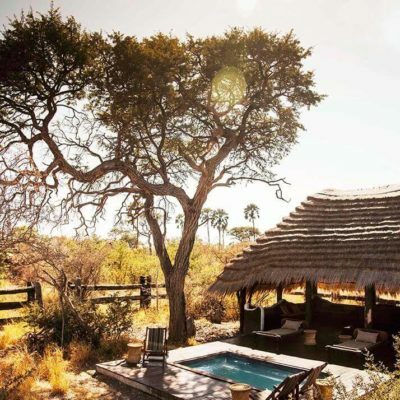 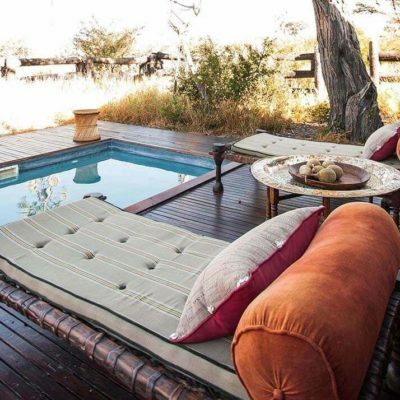 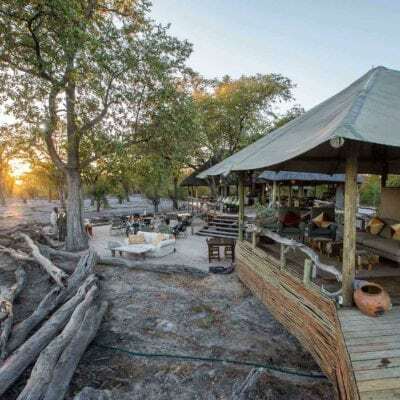 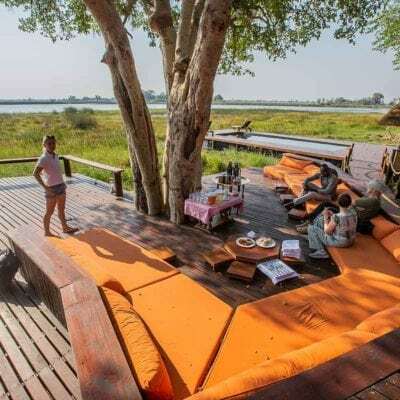 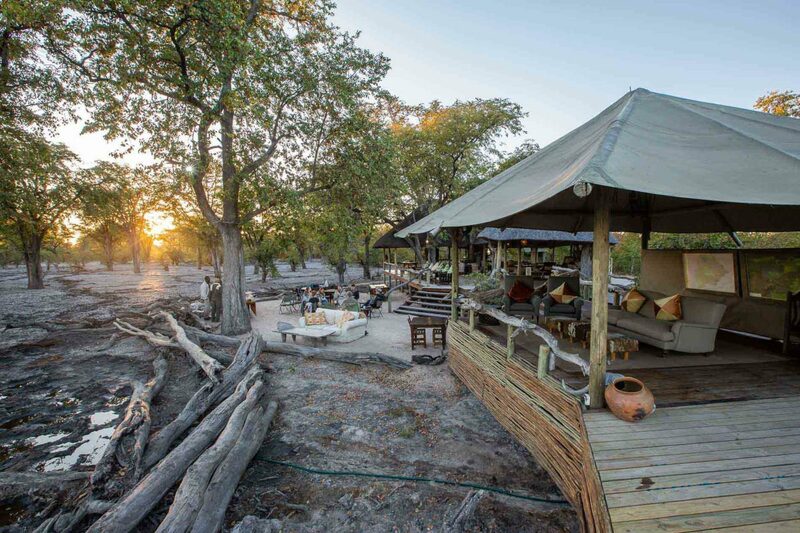 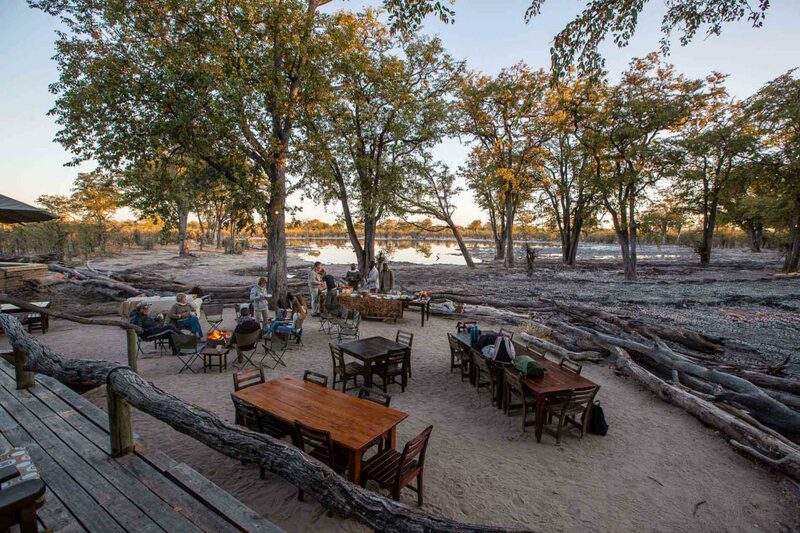 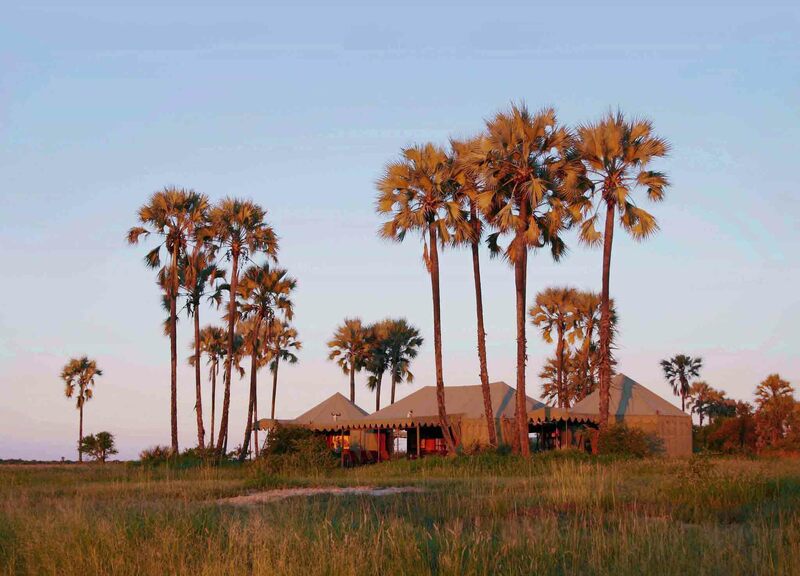 This is a genuine Okavango camp in a great location. 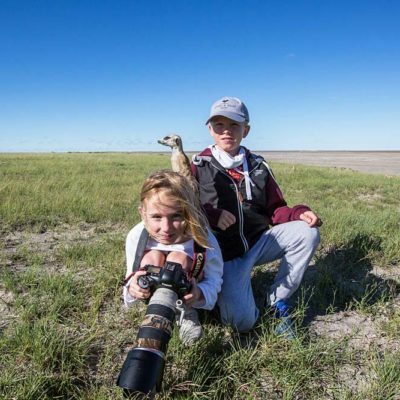 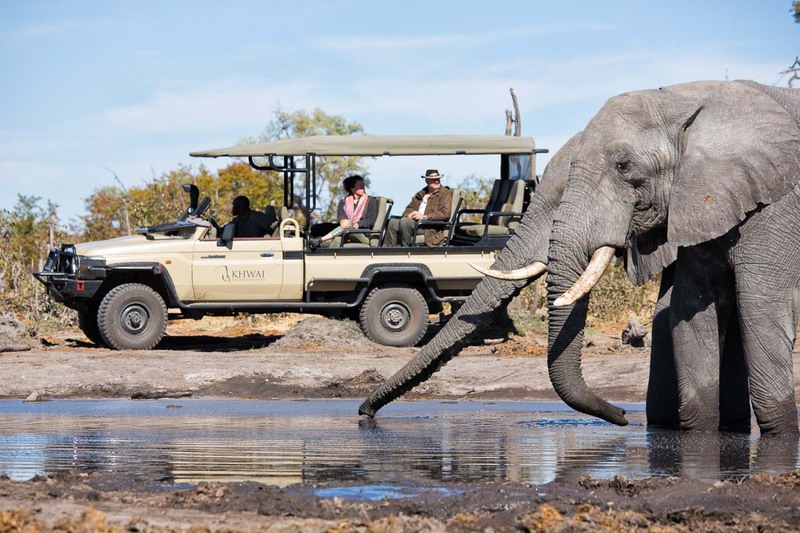 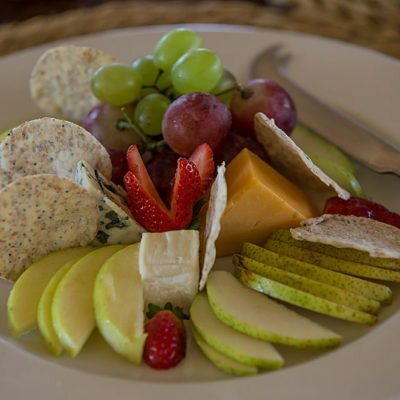 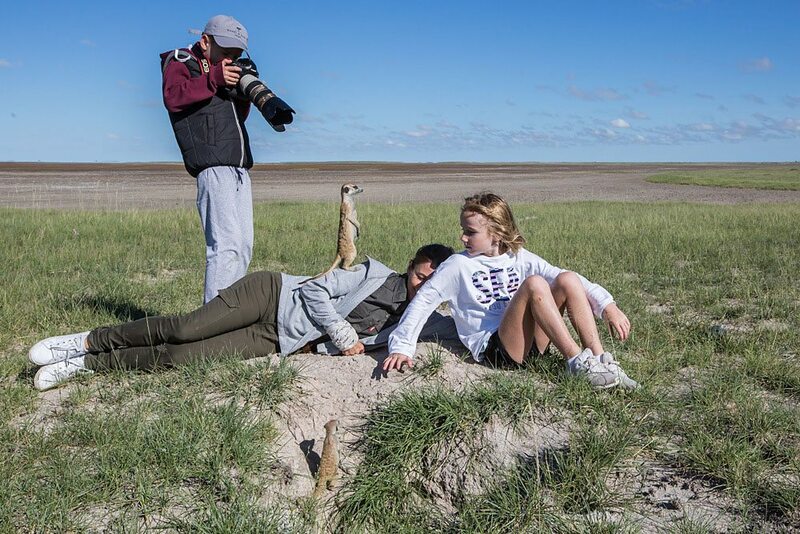 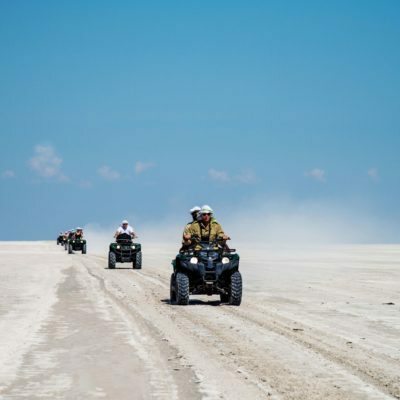 They offer an excellent all-round game viewing experience with quality game drives, boating and mokoro activities. 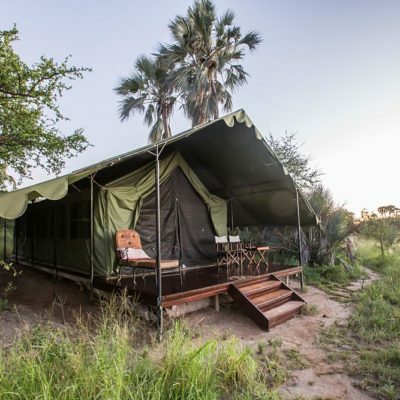 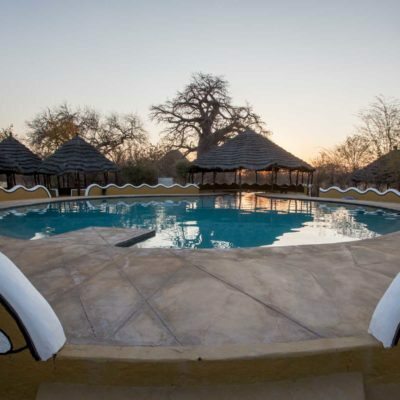 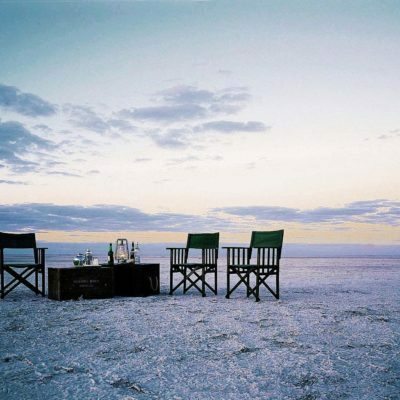 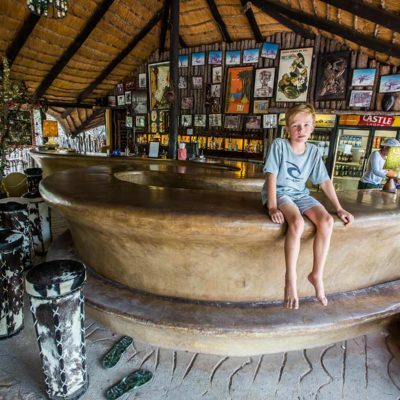 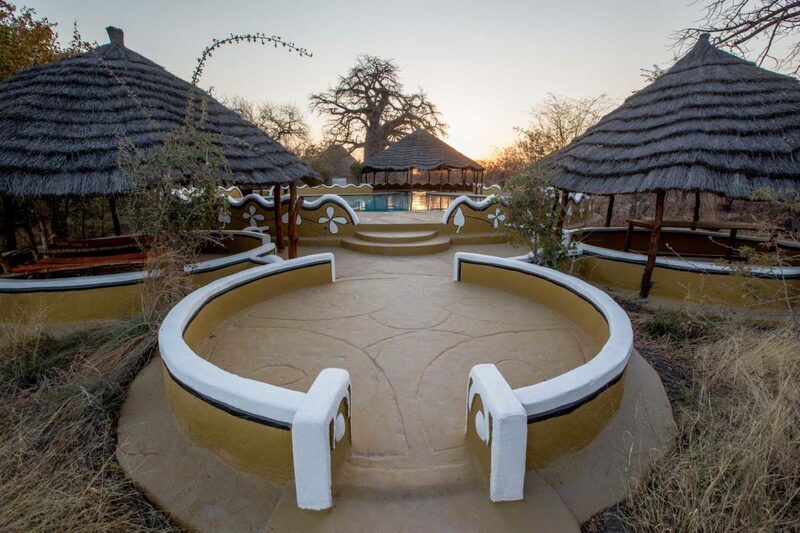 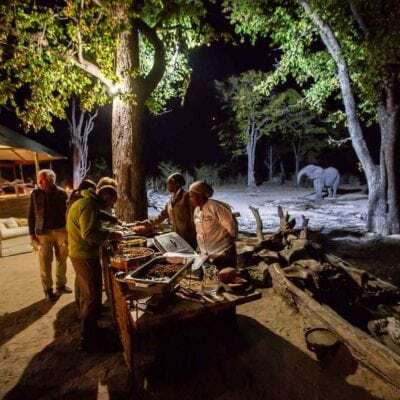 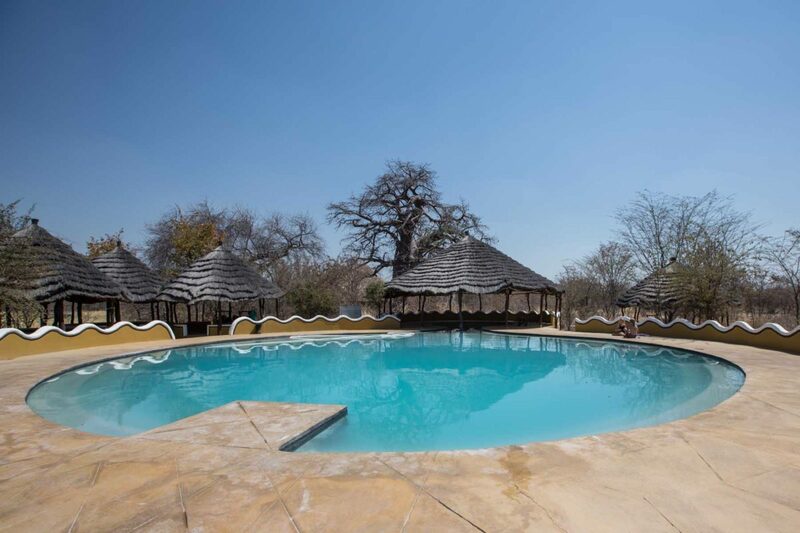 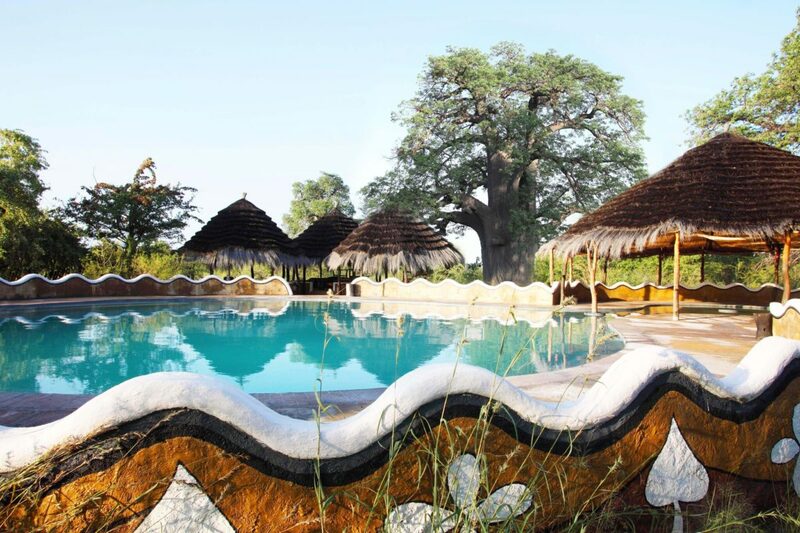 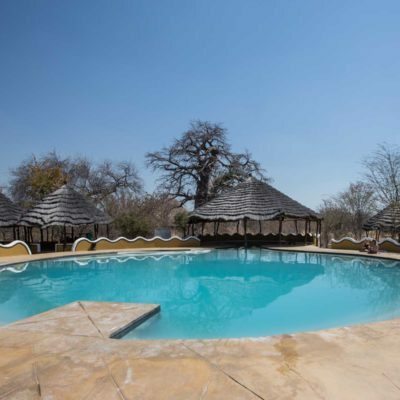 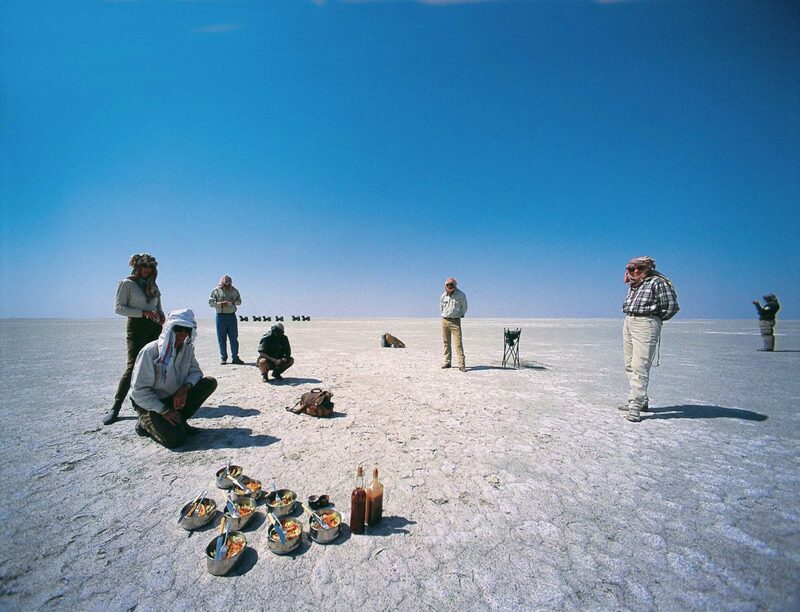 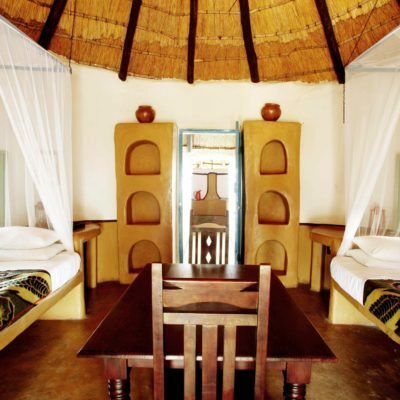 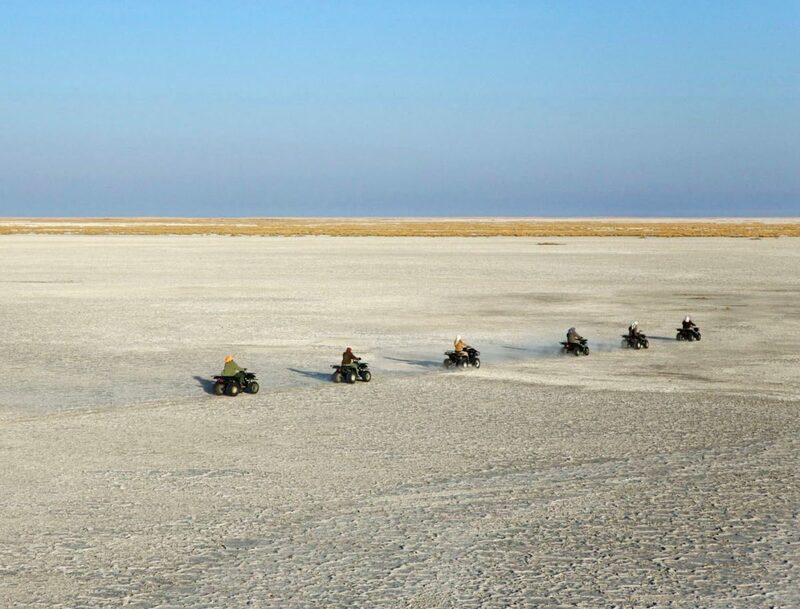 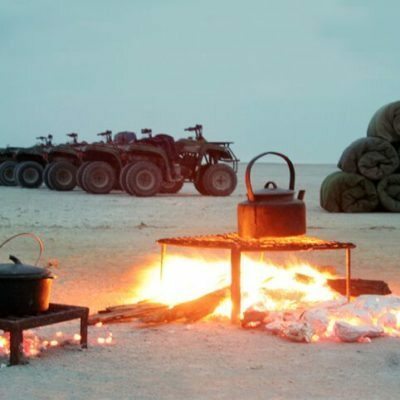 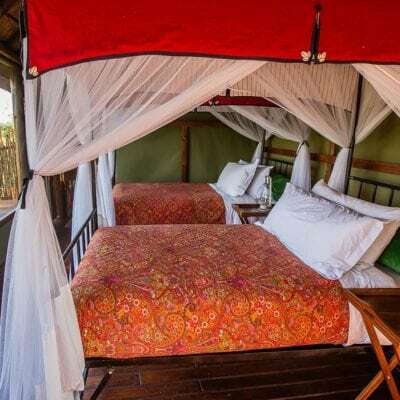 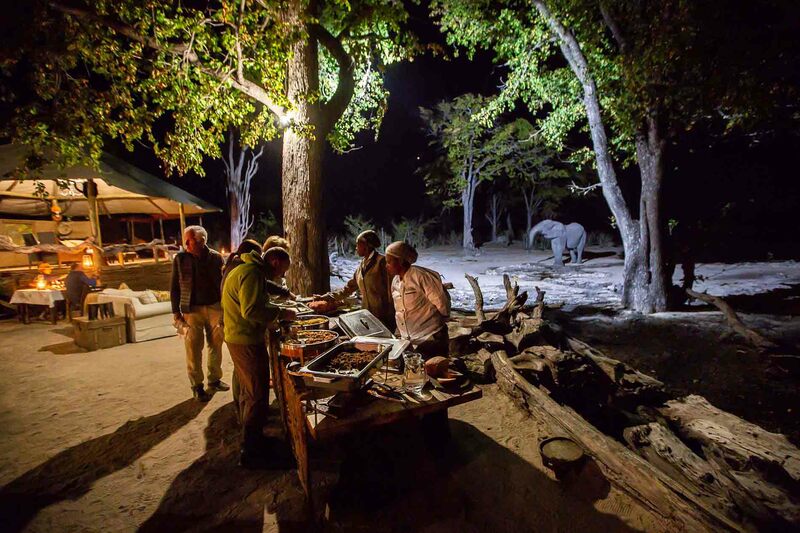 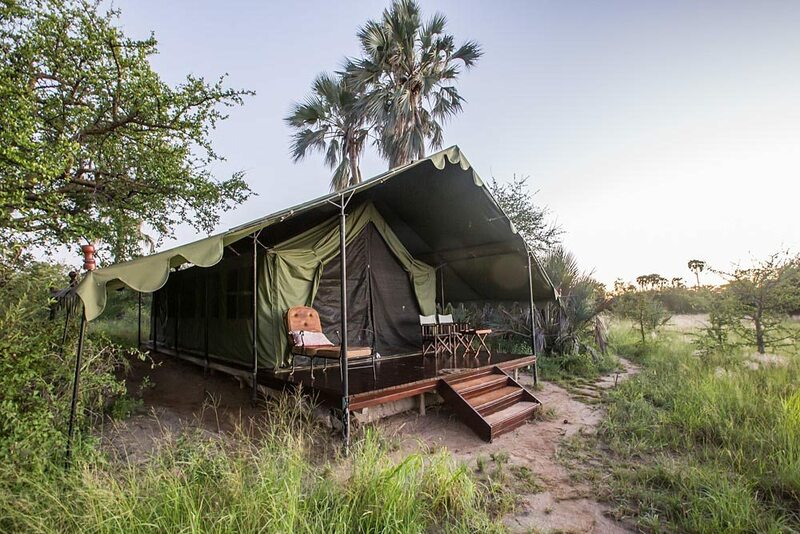 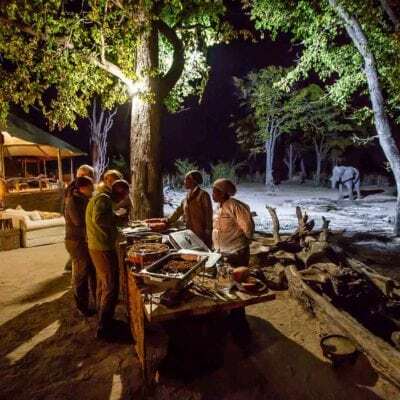 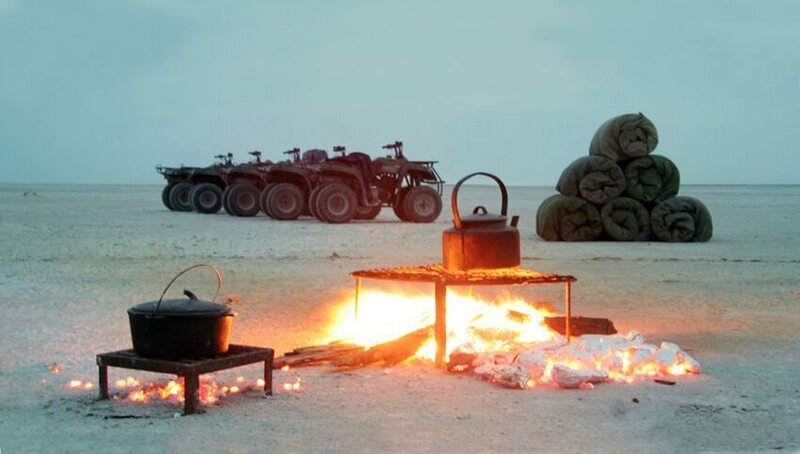 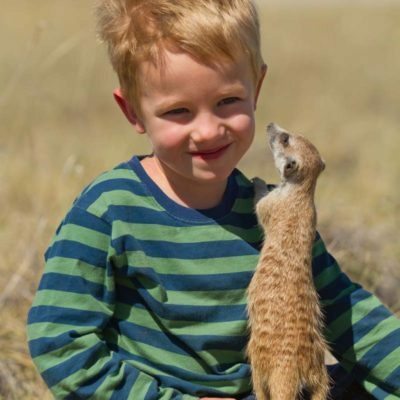 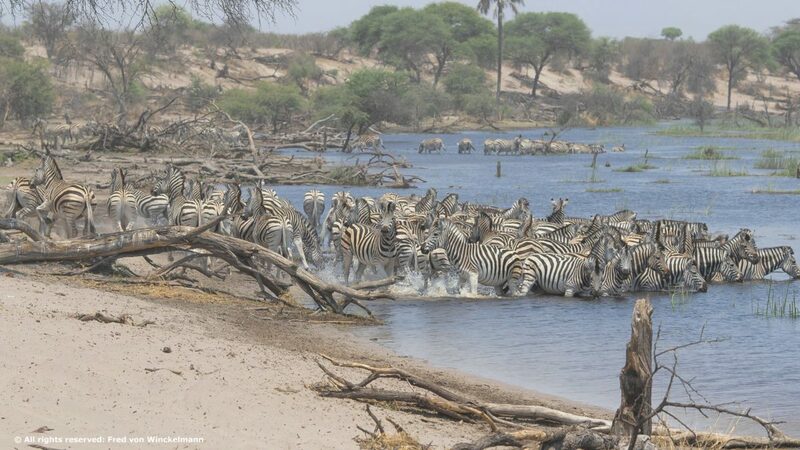 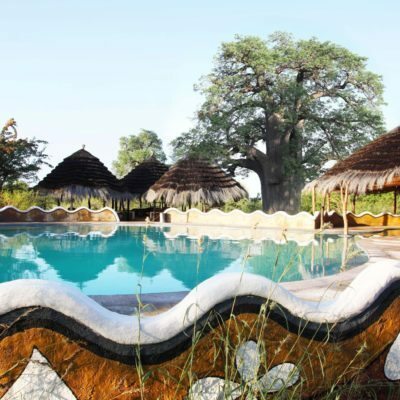 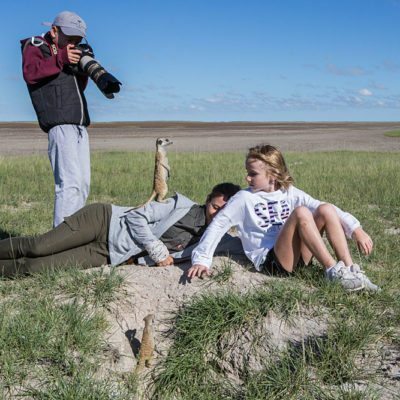 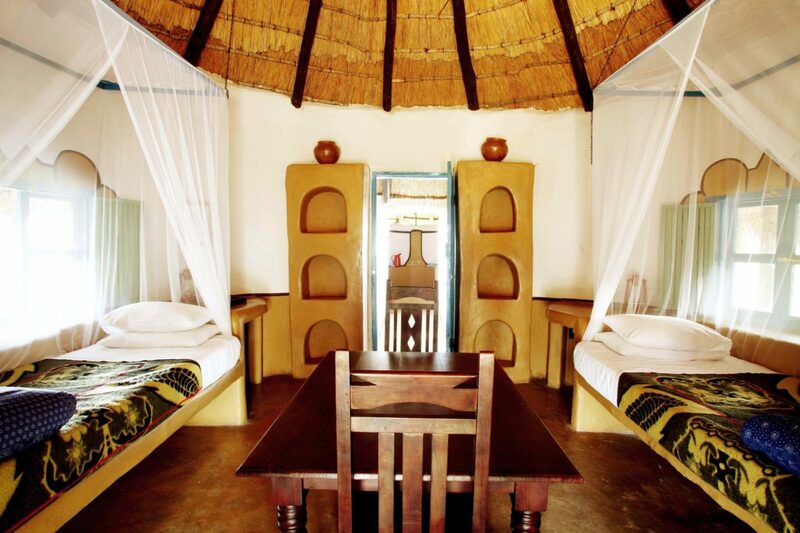 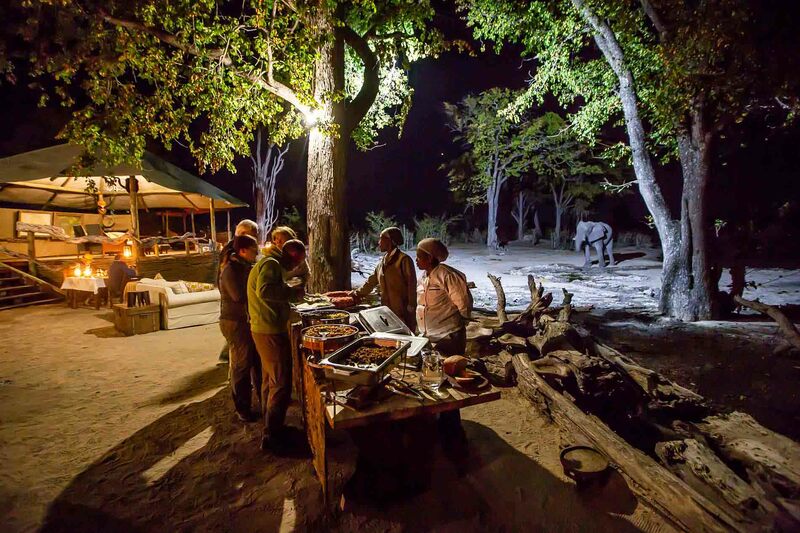 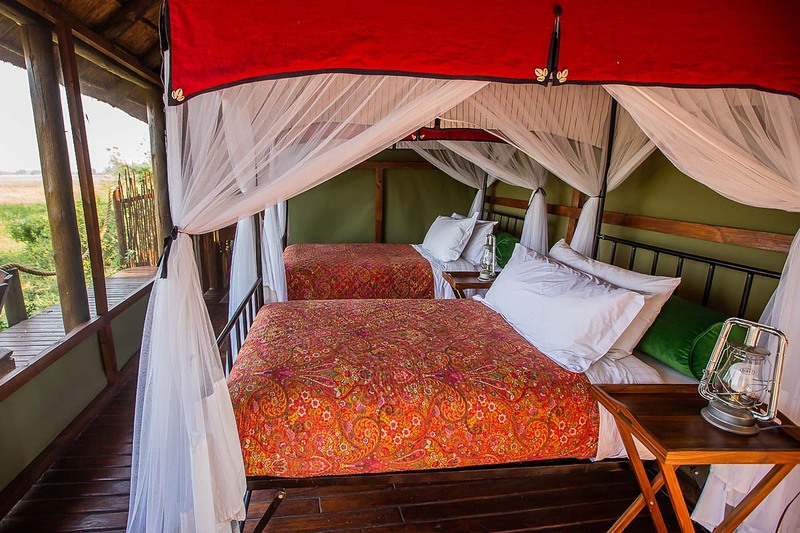 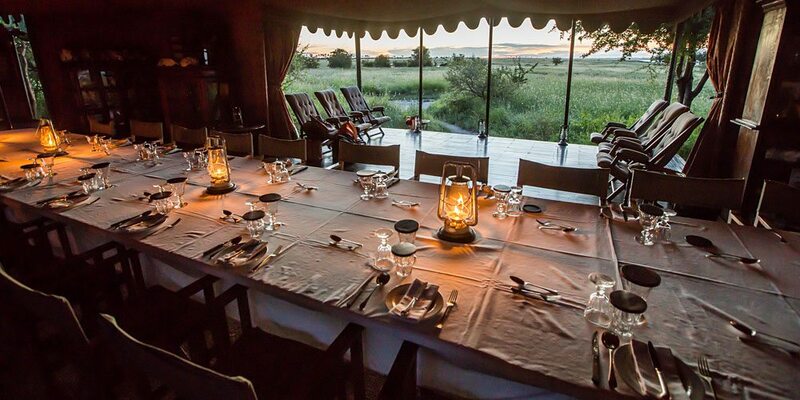 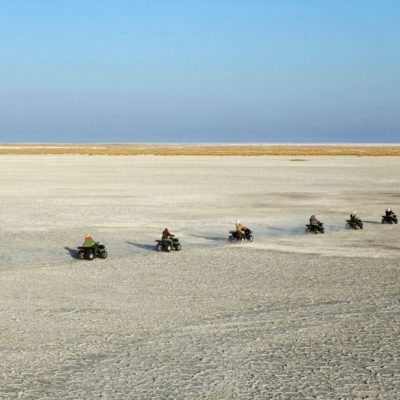 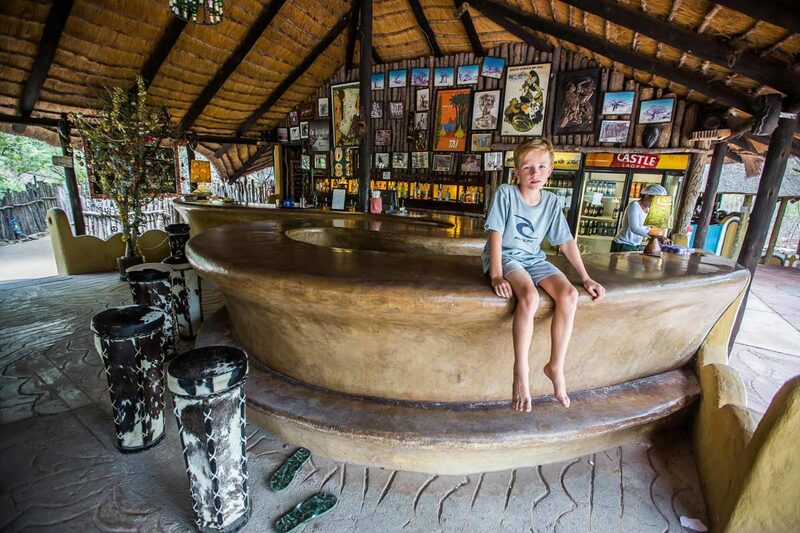 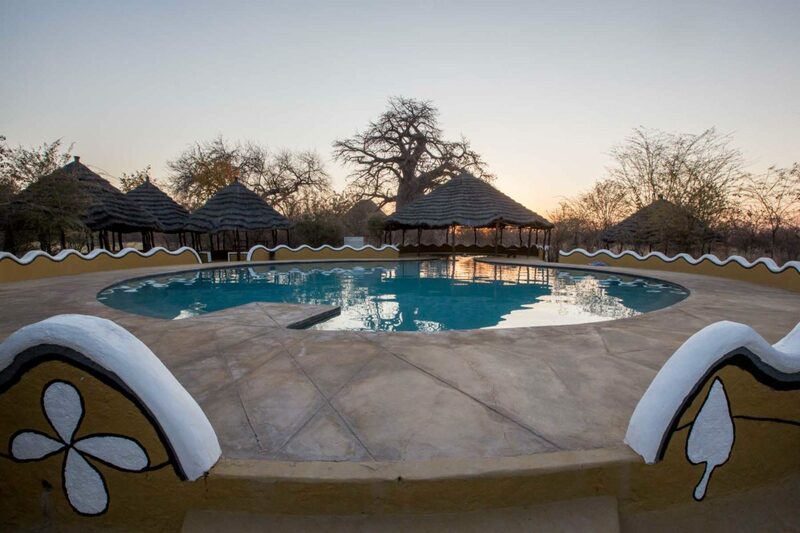 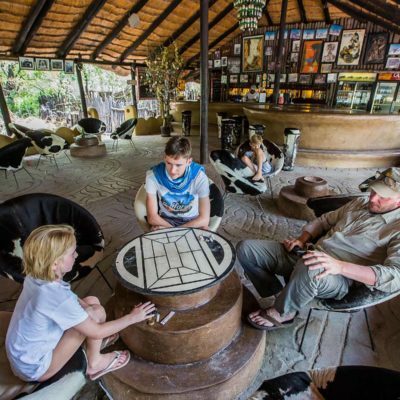 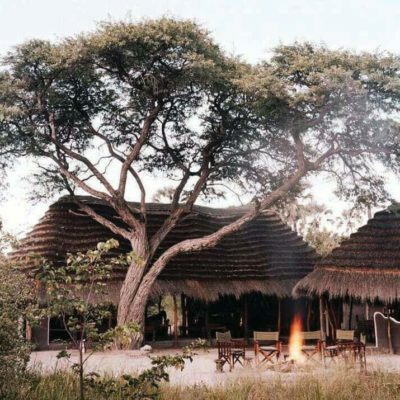 This camp is fairly old but has recently been taken over and revamped by a very experienced safari lodge group. 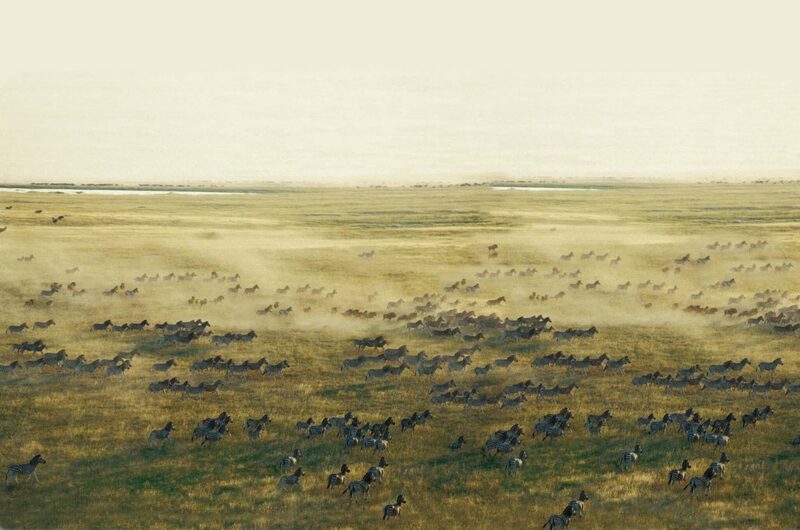 Most people fly into Mapula using the nearby airstrip. 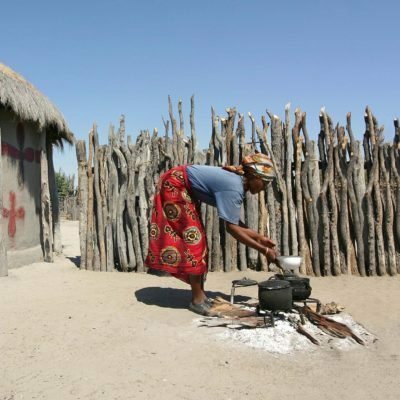 You can fly in from Maun (45 minutes) or Kasane (1+ hour). 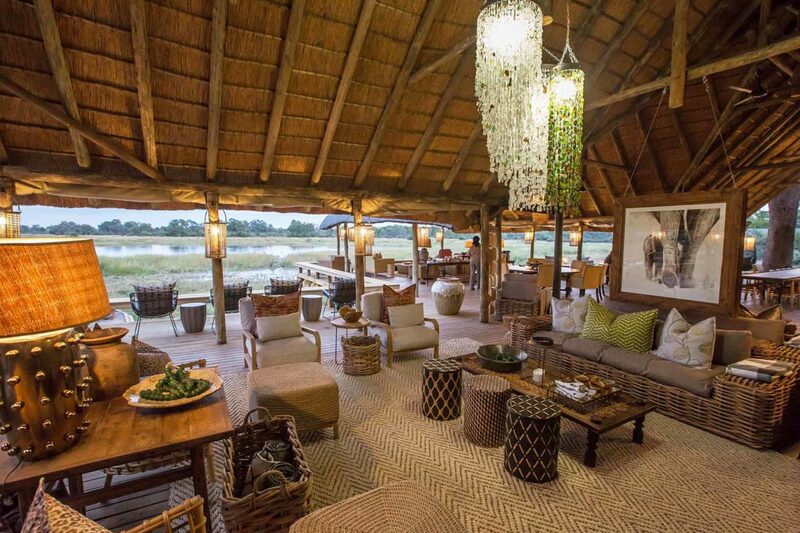 Flying in to this lodge is an event in itself as you get to see most of the Okavango from the air! 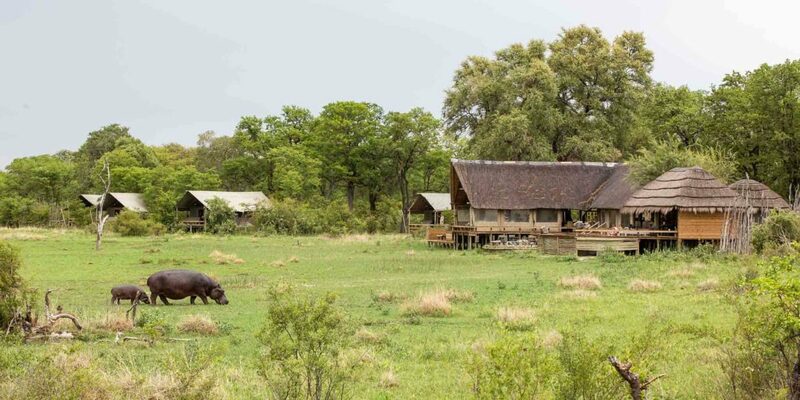 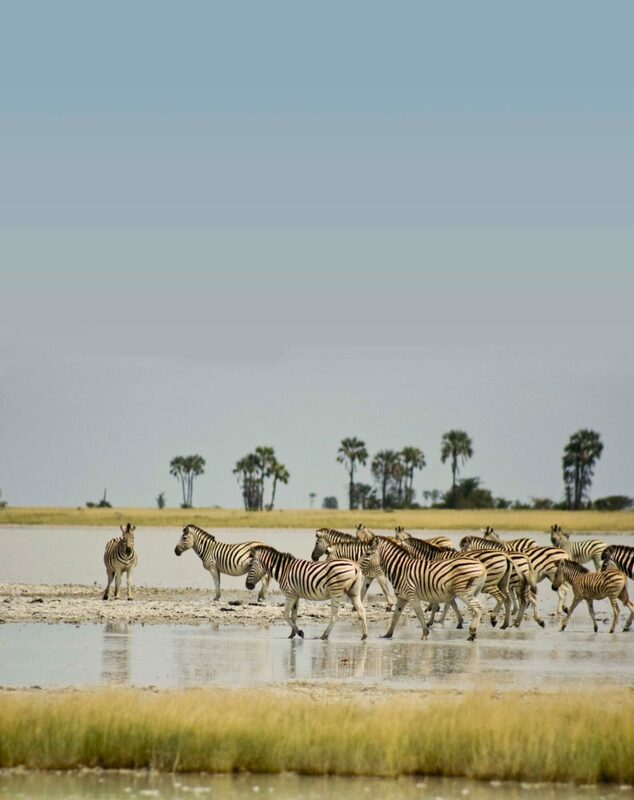 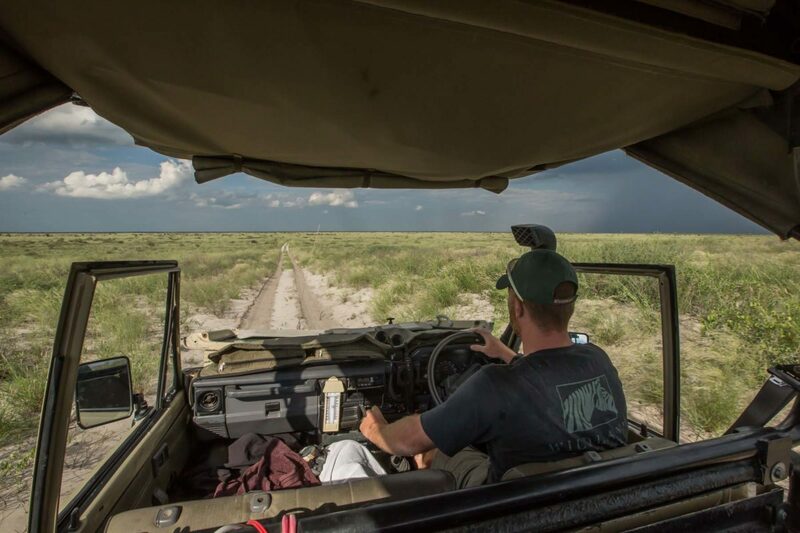 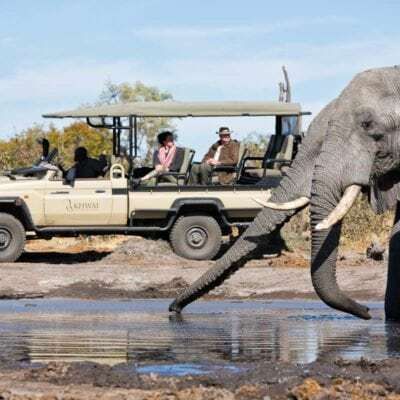 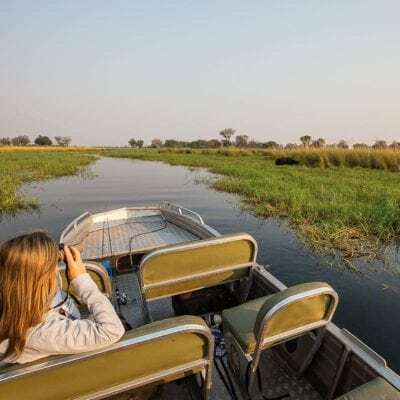 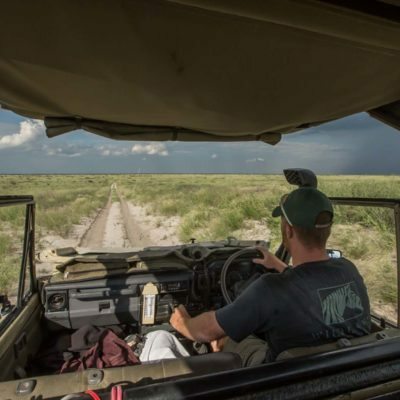 Although located quite close to the “permanent swamp” area of the delta, this camp offers genuine game drives in perfect Okavango habitat year round – there is a dry land mass close enough to camp to allow some of the big game to be resident all year, even during high floods. 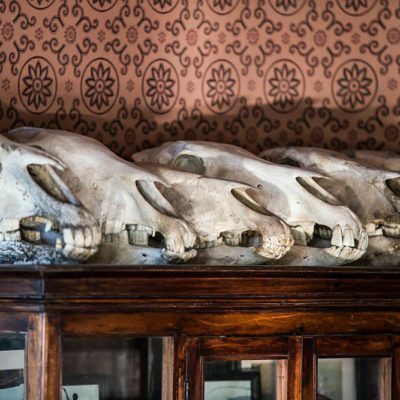 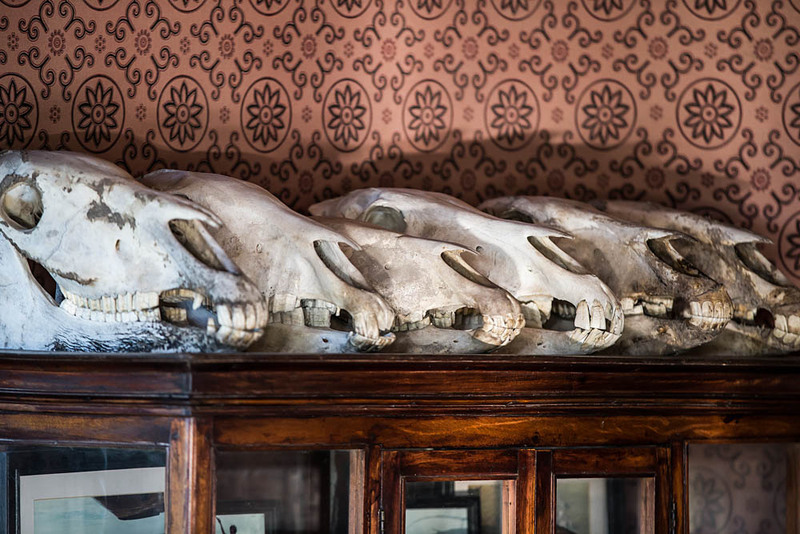 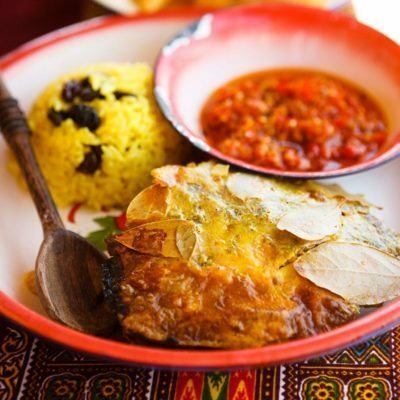 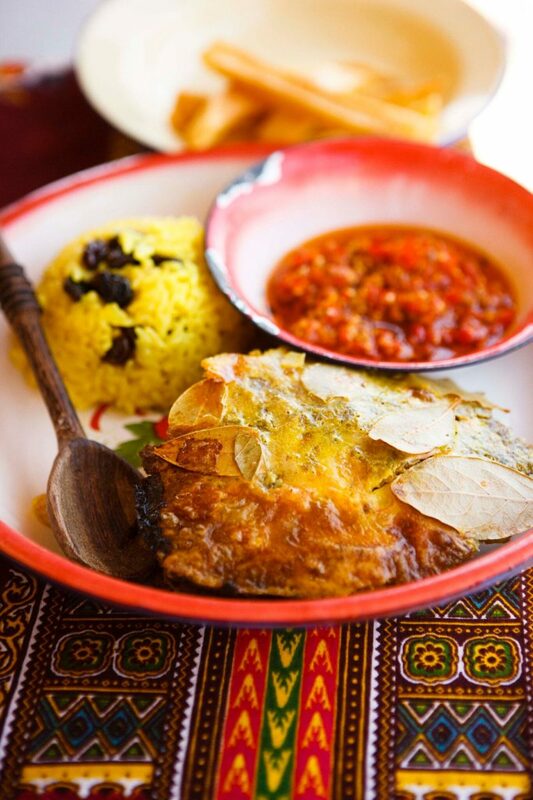 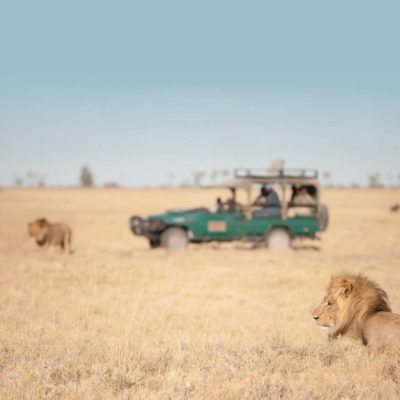 Lion, wild dog, cheetah and leopard can all be found here. 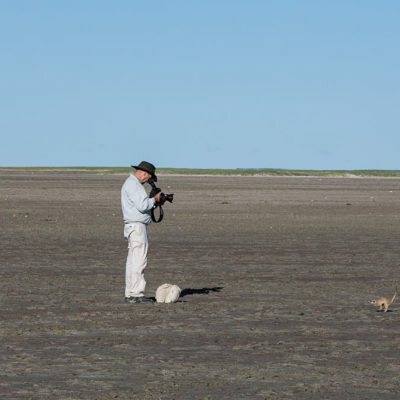 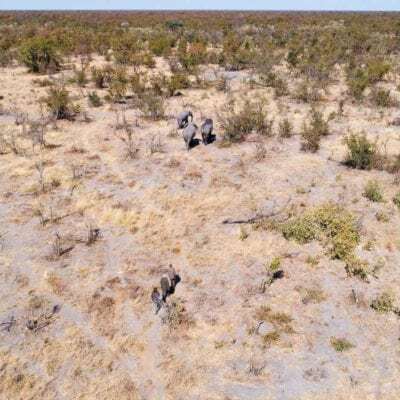 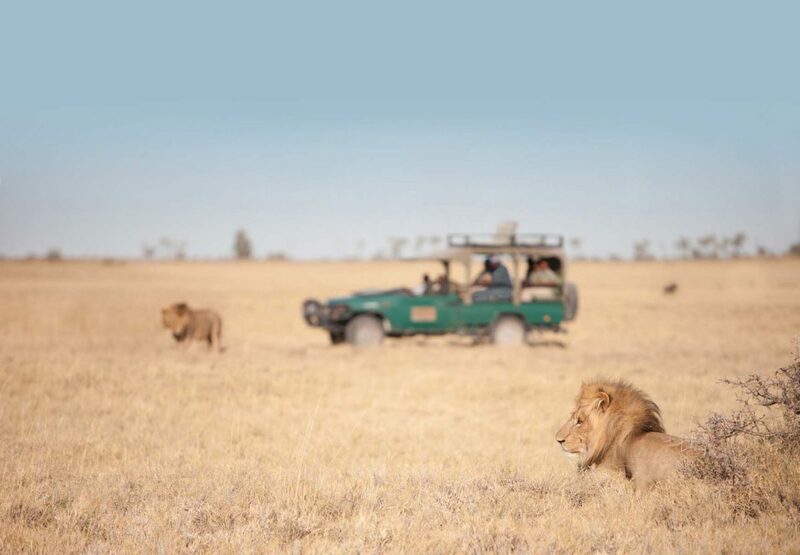 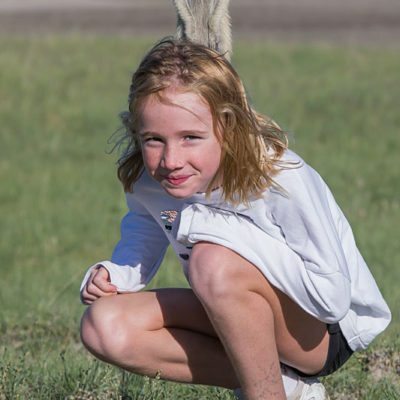 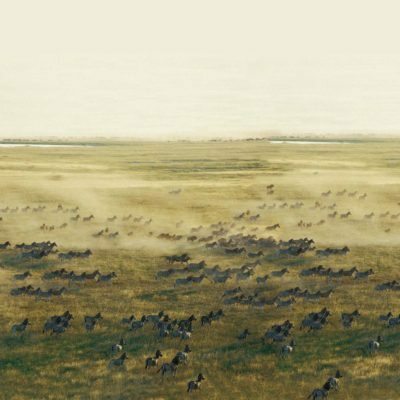 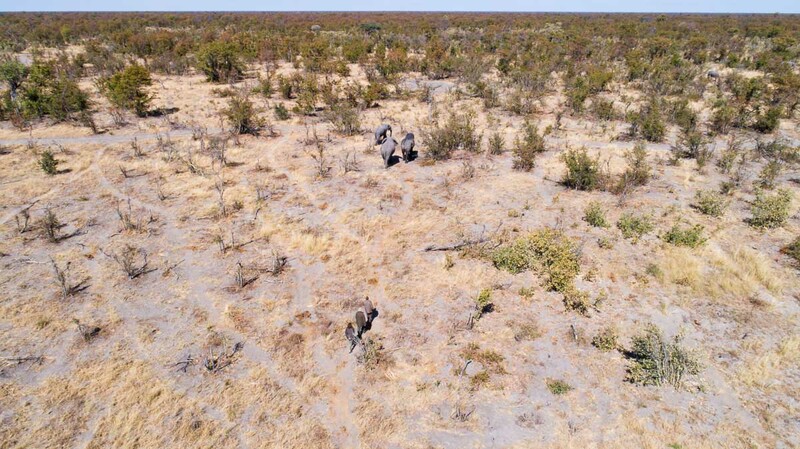 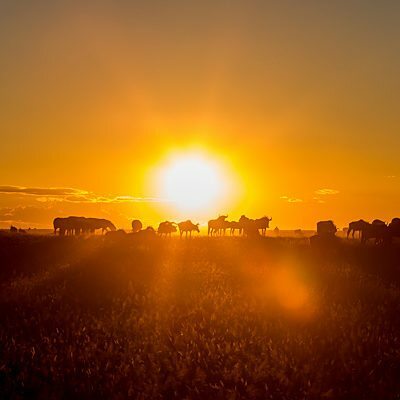 The chances of lion and buffalo interaction are good – Mapula is located on the border of the Duba concession which is famous for this behaviour! 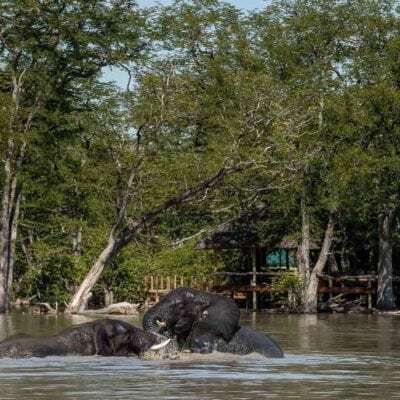 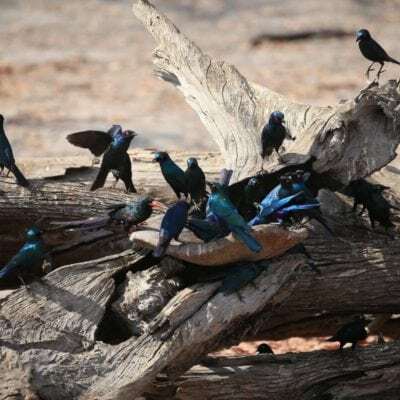 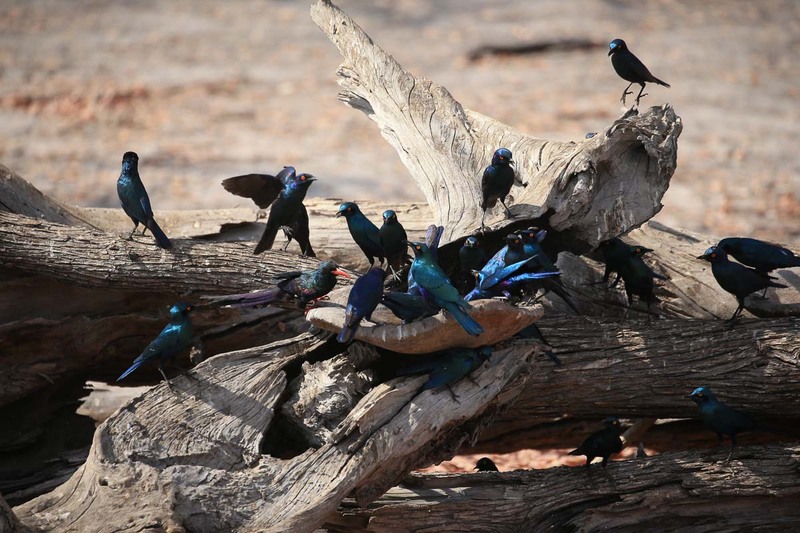 The area is popular with elephants and the birding is excellent because of the variety of habitats, including riverine forest. 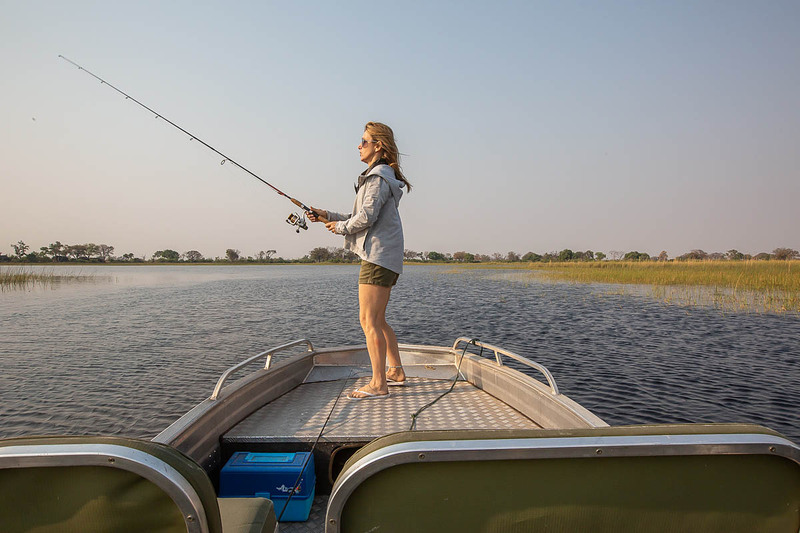 The channels flood here by April most years and provide water deep enough for boating until around September or October. 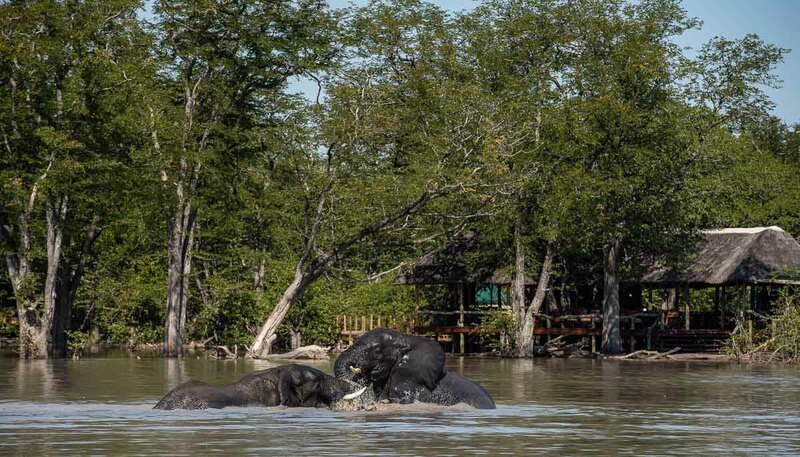 There are huge variations in the timing of this flood, so do not count on always being able to boat. 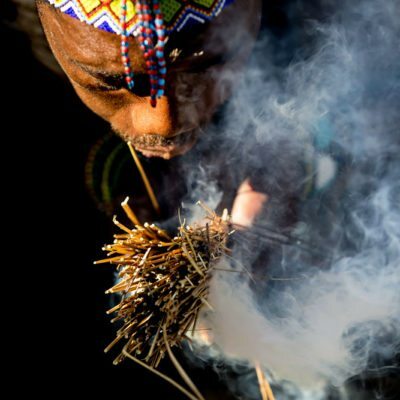 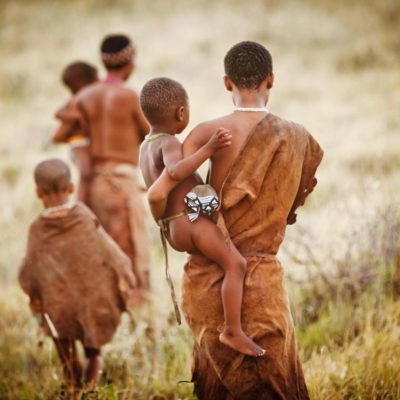 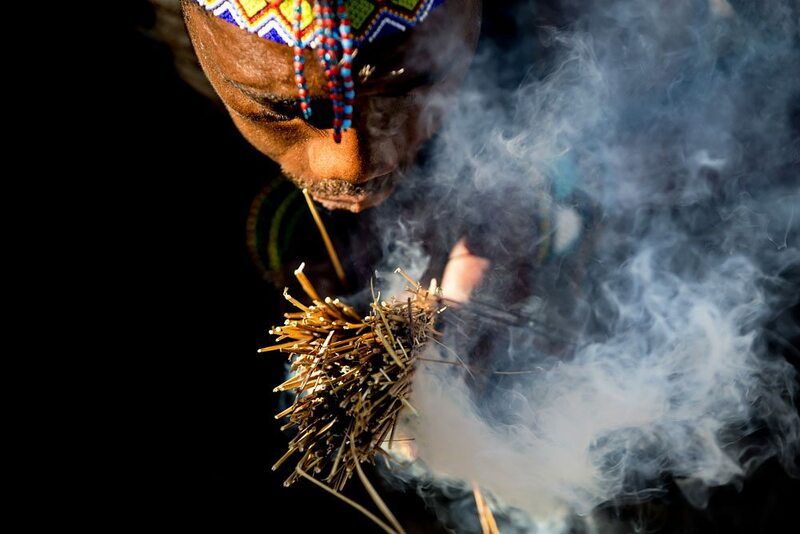 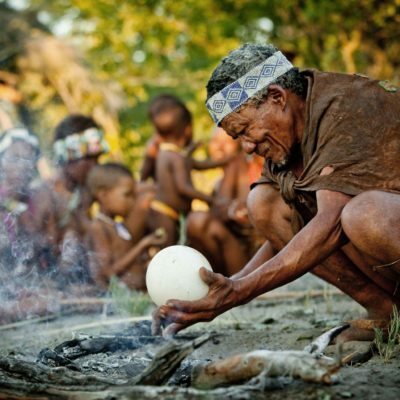 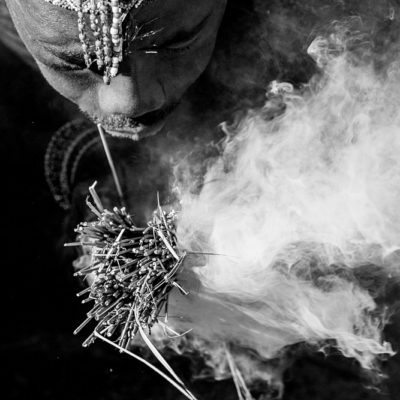 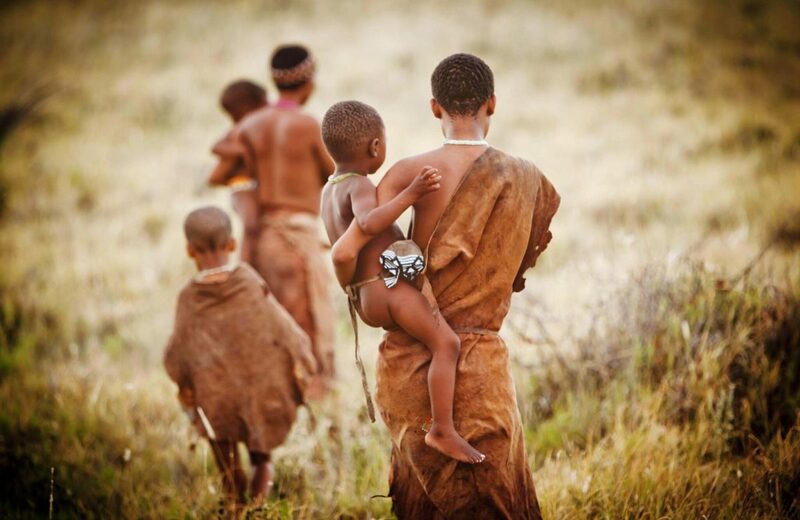 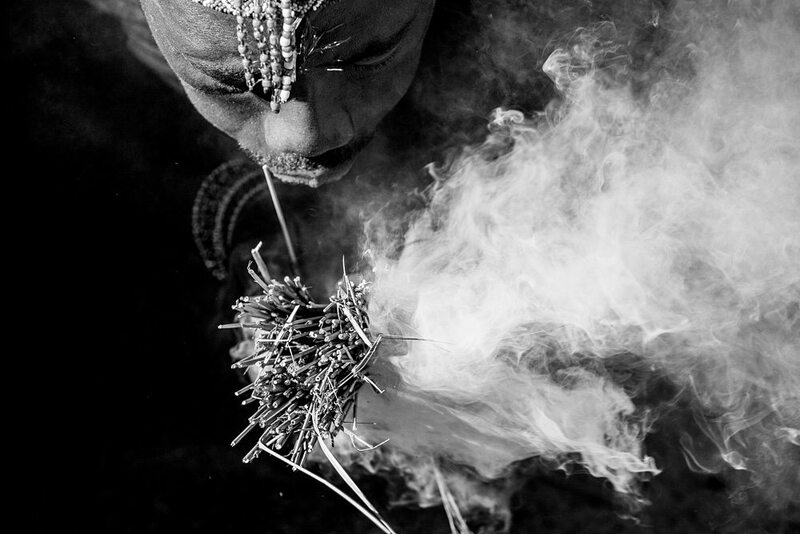 The mokoro activities however, do continue much further into the year. 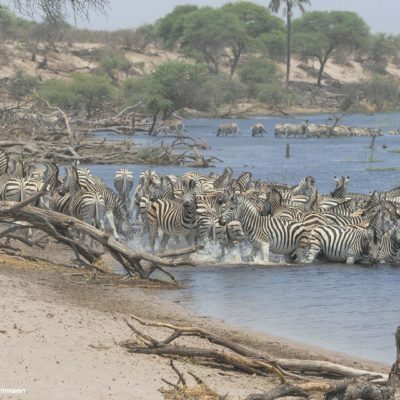 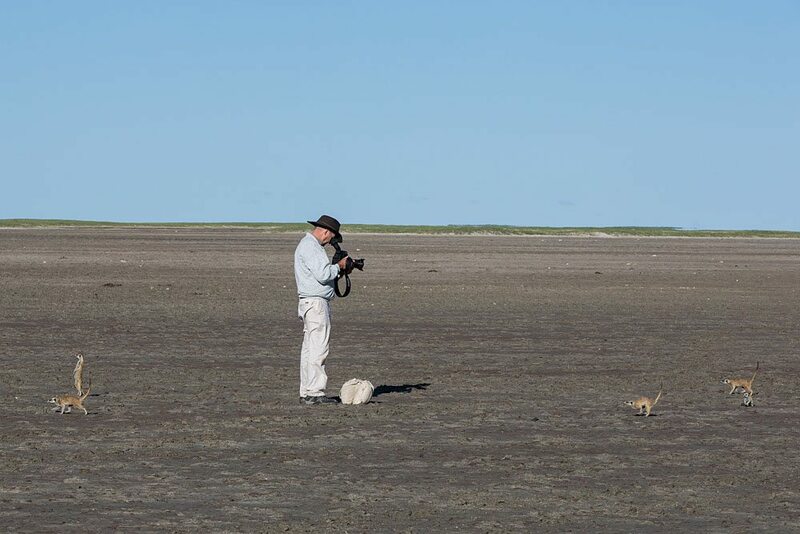 Note that there is a small chance of seeing cattle in the area when water levels drop, although Mapula is far enough away from villages that this is not very common. 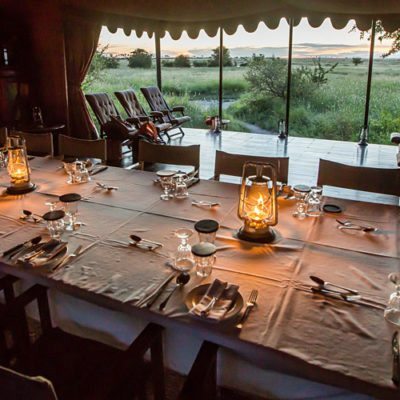 There is another safari camp nearby that does offer a ballooning activity – please ask us for details as this can also be done if you stay at Mapula. 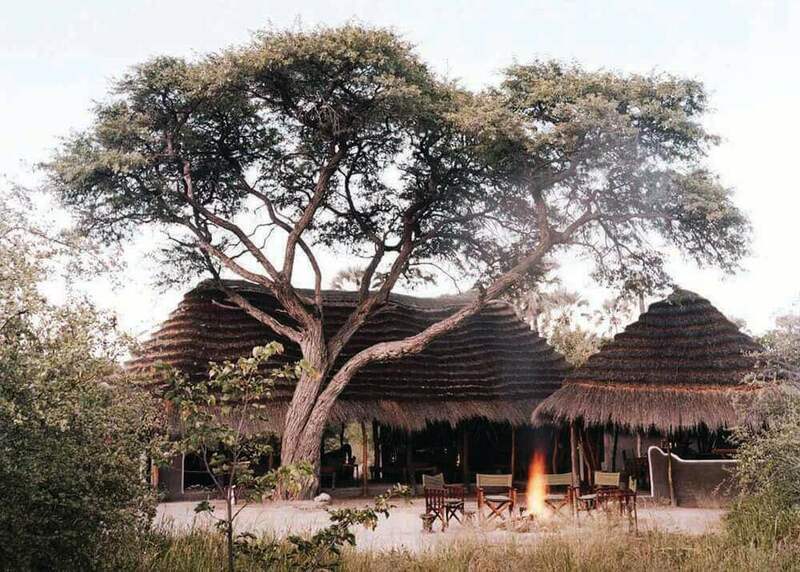 As mentioned, Mapula is an older camp that was not well looked after while the owners looked for a buyer. 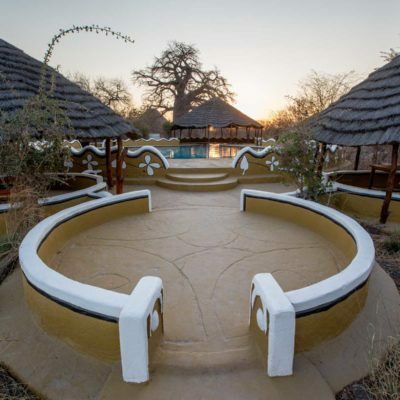 Fortunately, a company called Unchartered Africa (now fall under Natural Selection Safaris) bought the property and invested to restore it. 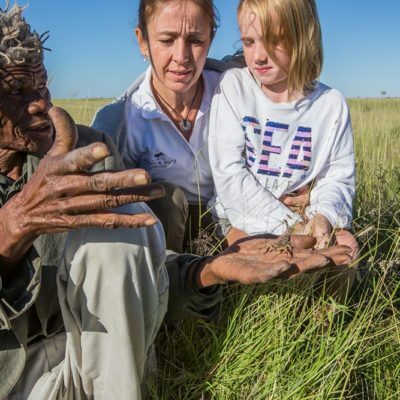 The results are fantastic! It was not a complete rebuild mind, as they retained the main wooden structures, trucked out some old brick and concrete (replaced with canvas) and revitalised the interiors. 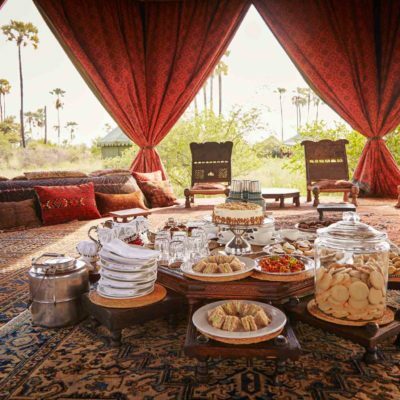 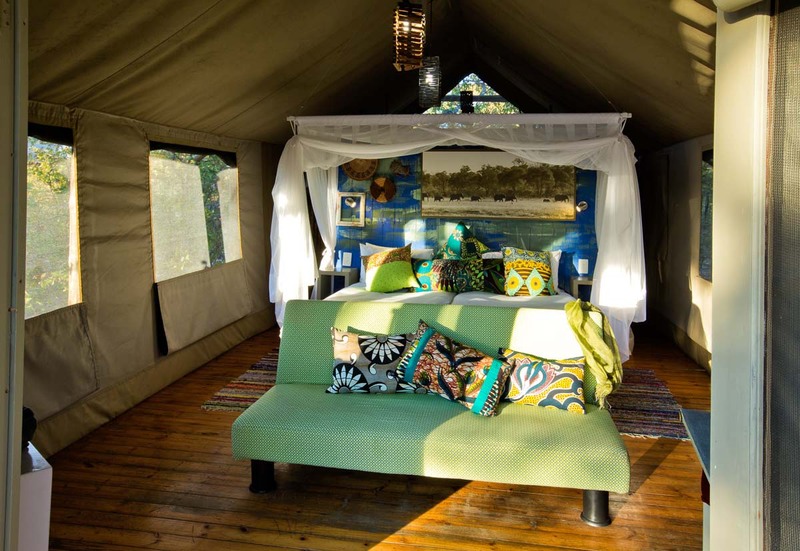 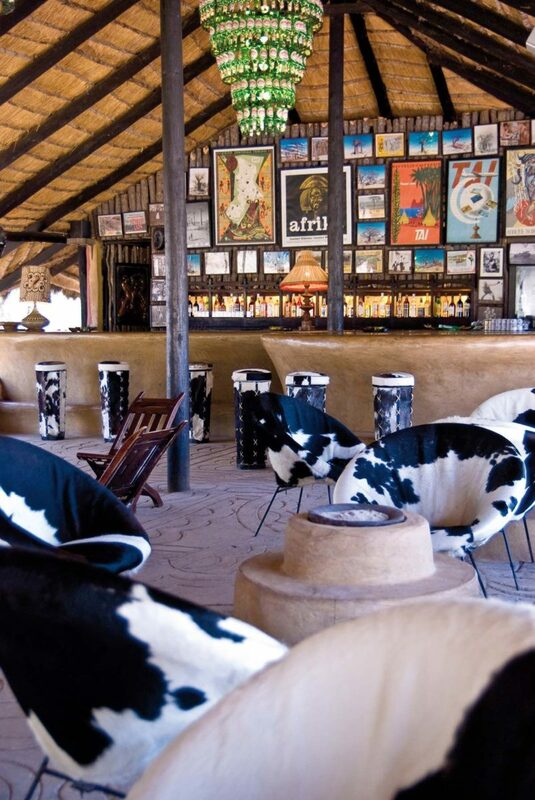 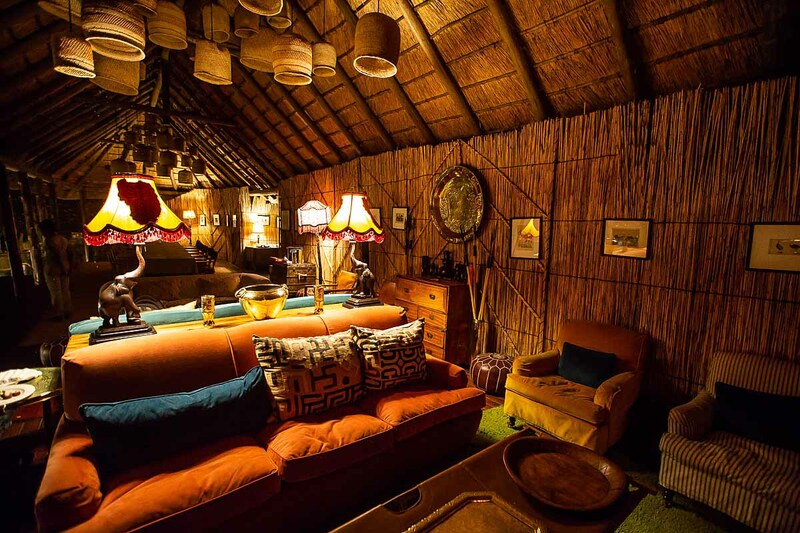 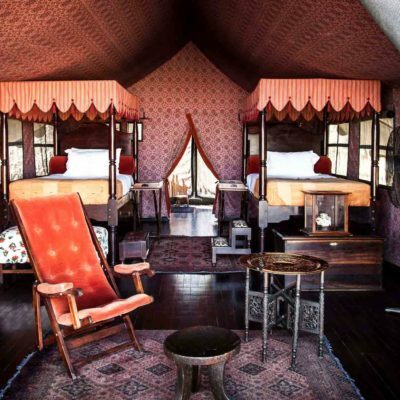 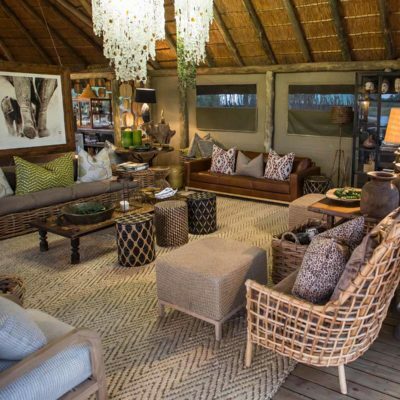 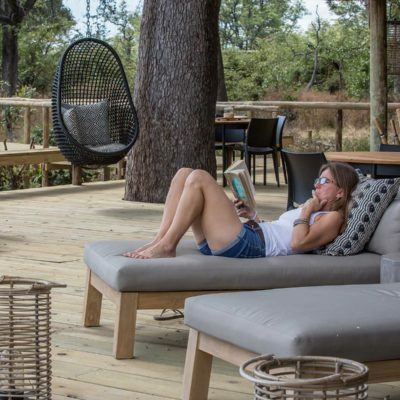 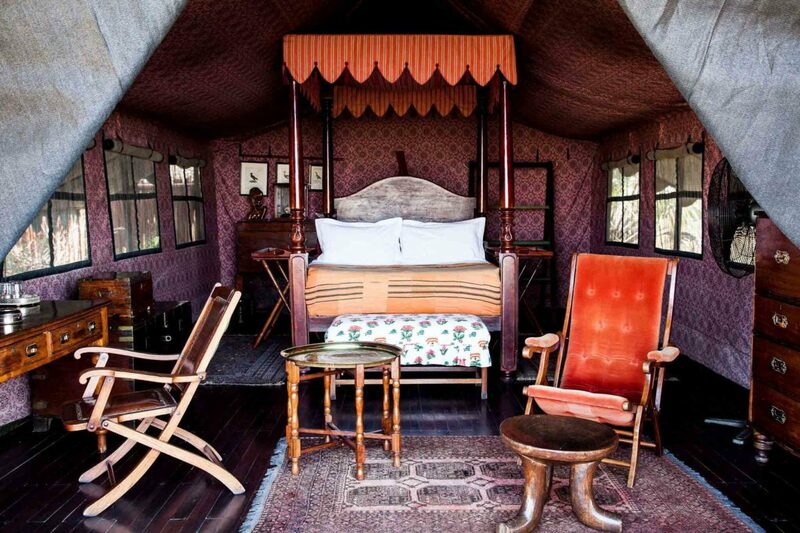 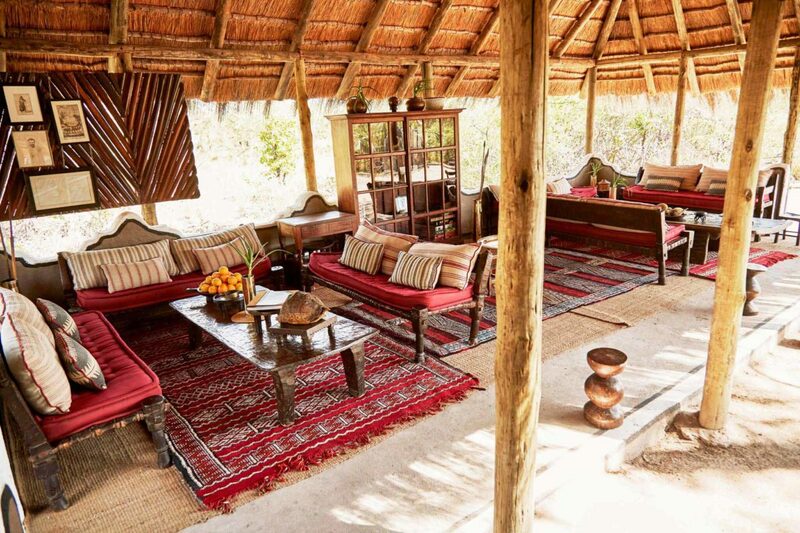 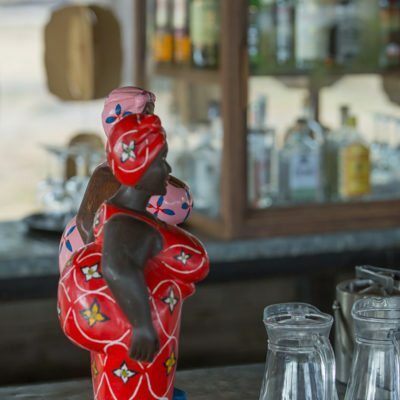 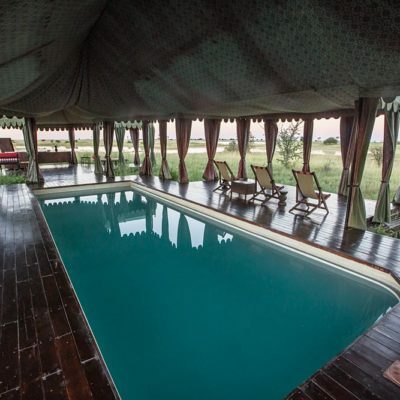 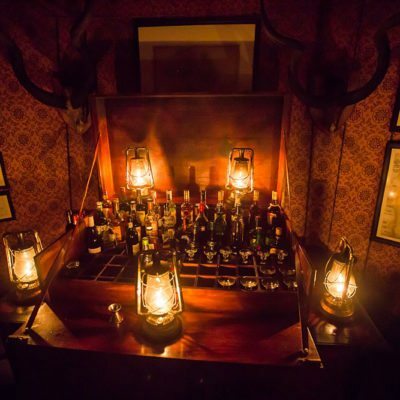 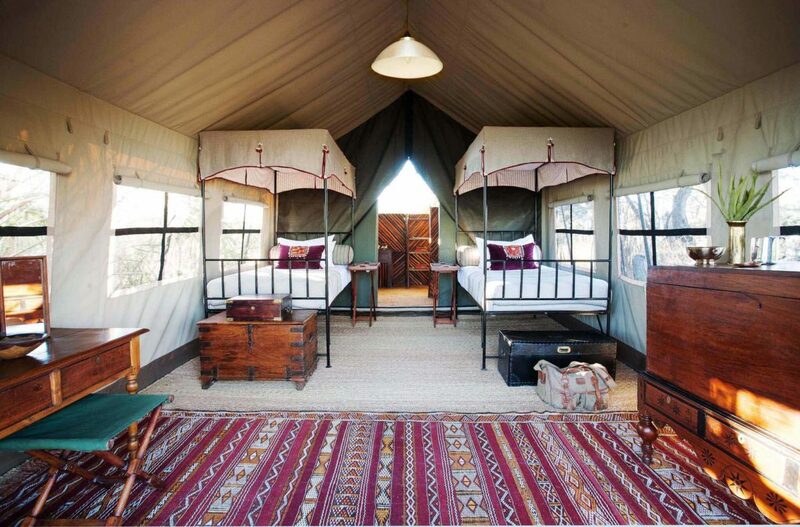 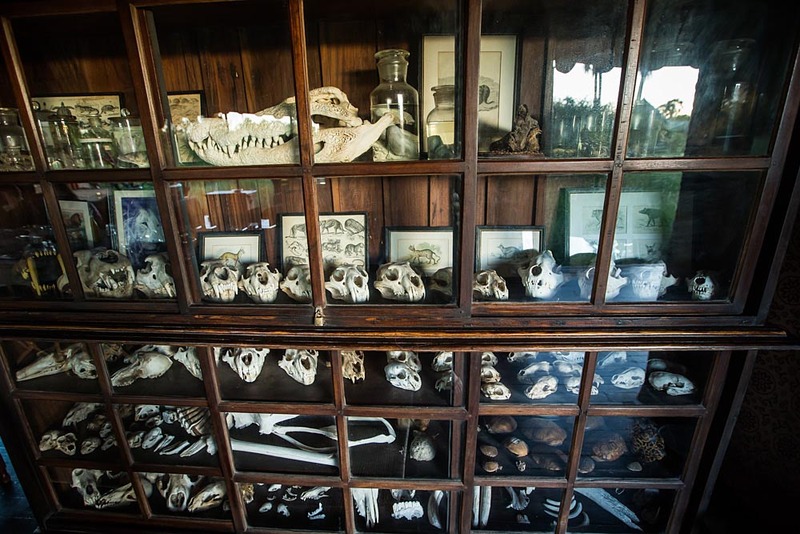 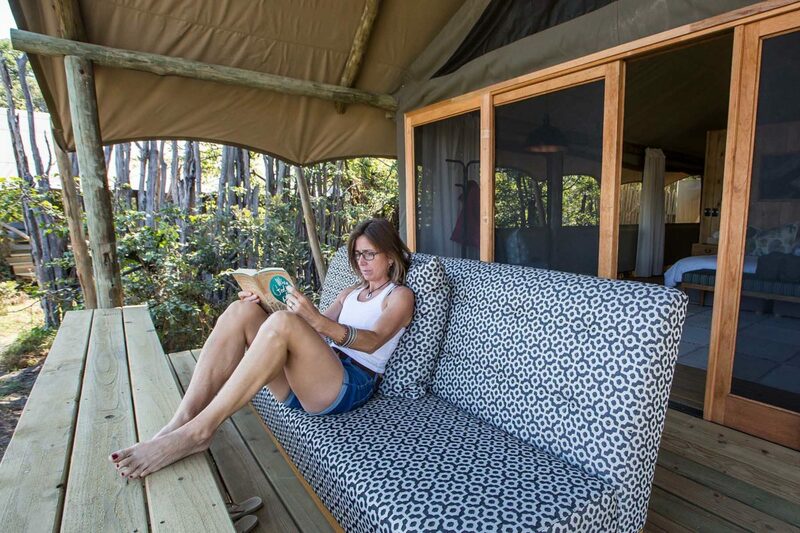 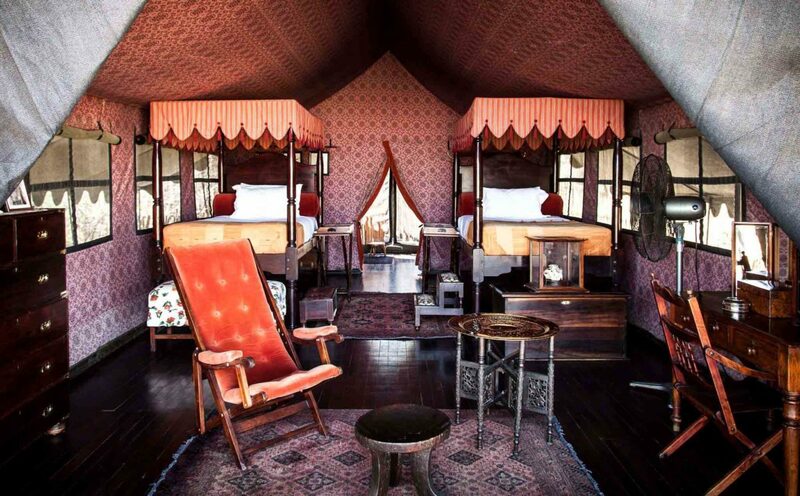 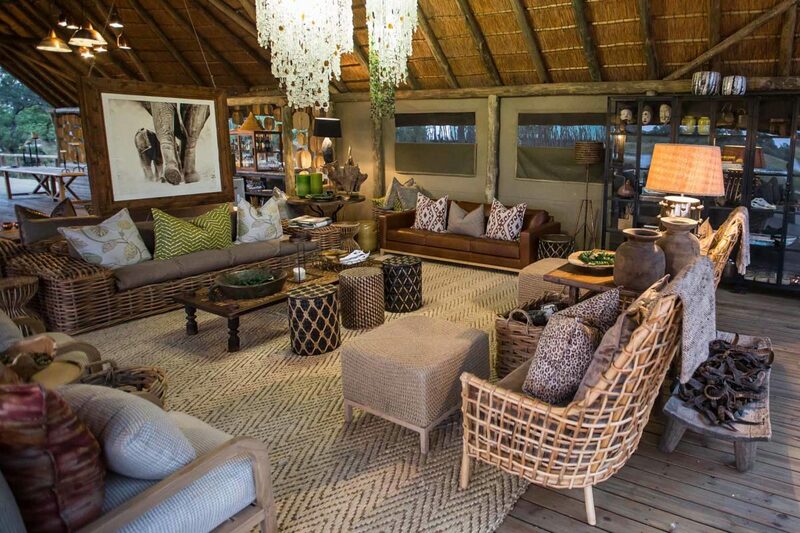 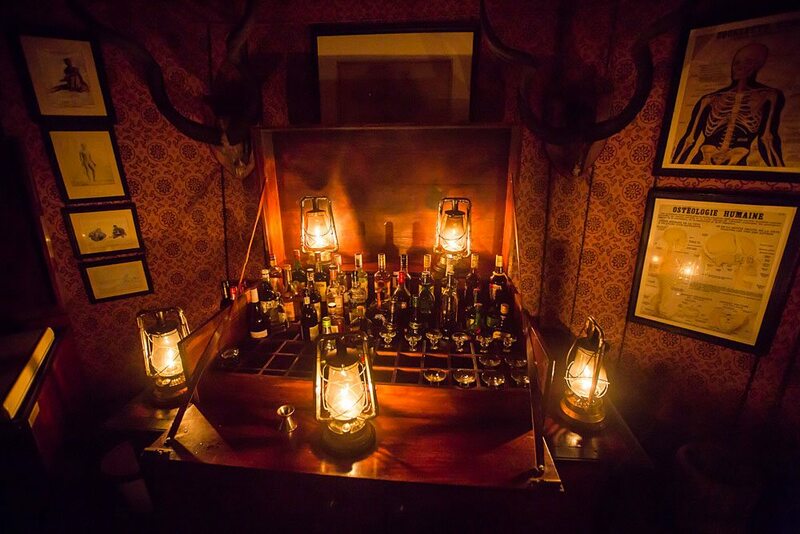 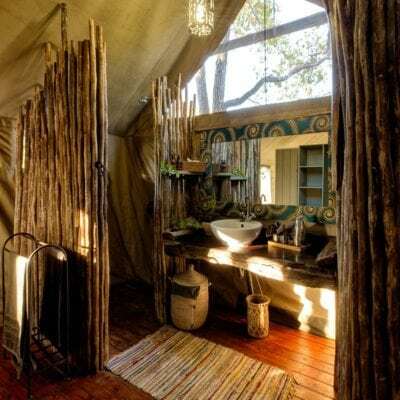 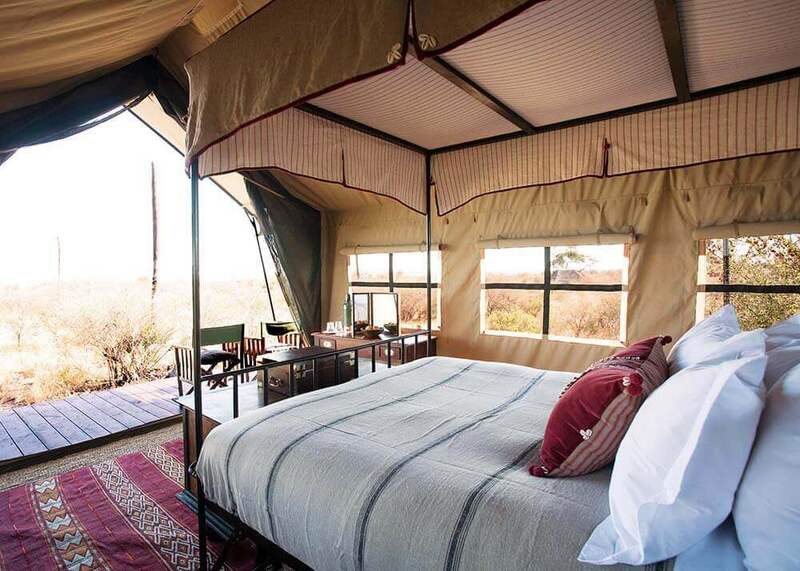 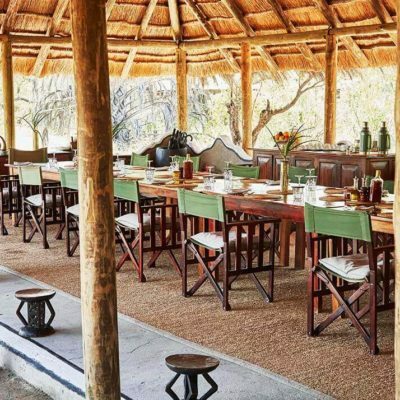 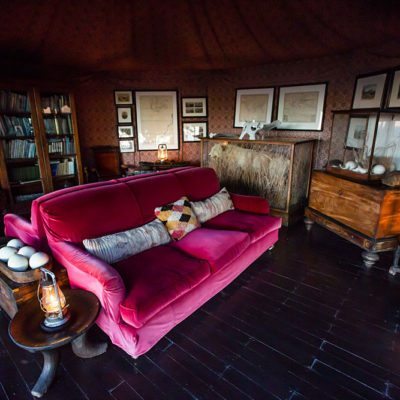 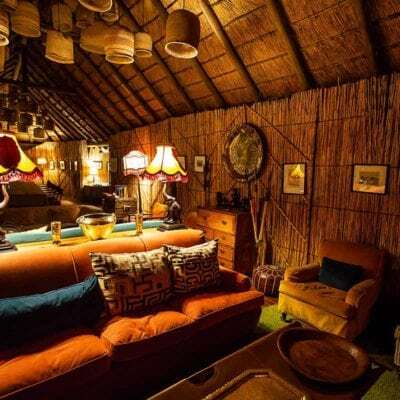 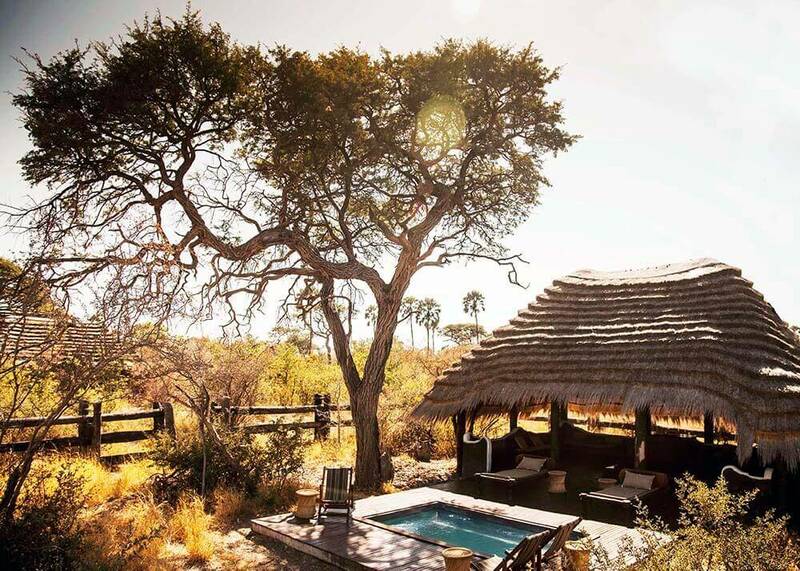 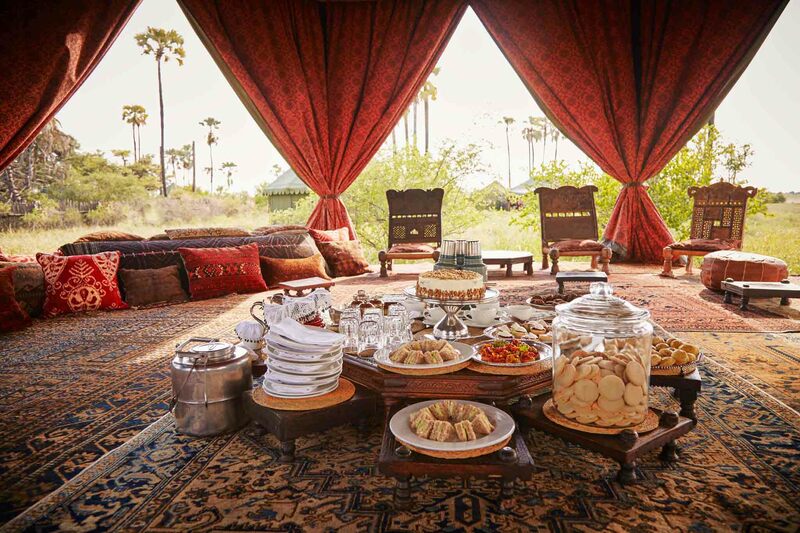 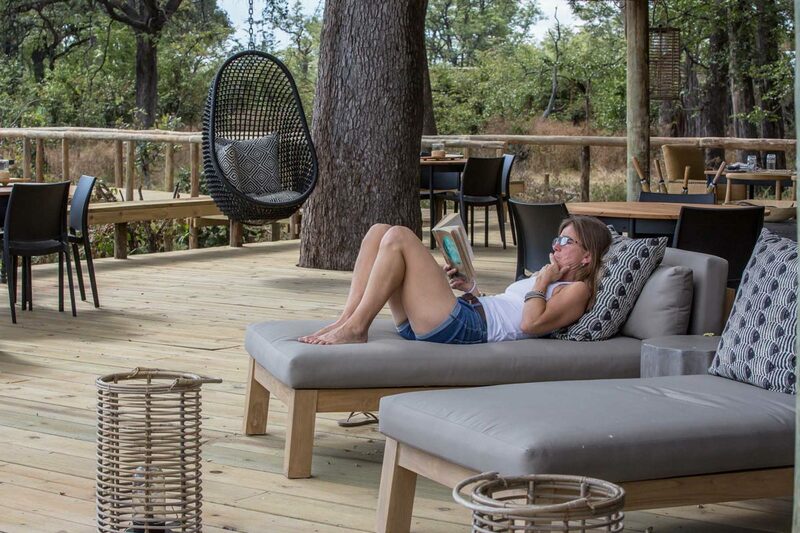 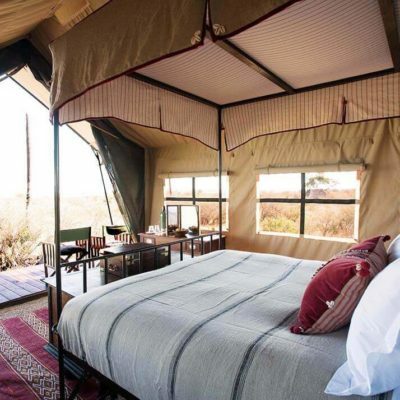 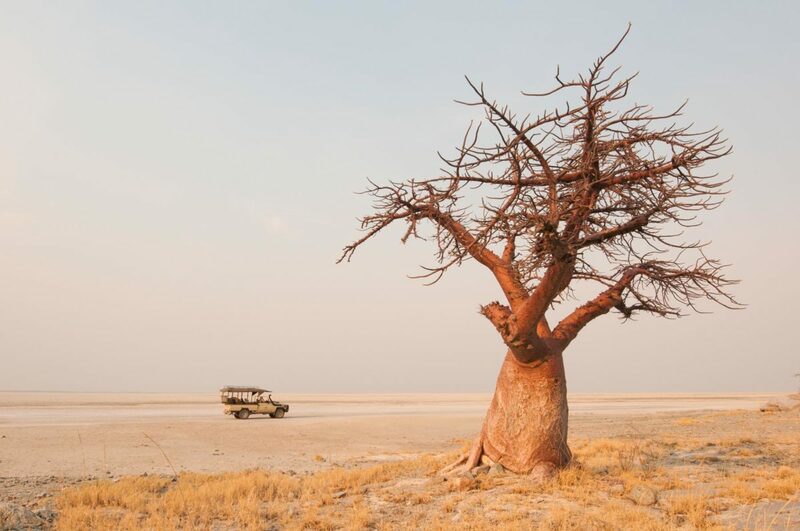 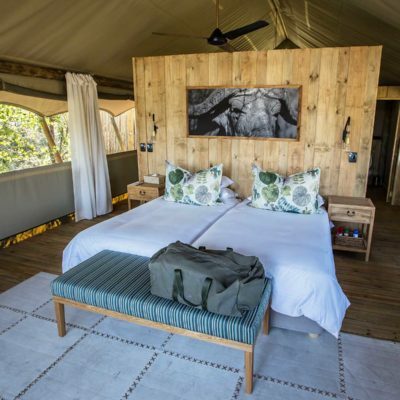 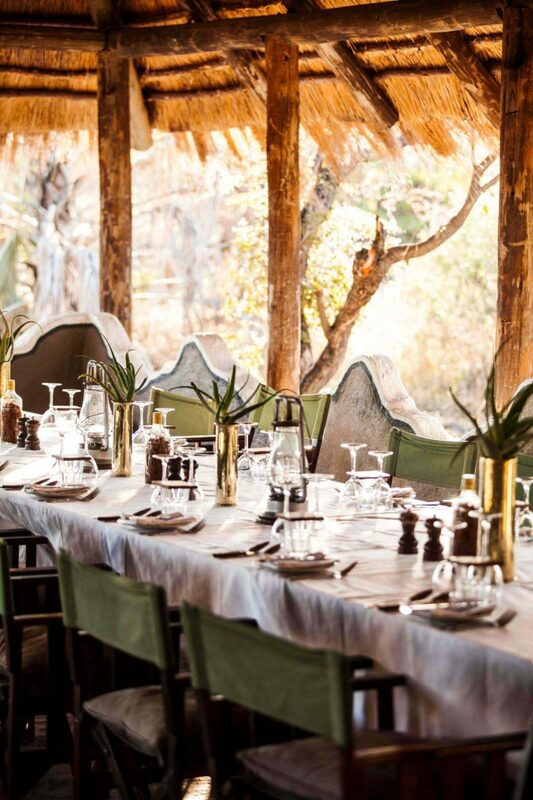 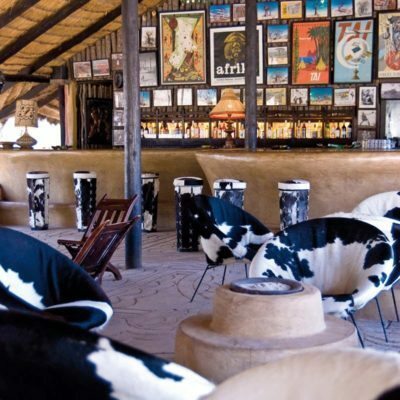 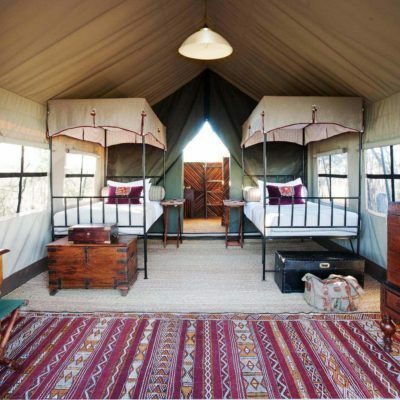 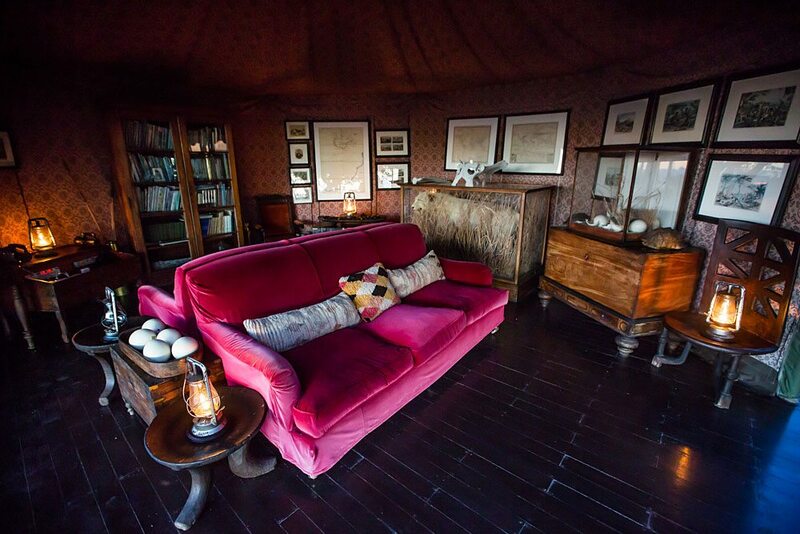 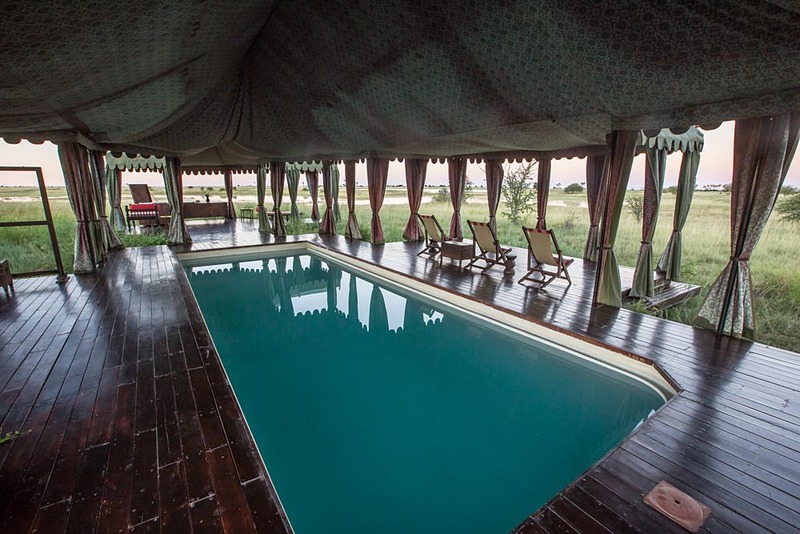 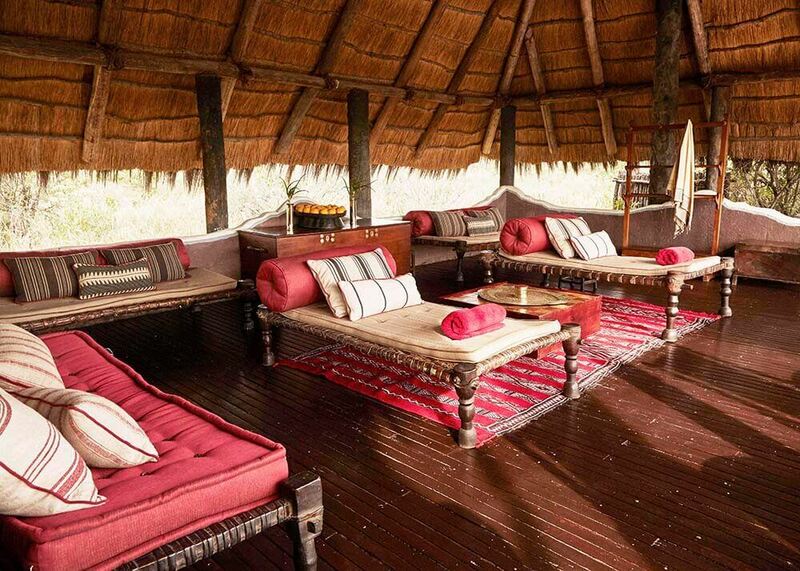 The owner of Unchartered Africa Safari Company (Ralph Bousfield) had a hand in the new interiors, which reflect some of the “old colonial Africa” style of Ralphs other camps (Jack’s Camp). 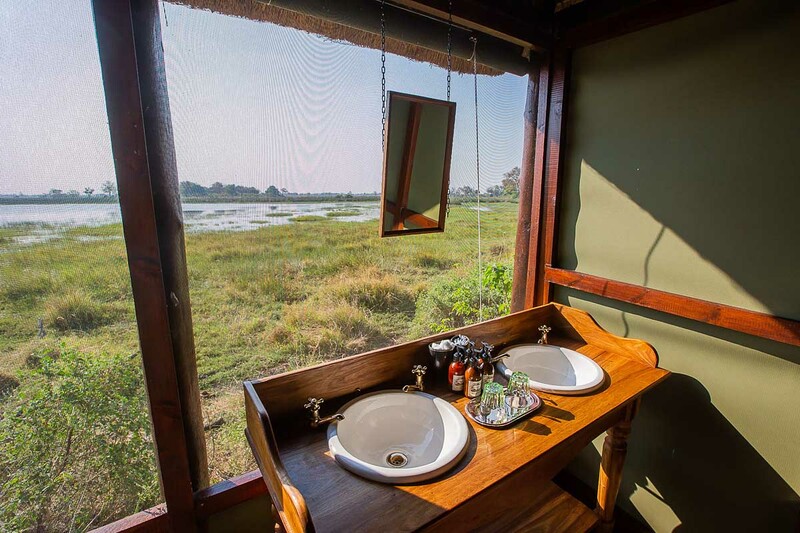 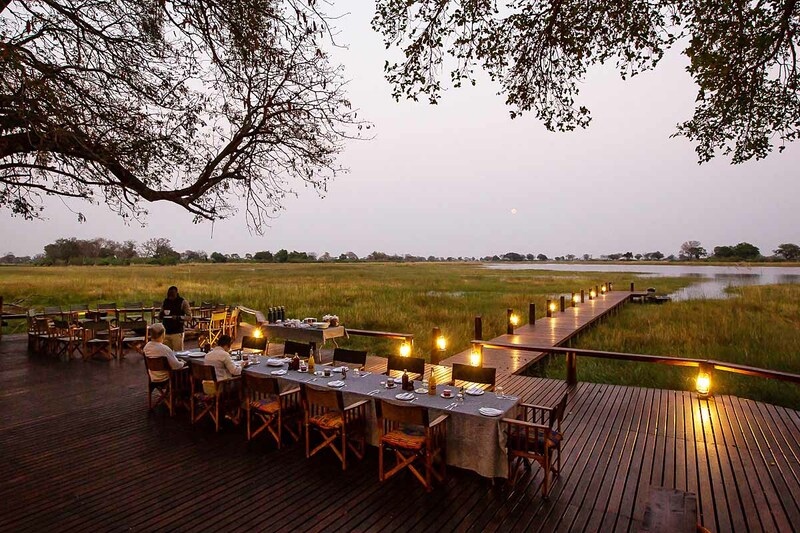 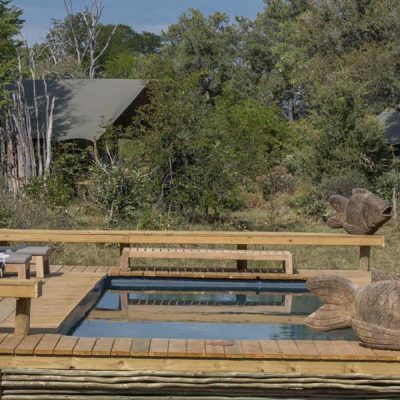 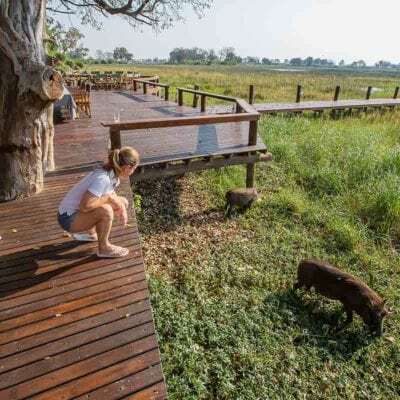 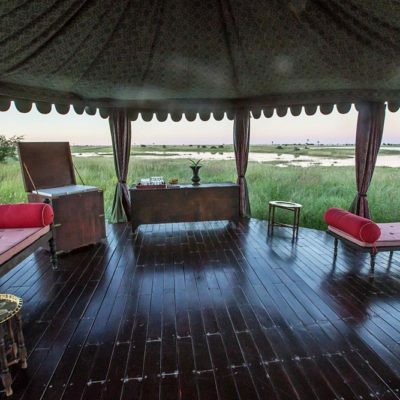 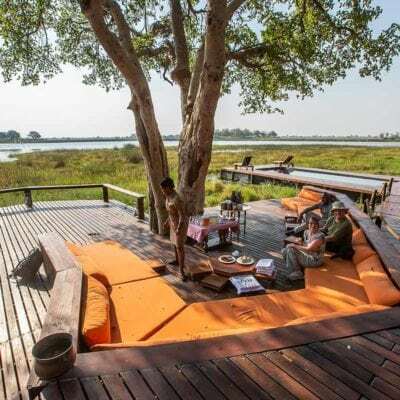 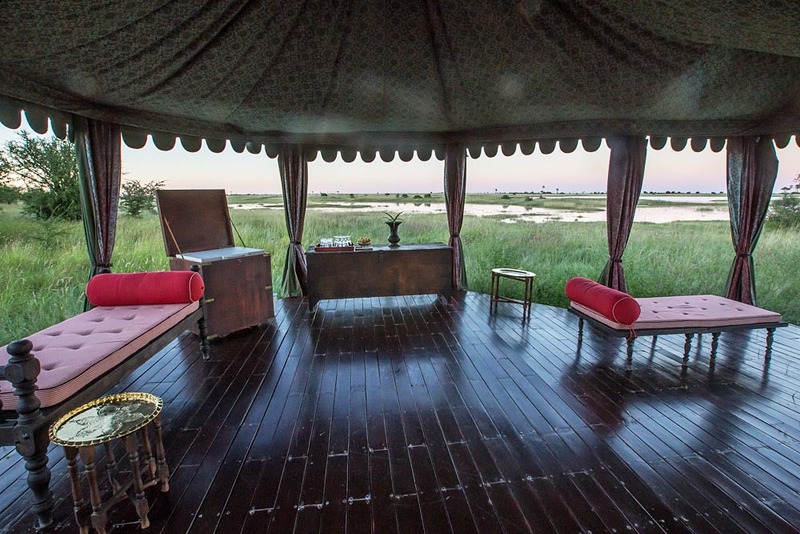 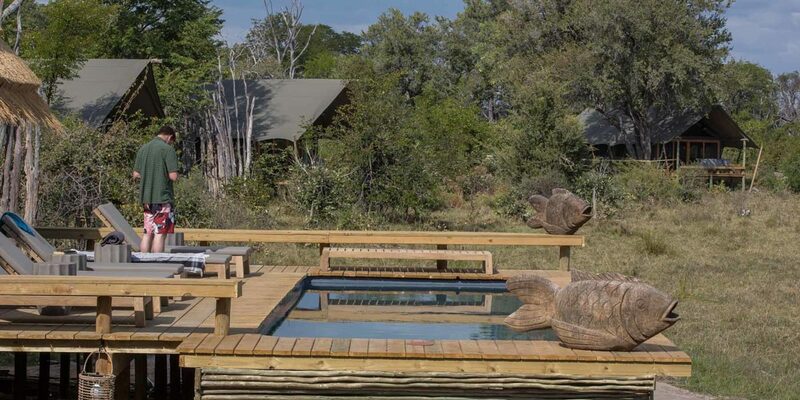 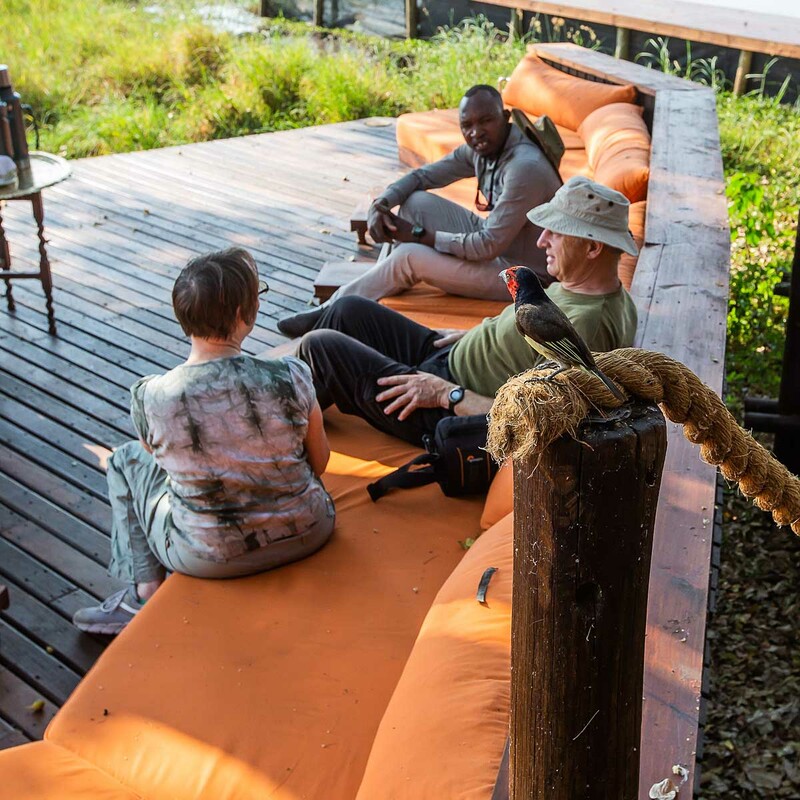 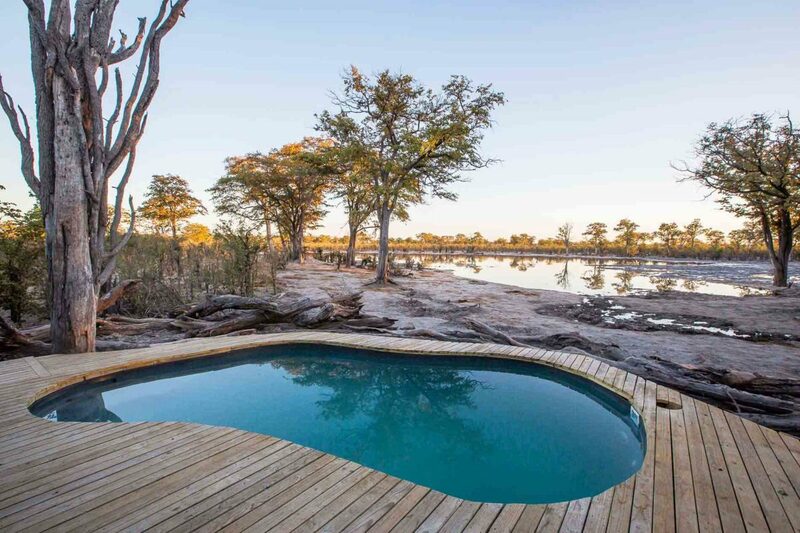 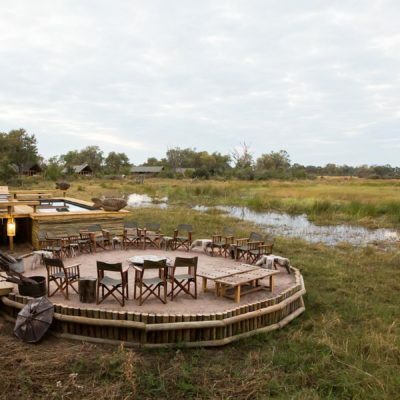 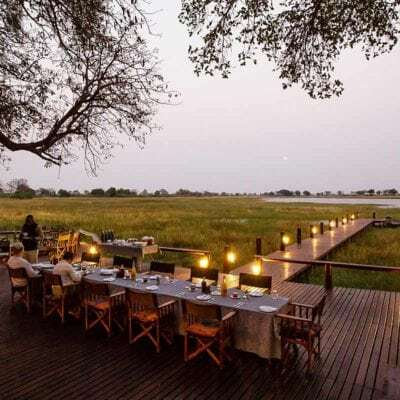 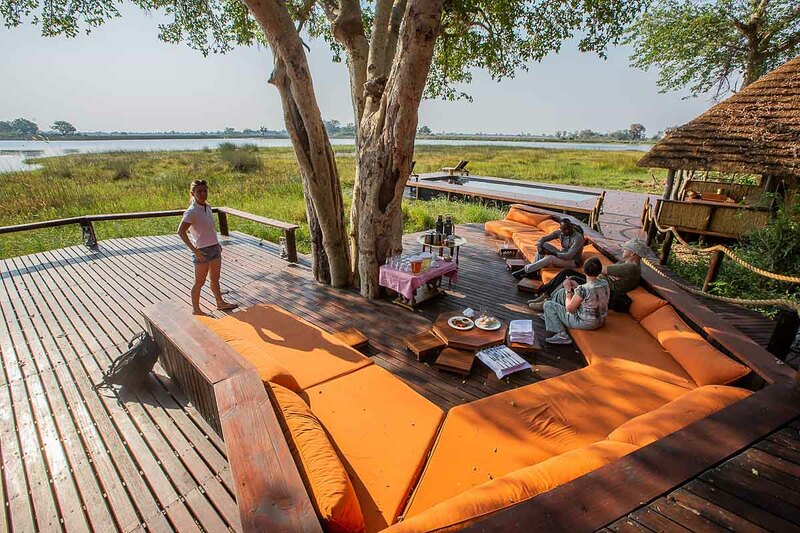 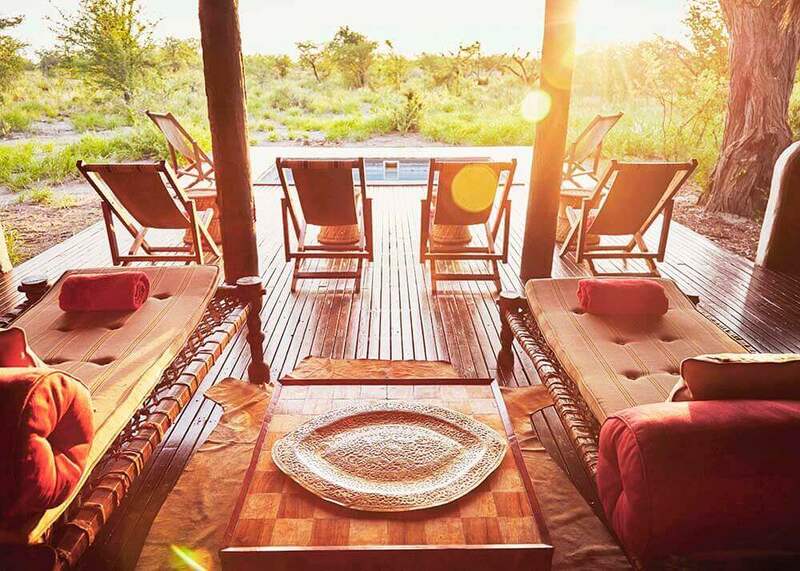 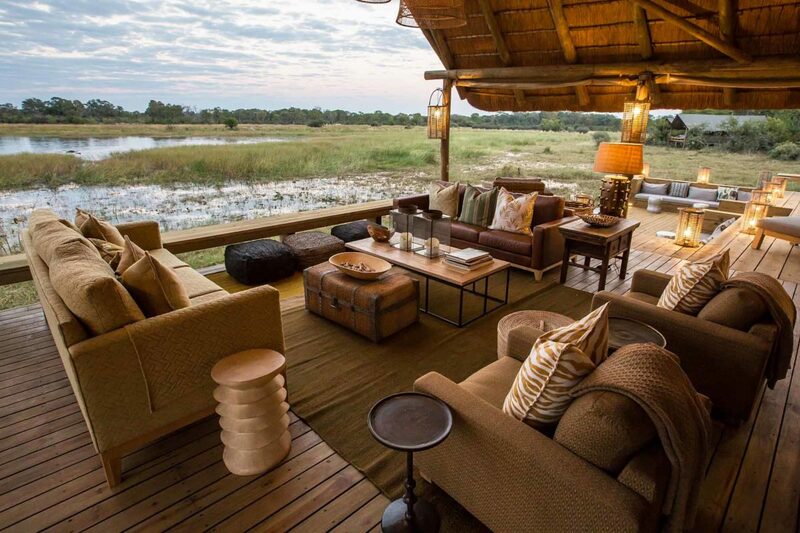 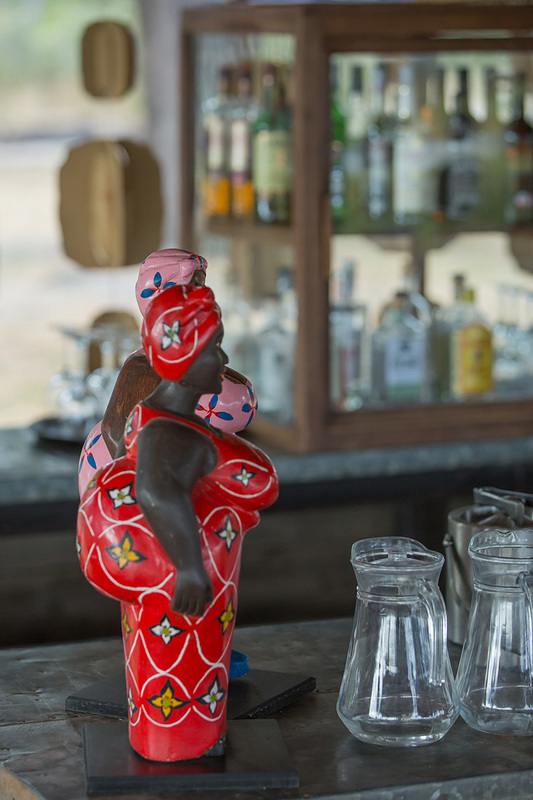 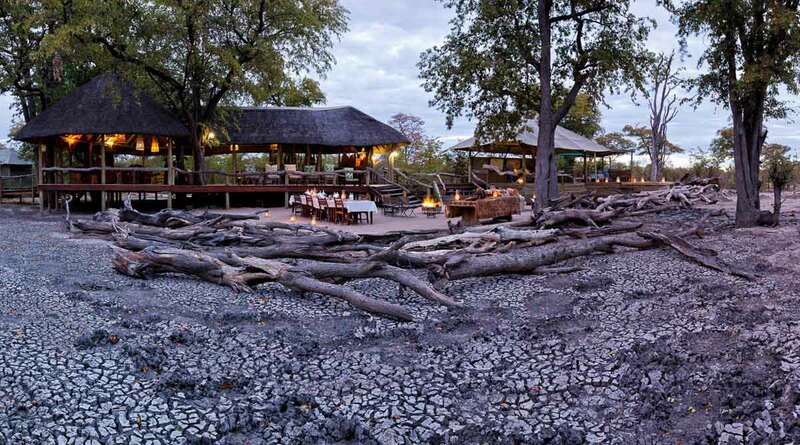 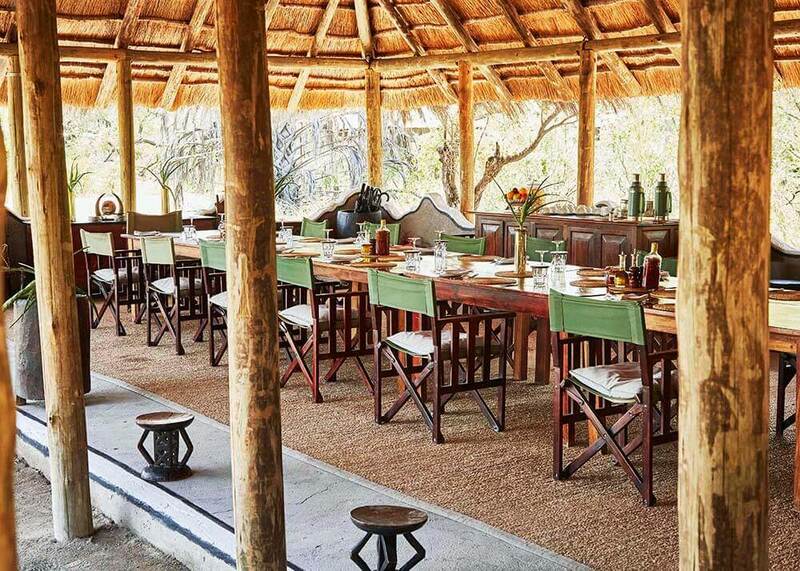 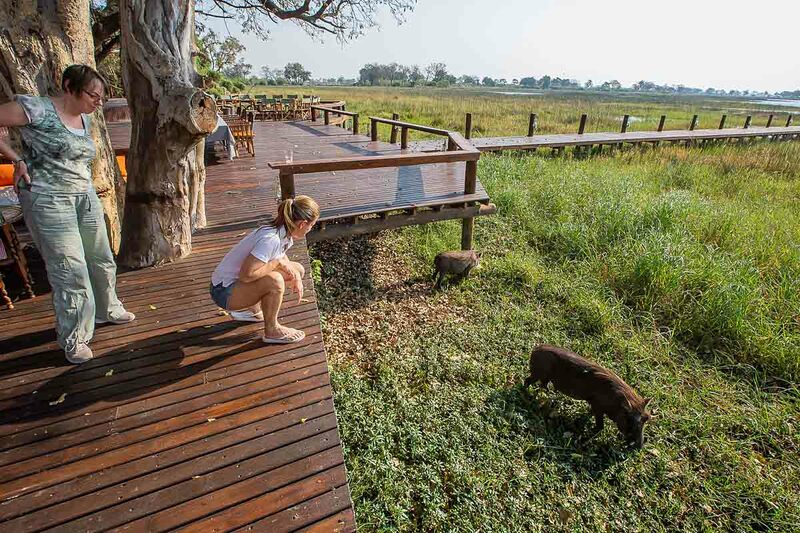 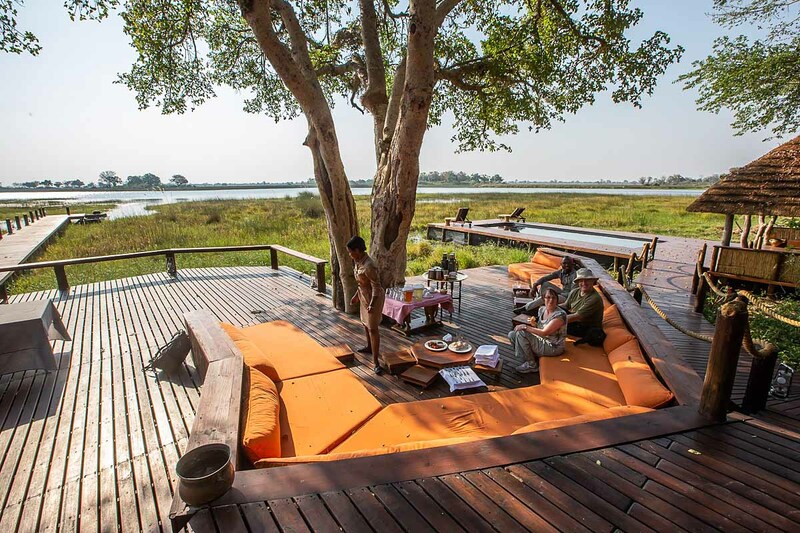 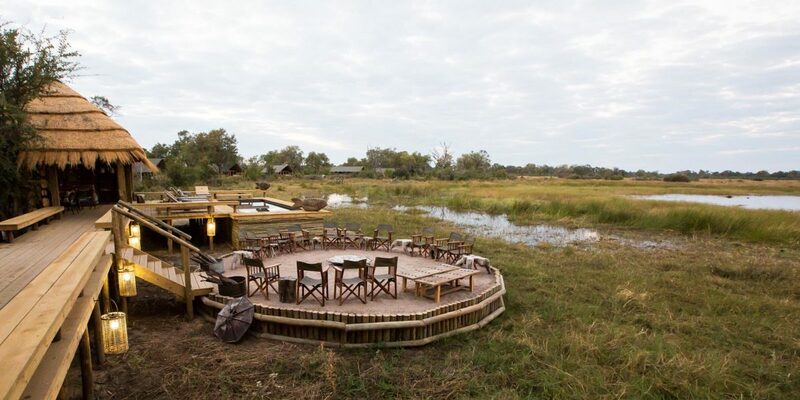 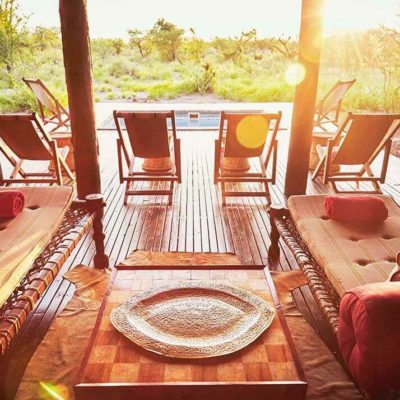 The main area has an expansive wooden deck with great views of a lagoon, always with plentiful hippos. 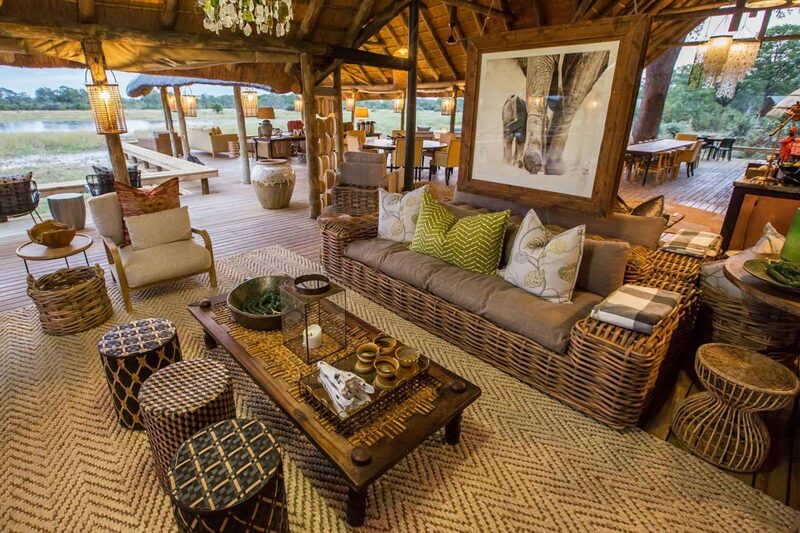 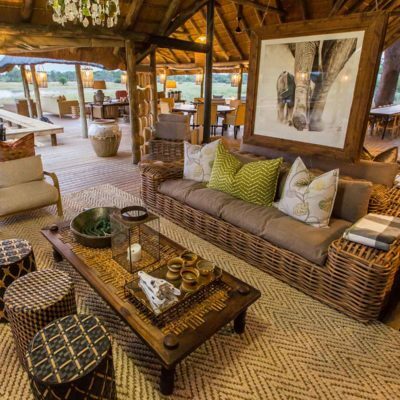 Dining can be done outside on this deck or under the thatched living area. 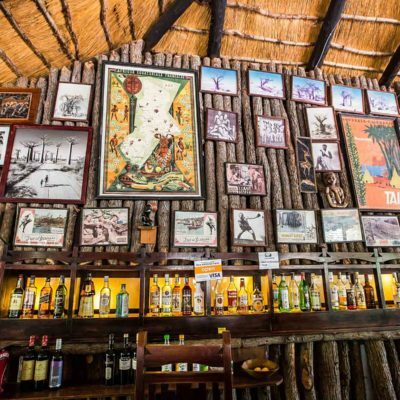 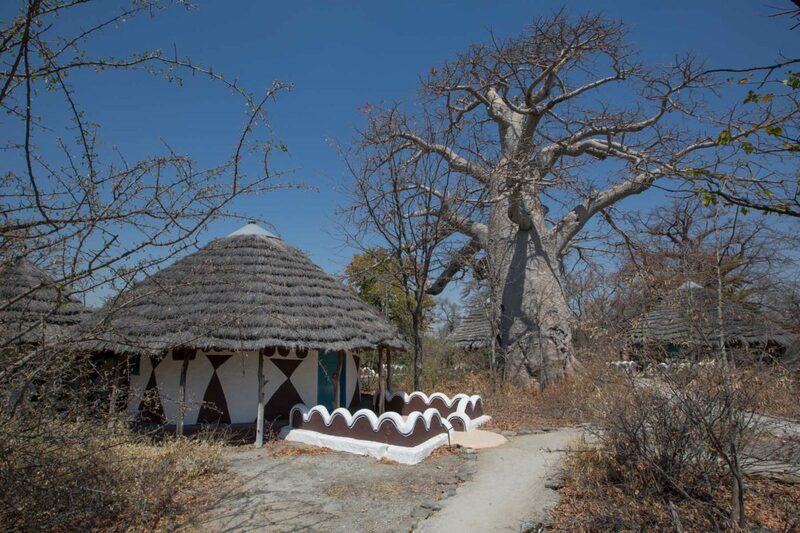 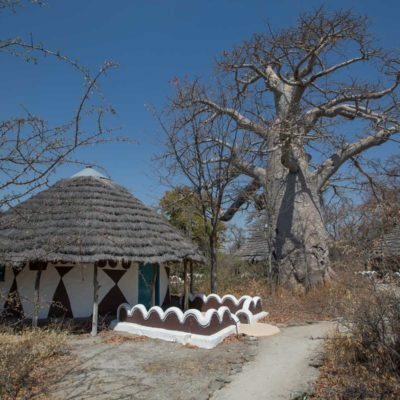 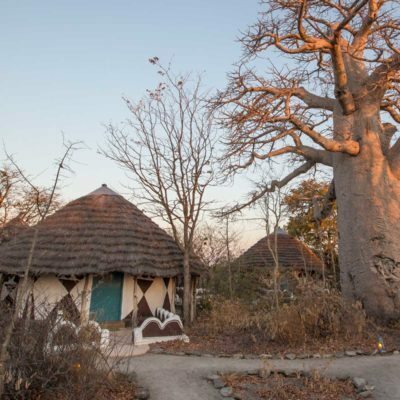 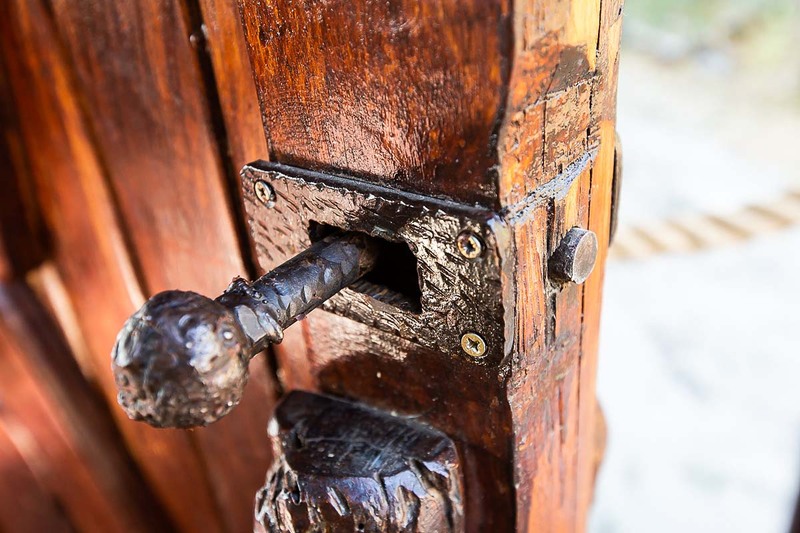 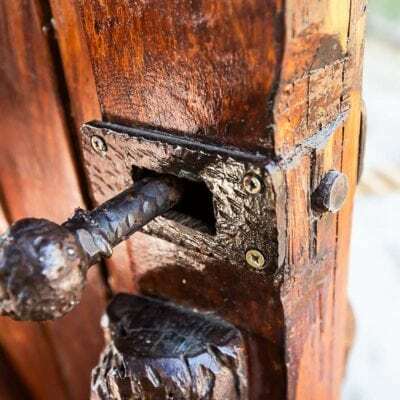 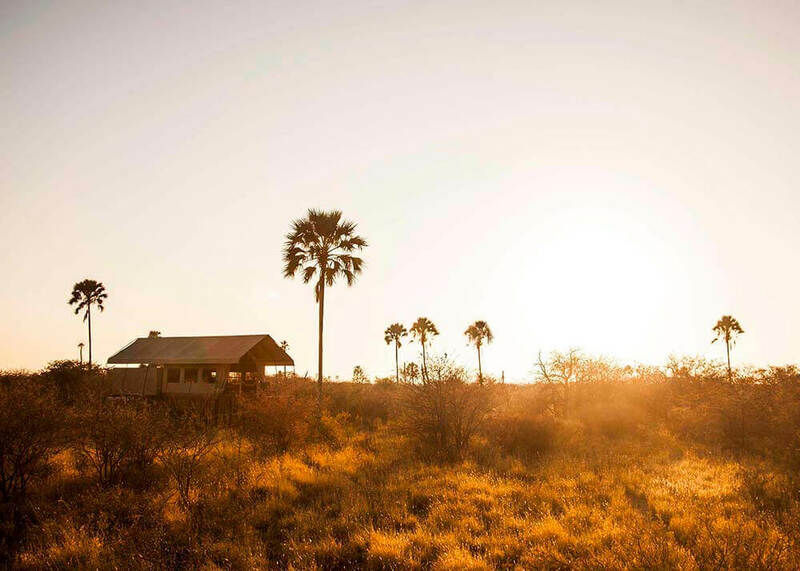 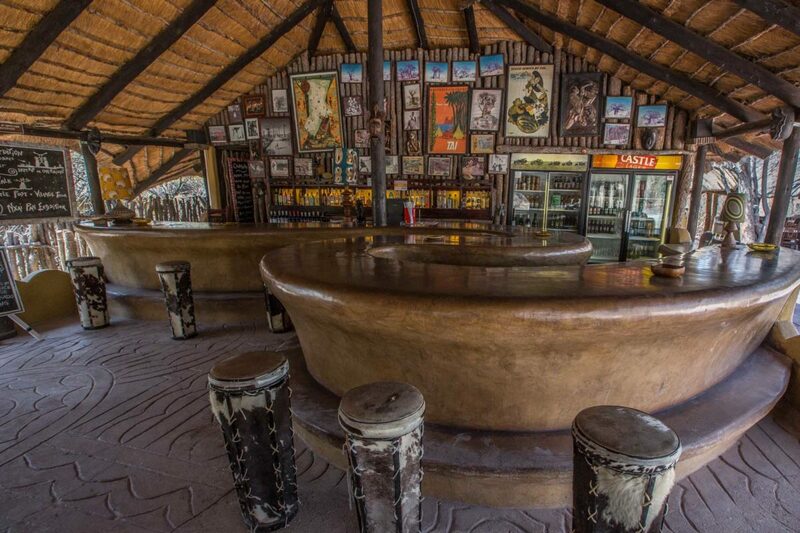 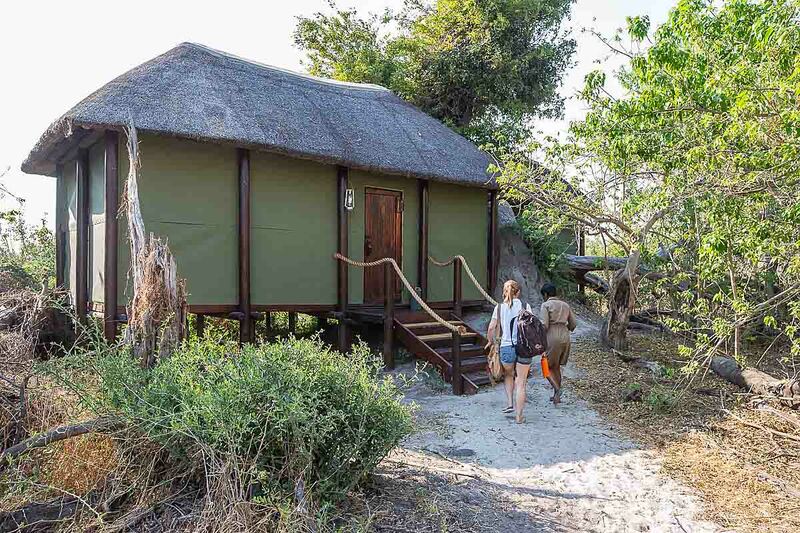 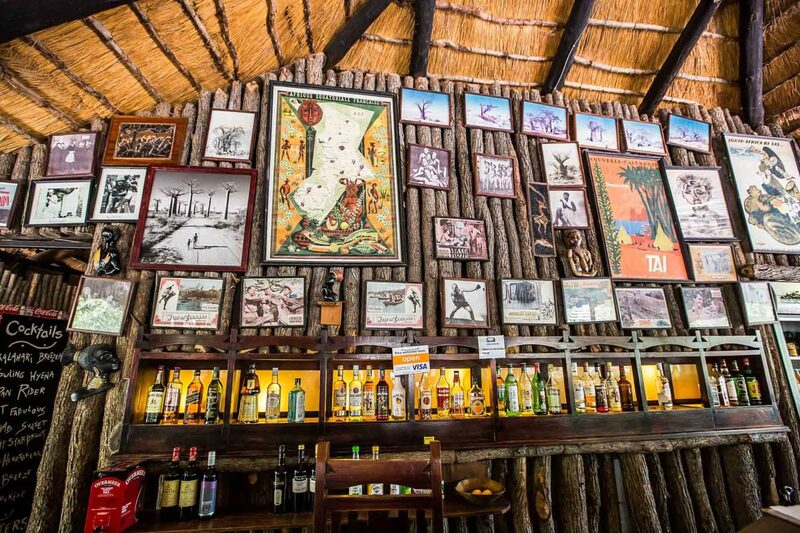 As said, the old bricks and mortar from this structure have also finally been removed and replaced with traditional reed walls and canvas – these are the main building materials of some of Botswana’s original camps, which somewhat adds to Mapula’s charm. 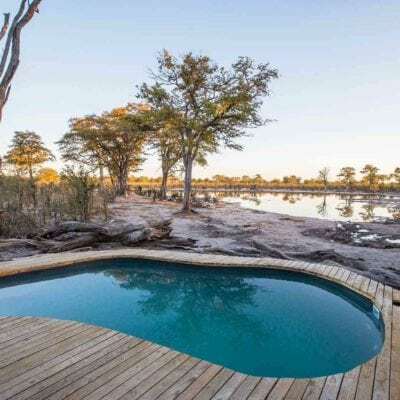 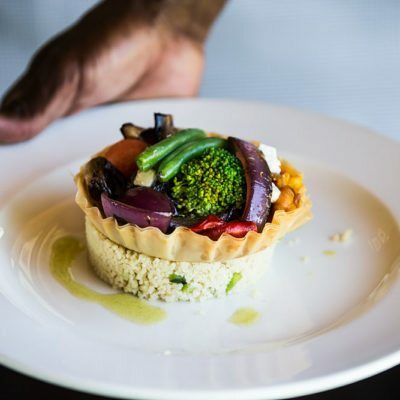 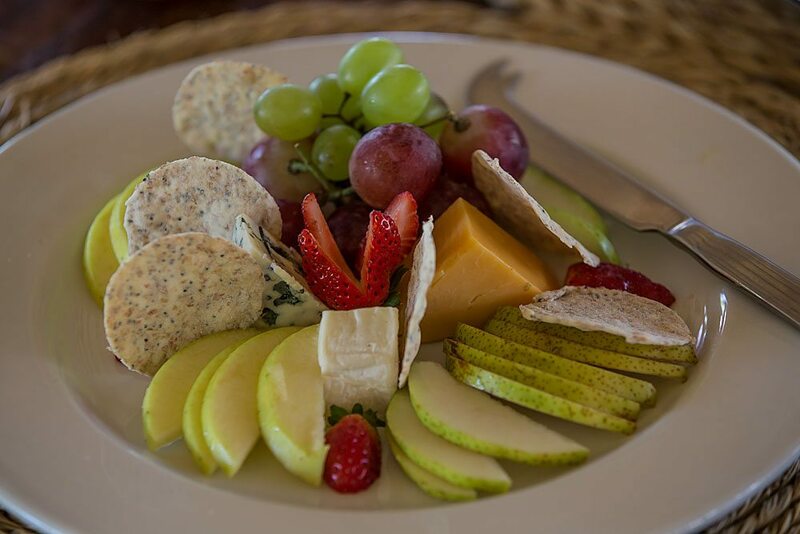 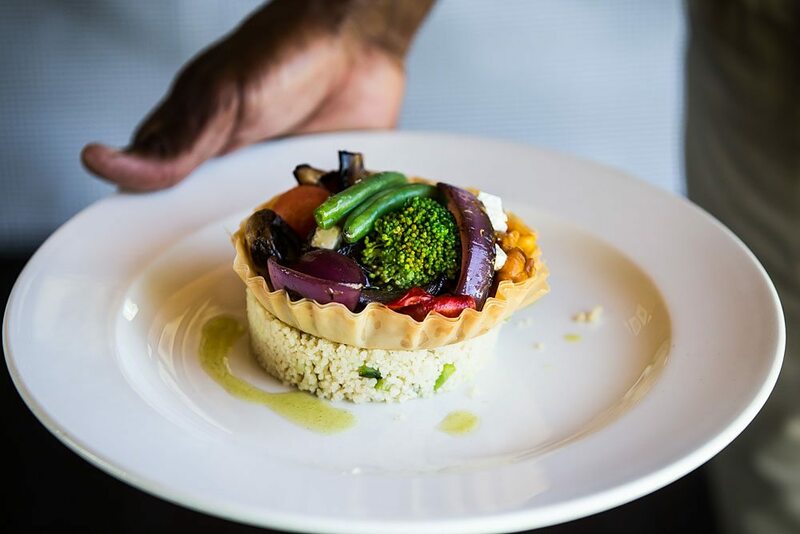 There is a sunken lounge area where guests take high tea, a decked and rather big swimming pool with great views of the surrounds and a wooden jetty out to where the boats are kept. 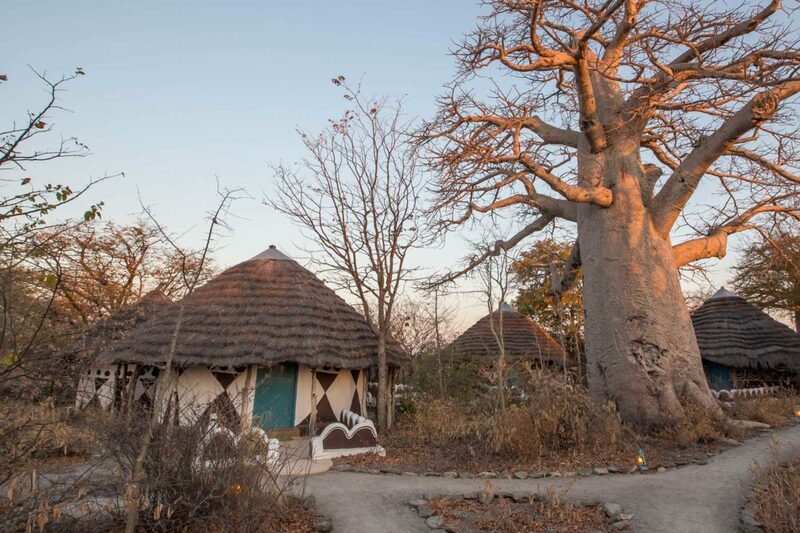 All this under a magnificent Sycamore fig and an Albezia tree! 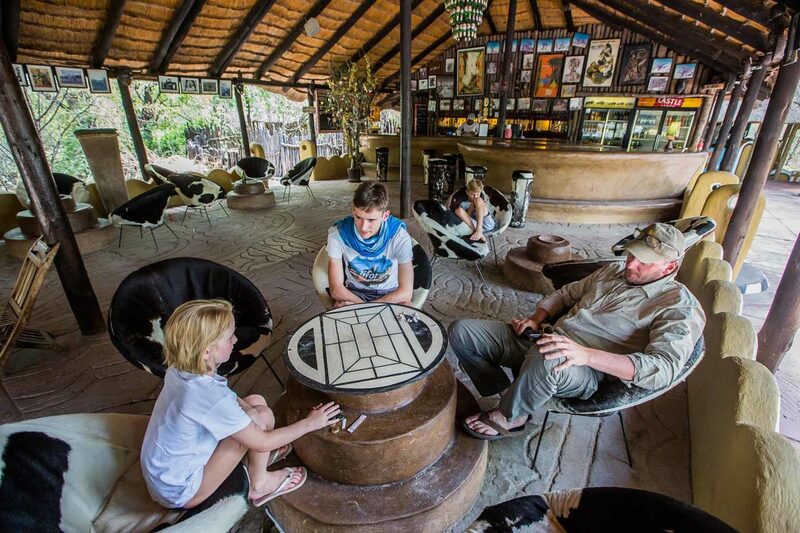 You certainly have a choice of comfortable ‘relax zones” in this main part of the lodge. 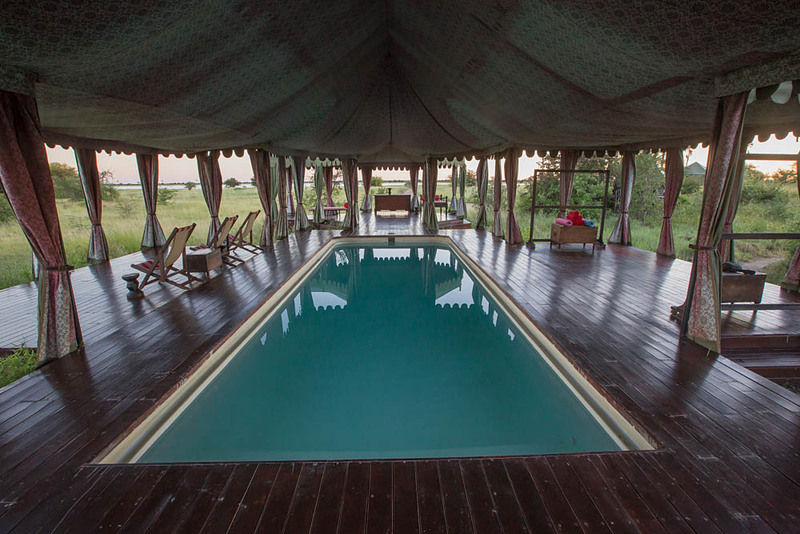 The canvas and thatched rooms are raised on decks, each with great views of the open water in front of camp. 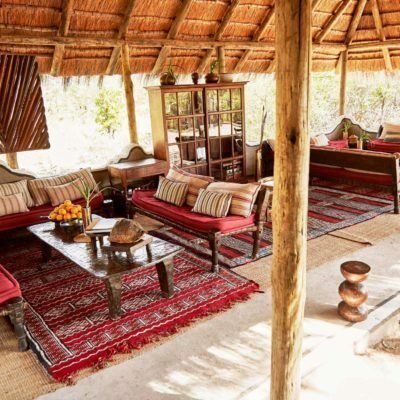 The decoration inside each unit has again been done by Ralph, being very “old safari style.” Everything is simple but functional inside and the thatch really helps to keep things cool. 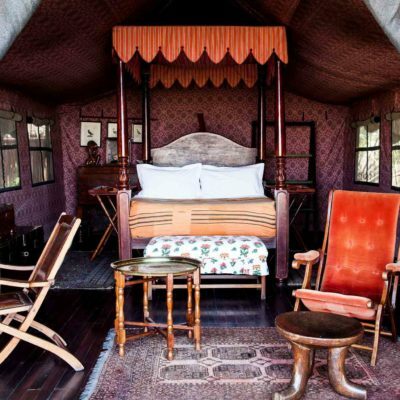 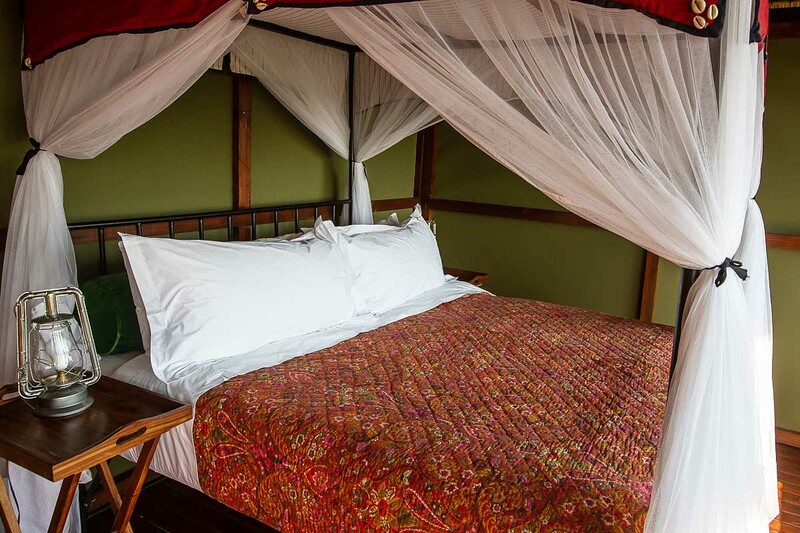 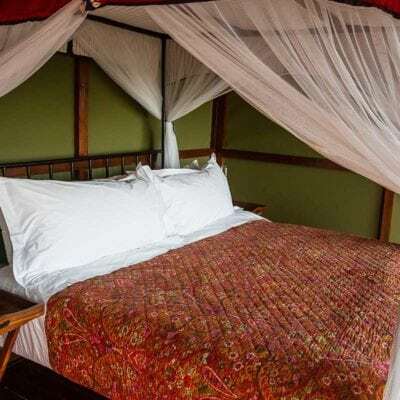 The four-poster beds are king size and add a touch of panache. 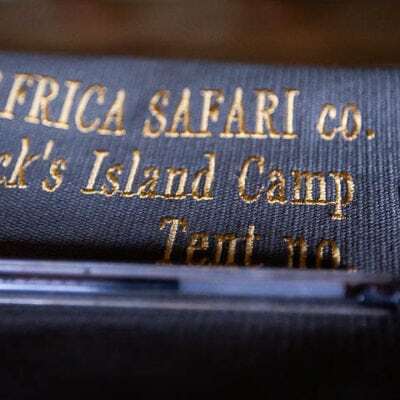 All the other fittings are very “safari,” typical of the lifestyle of the Bousfield’s during decades of running tourist camps in Africa. 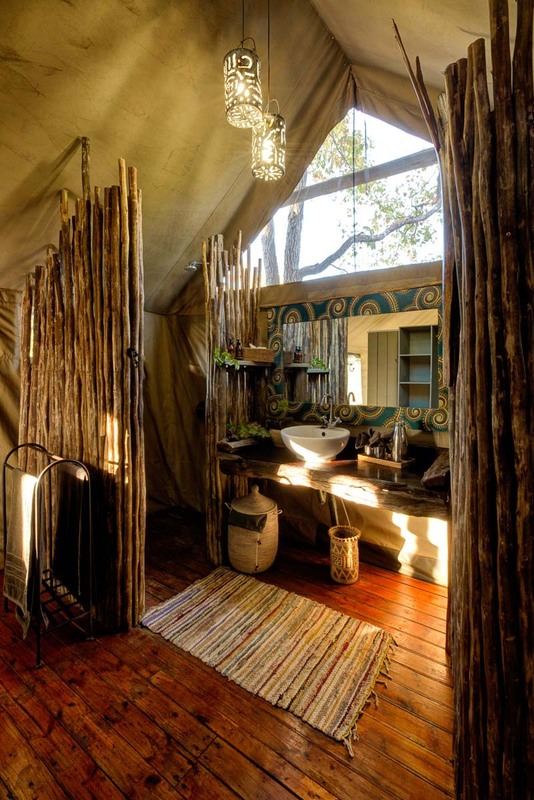 Bathrooms are functional with copper fittings and inside and outside showers. 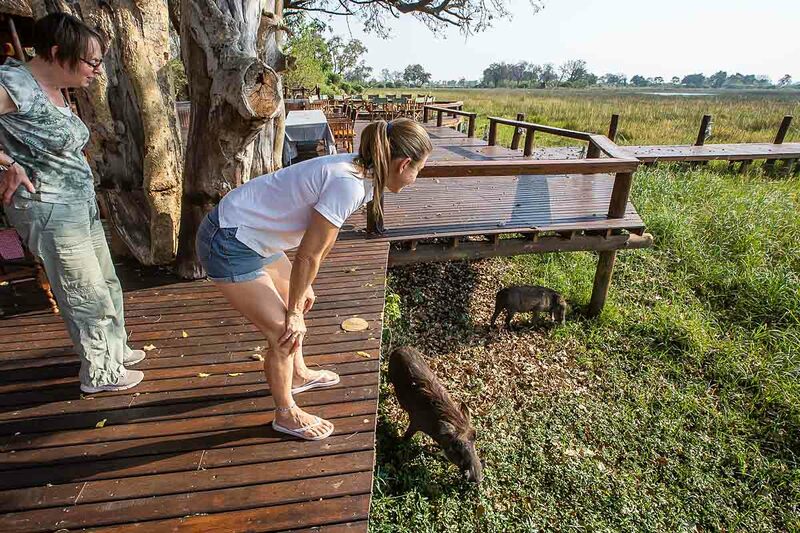 One little quirk of the camp is the resident family of warthogs that call the the underneath of the pool deck home! 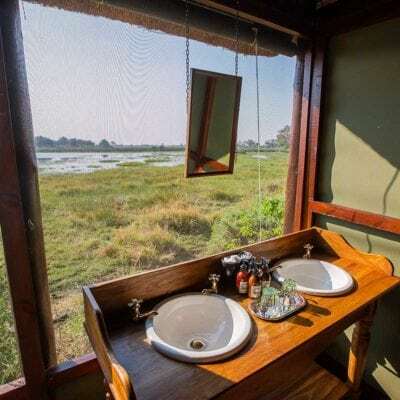 Even though ALL the areas of the delta are exceptionally beautiful, this concession really impresses in this regard. 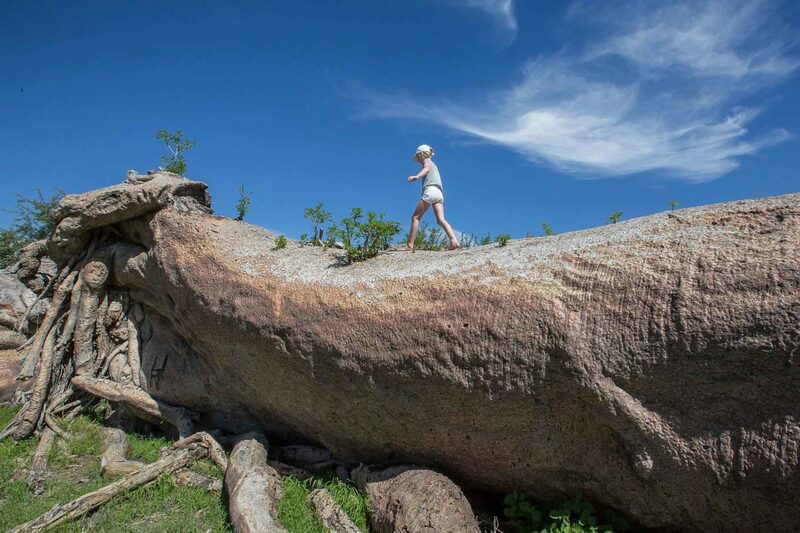 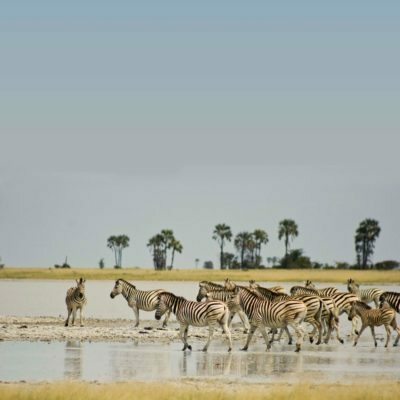 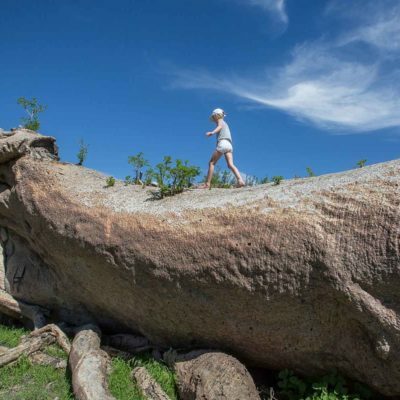 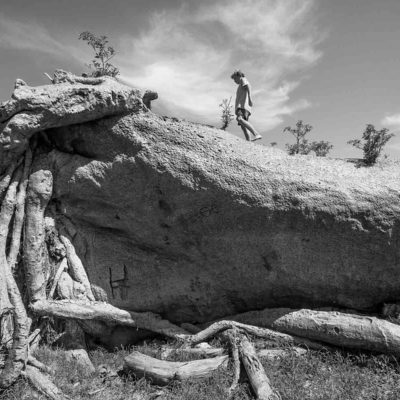 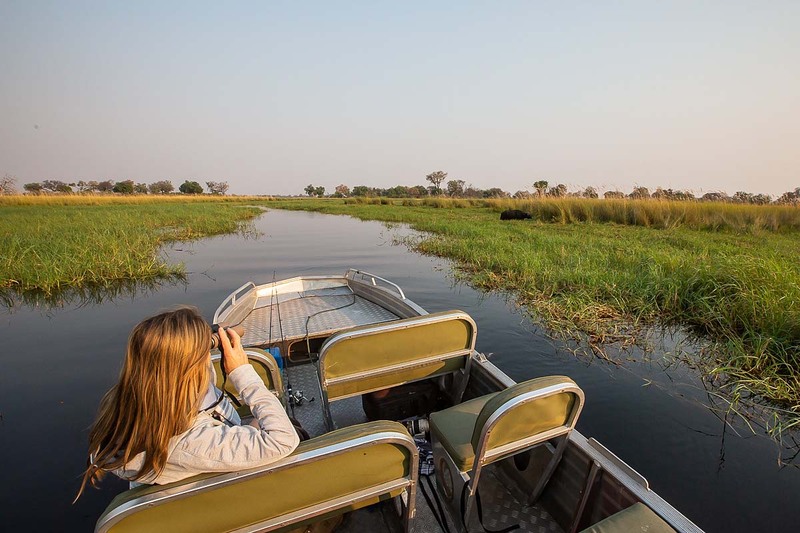 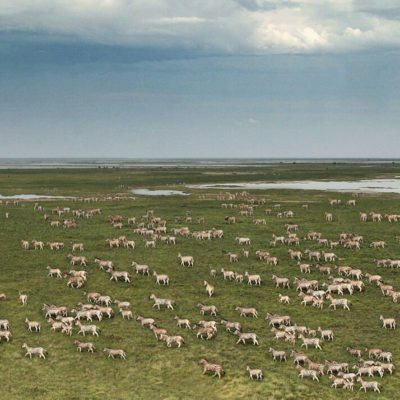 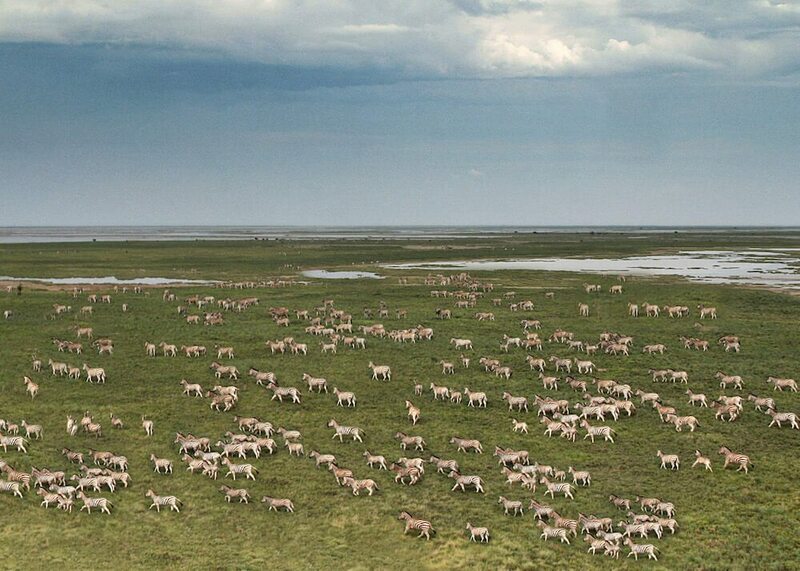 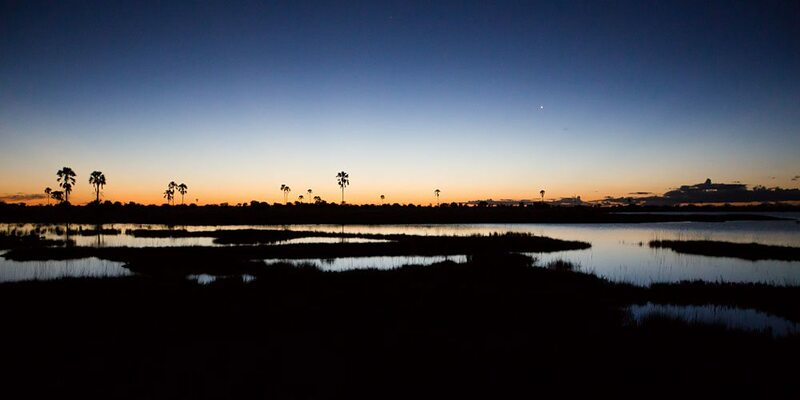 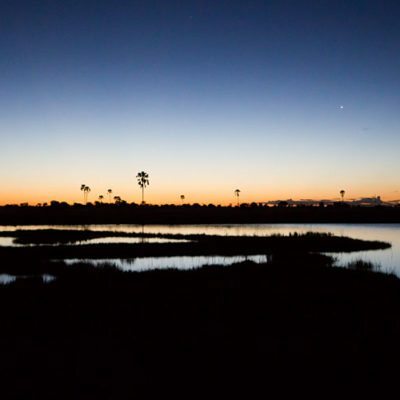 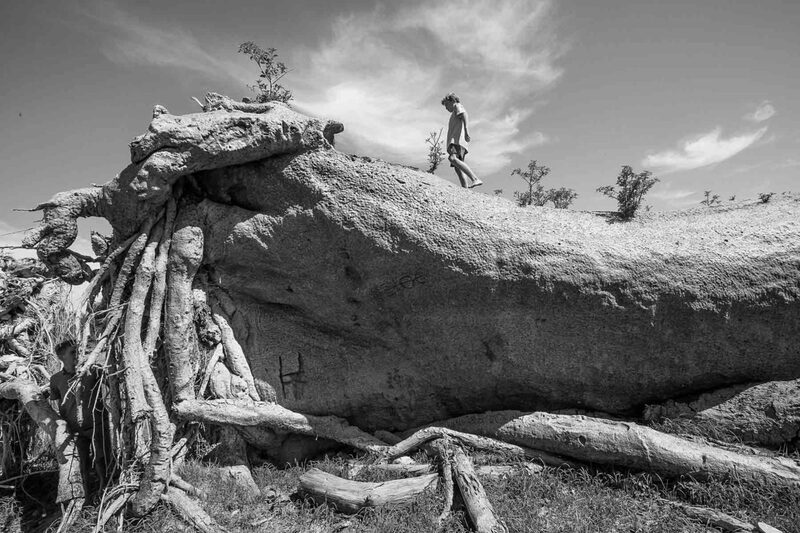 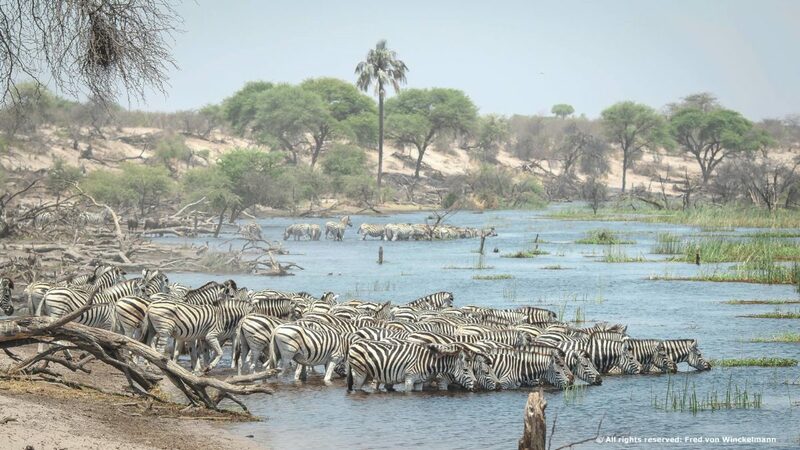 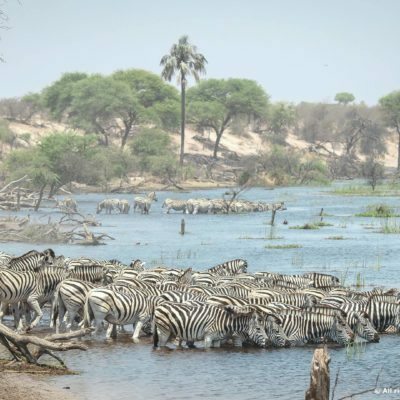 It might be the best example of true Okavango scenery we have seen on all our travels. 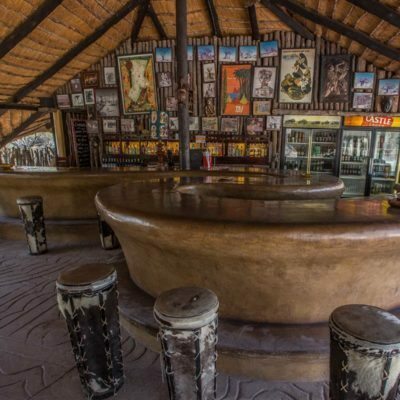 The lodge is not new and modern, but there is talk of a complete rebuild in the near future. 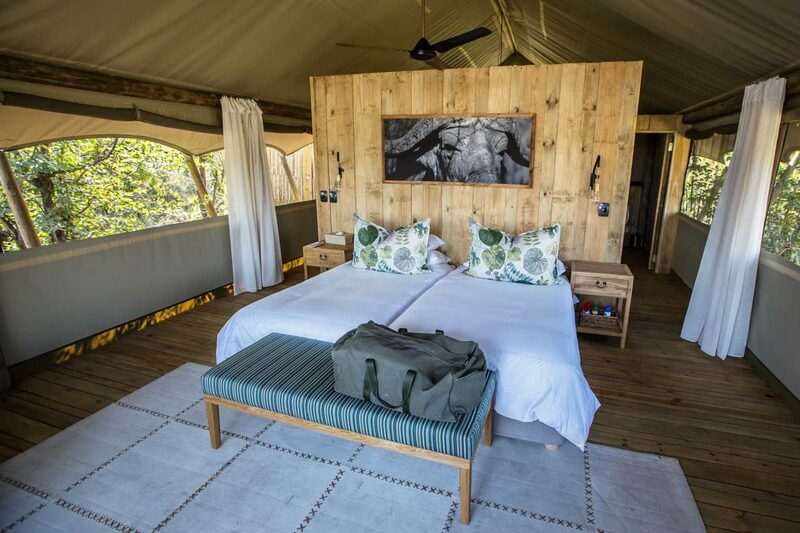 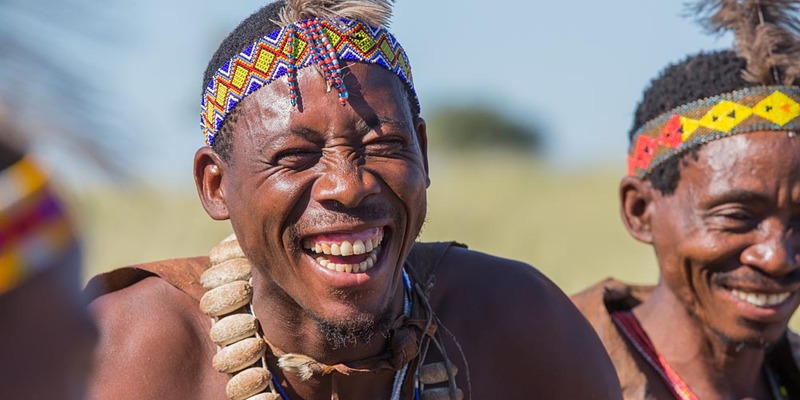 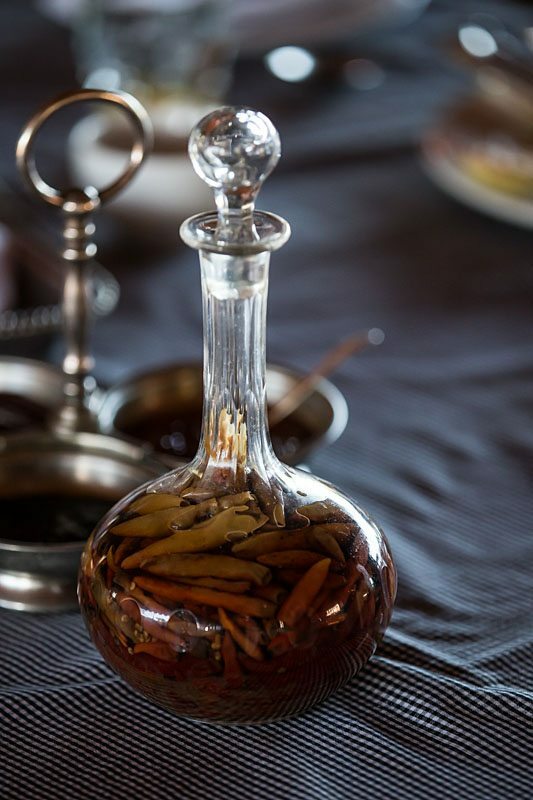 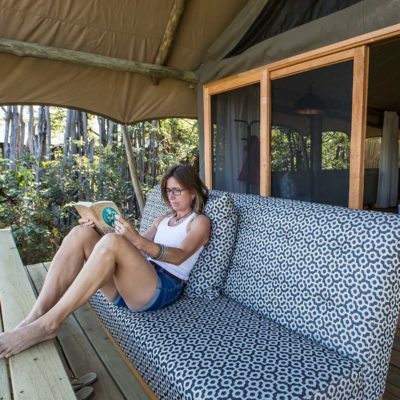 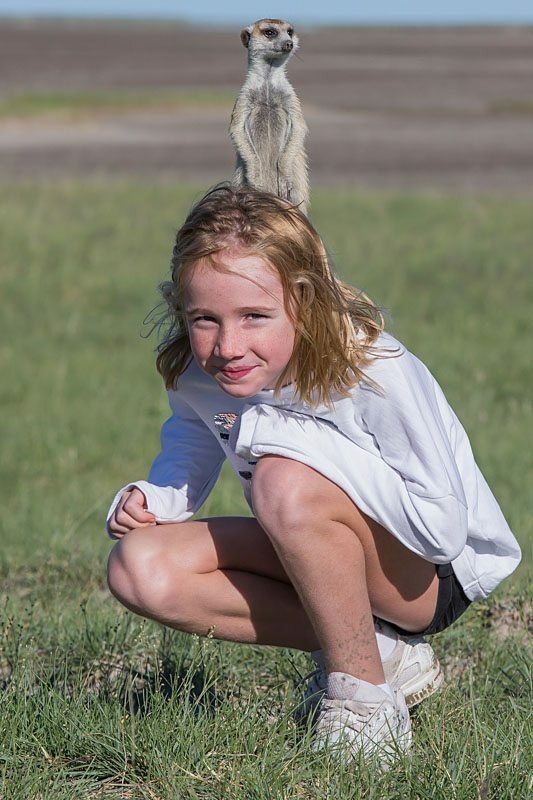 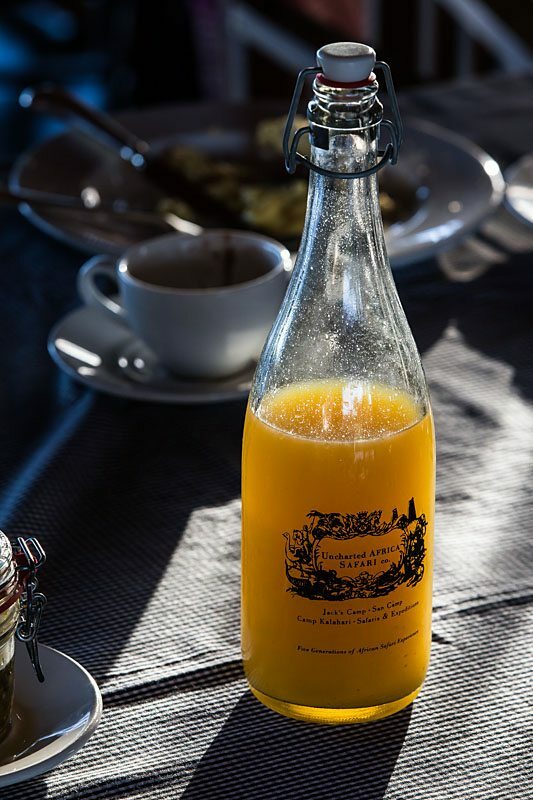 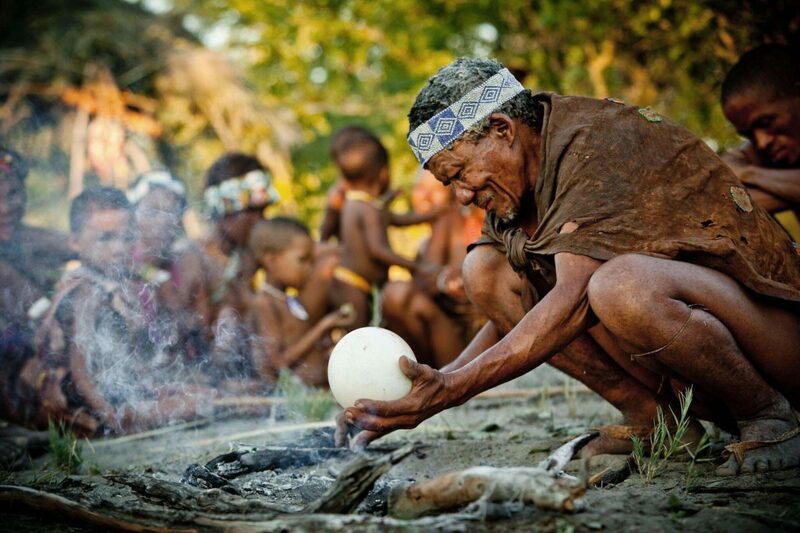 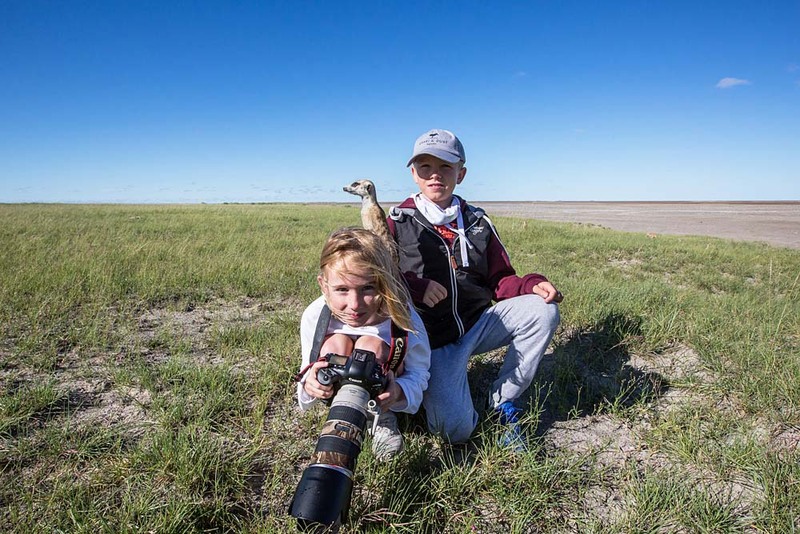 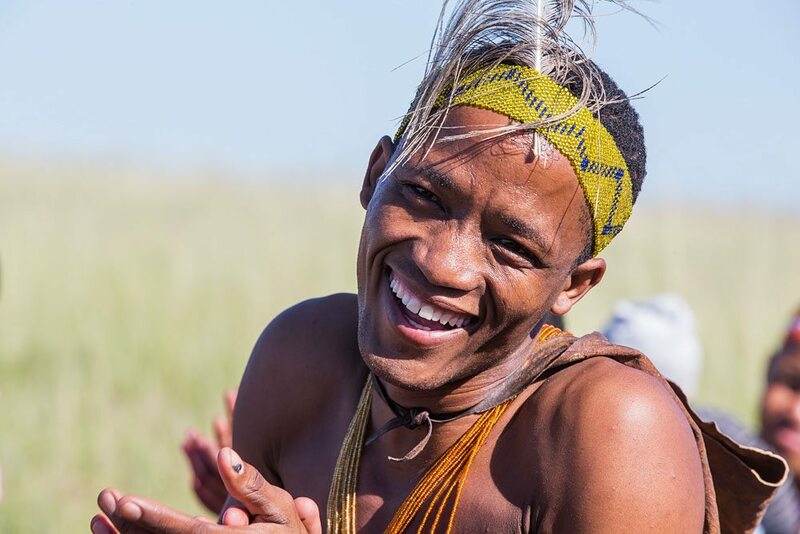 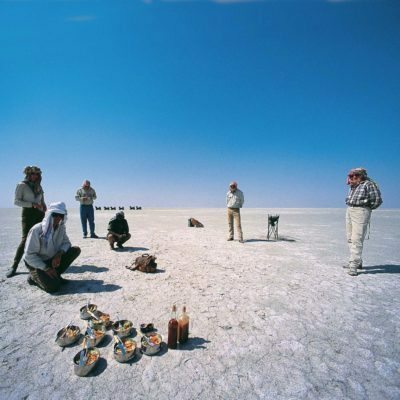 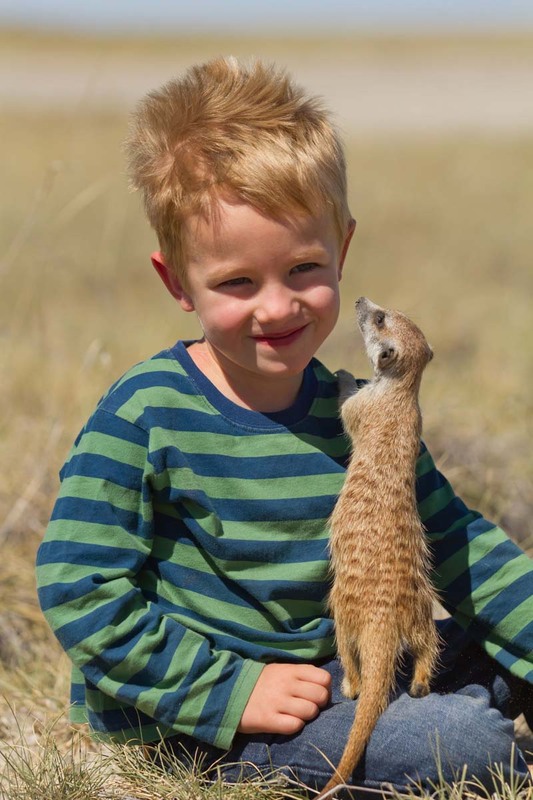 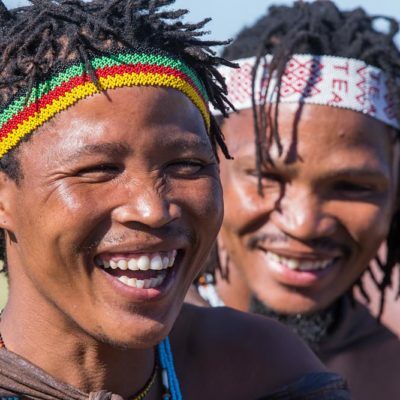 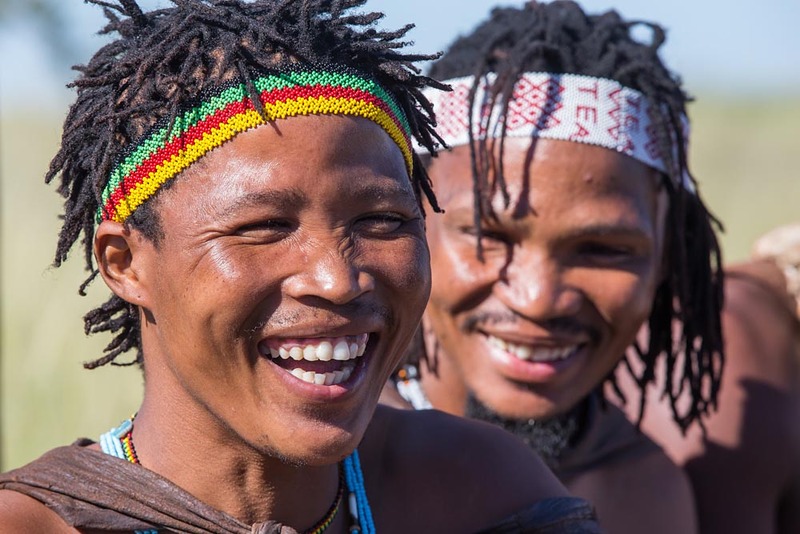 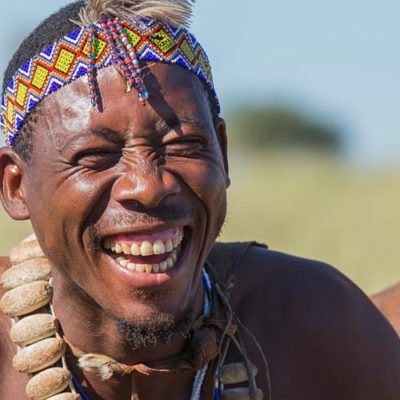 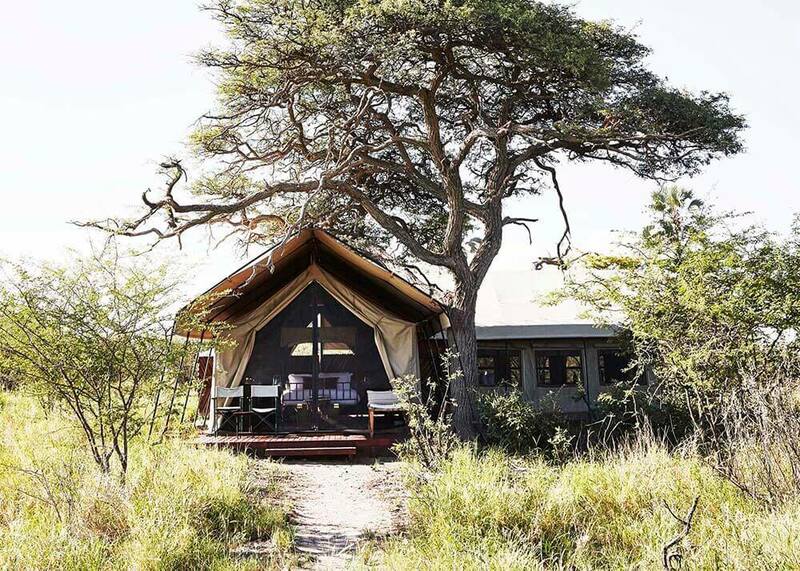 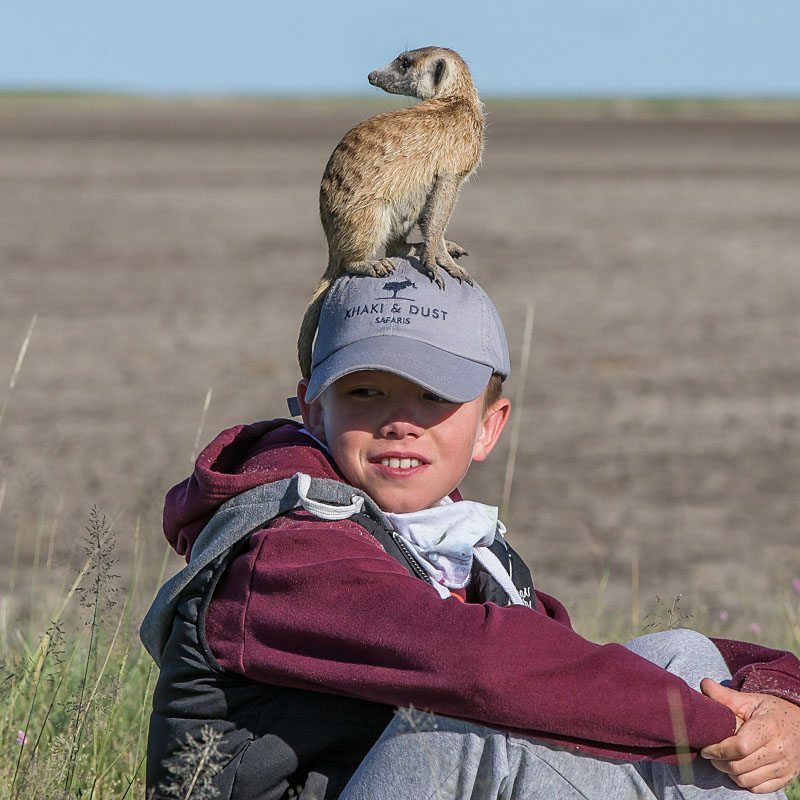 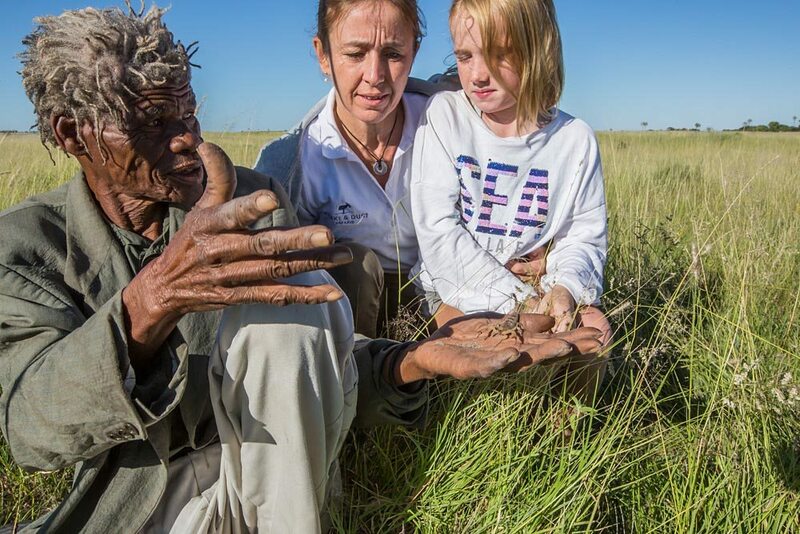 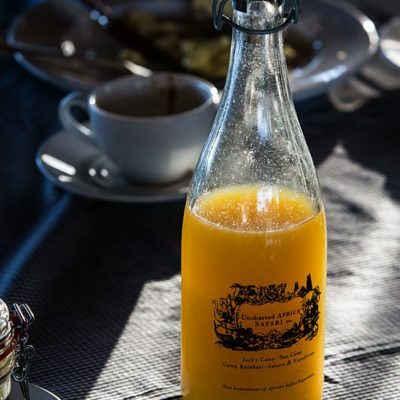 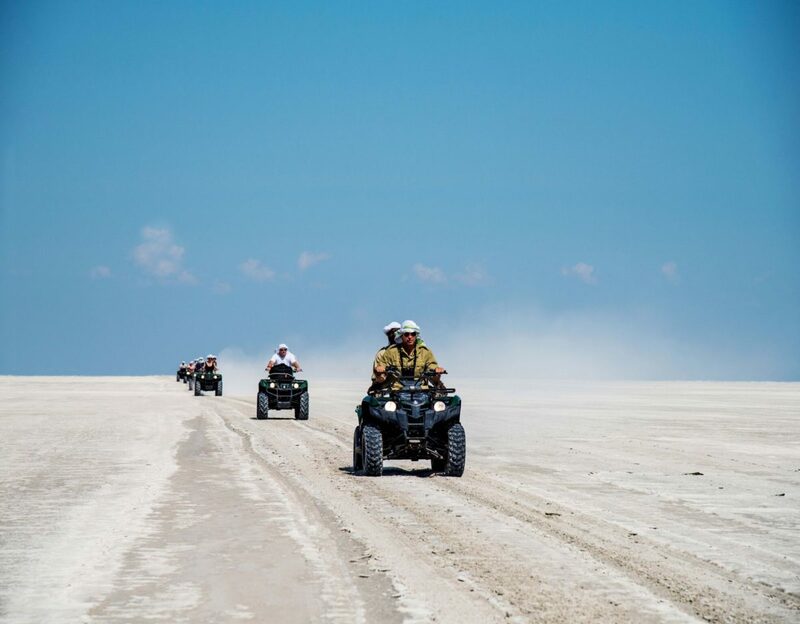 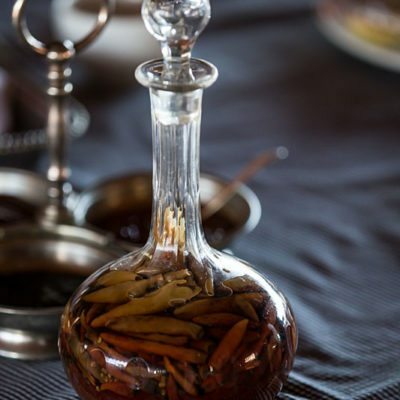 Needless to say, we do enjoy the charm of the older camps which reflect the history of the first safari pioneers that set up camps like Mapula in challengingly remote areas. 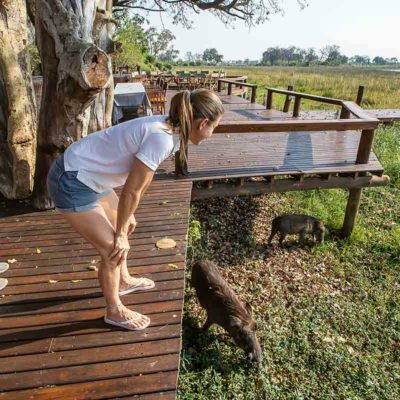 Try and time your visit with the flood so you can get on the water at Mapula. 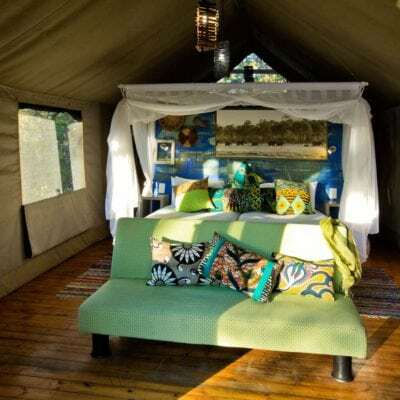 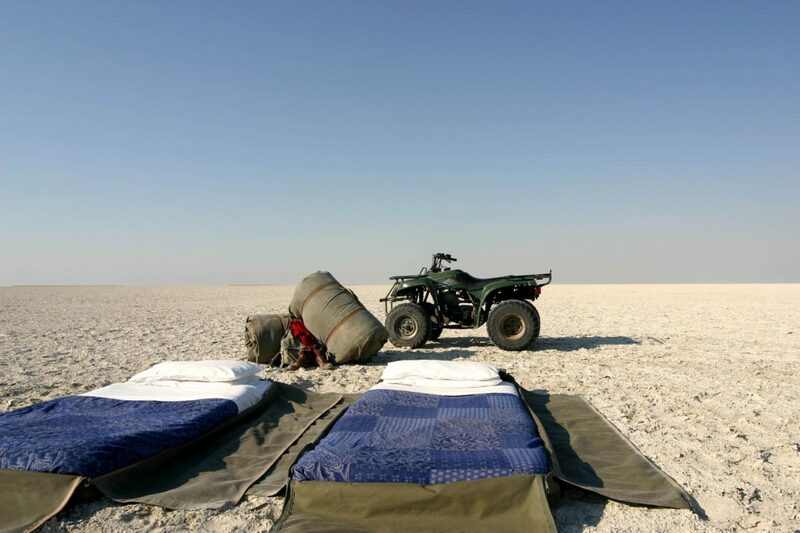 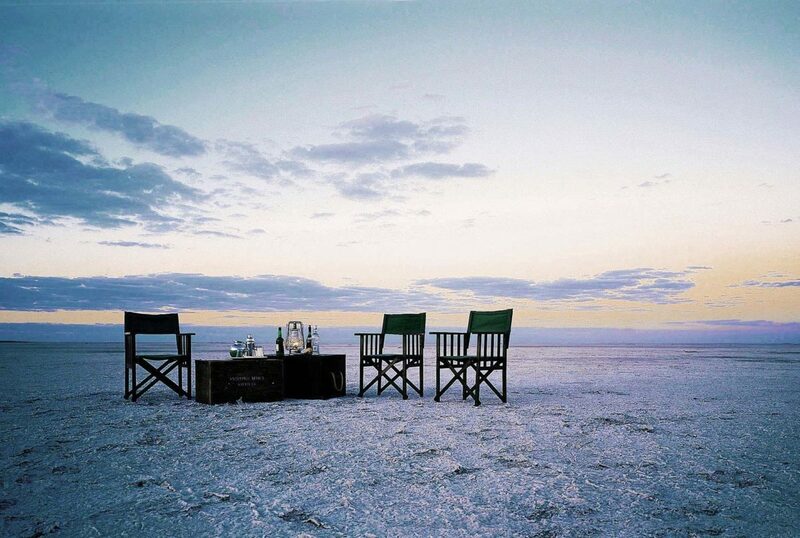 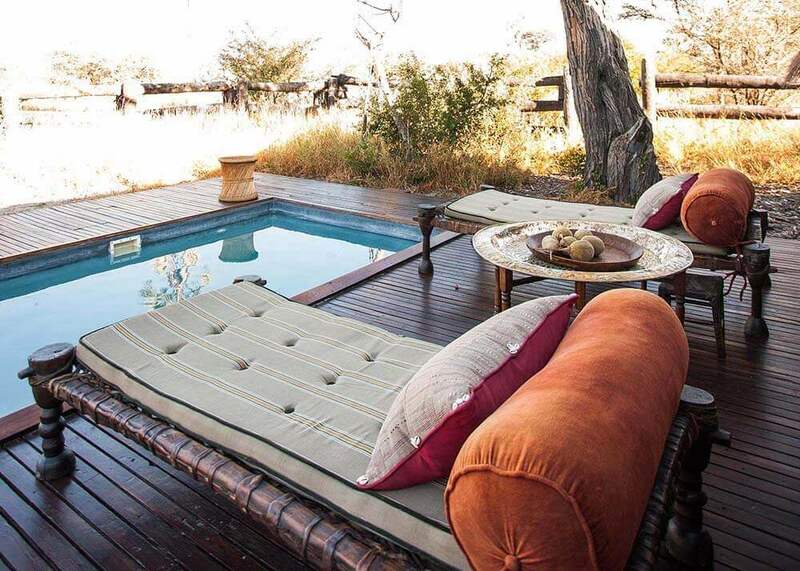 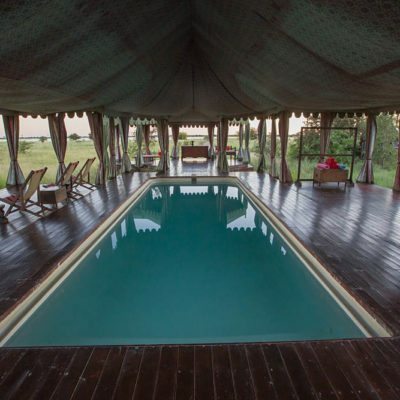 Everything is laid back here, how a safari camp should be. 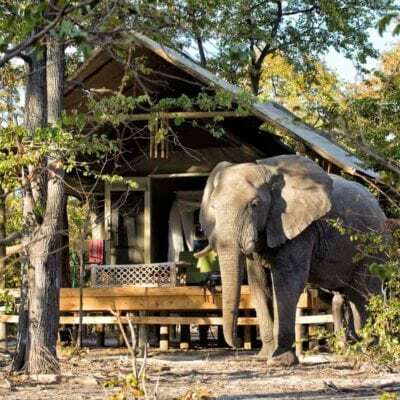 Further, the owners have more of an everyday concern for the camp, rather than falling into the more “corporate trap” of other bigger lodges.